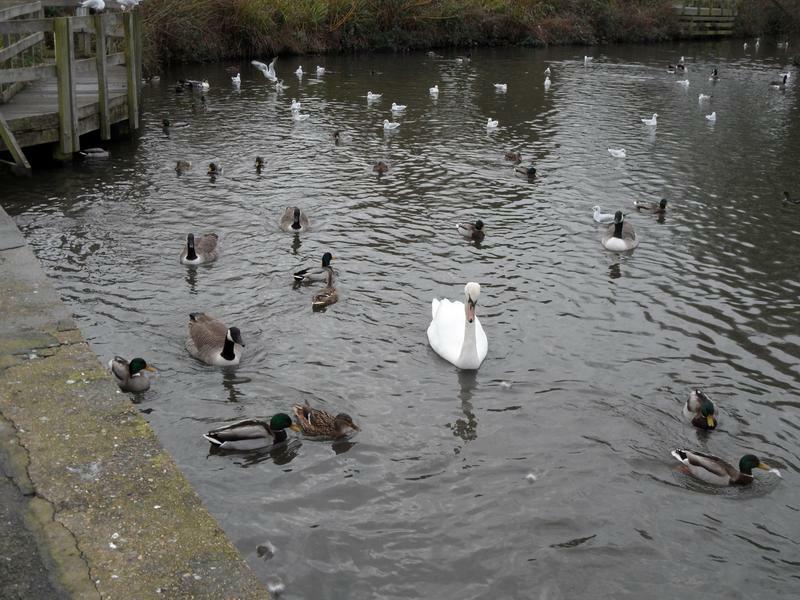 13th January 2013, a good mix of Mallards, Canada Geese, sea birds and a single swan. 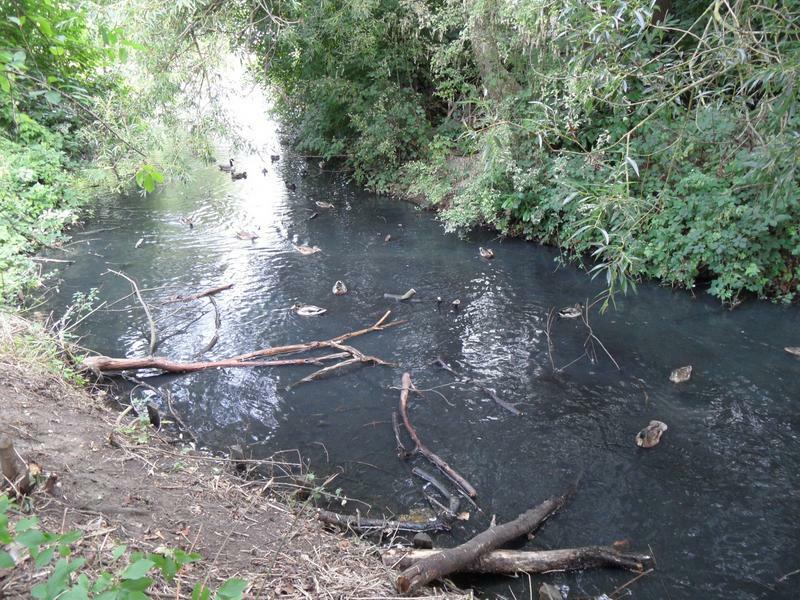 water from the pond northwards in a stream towards Kelsey Park. 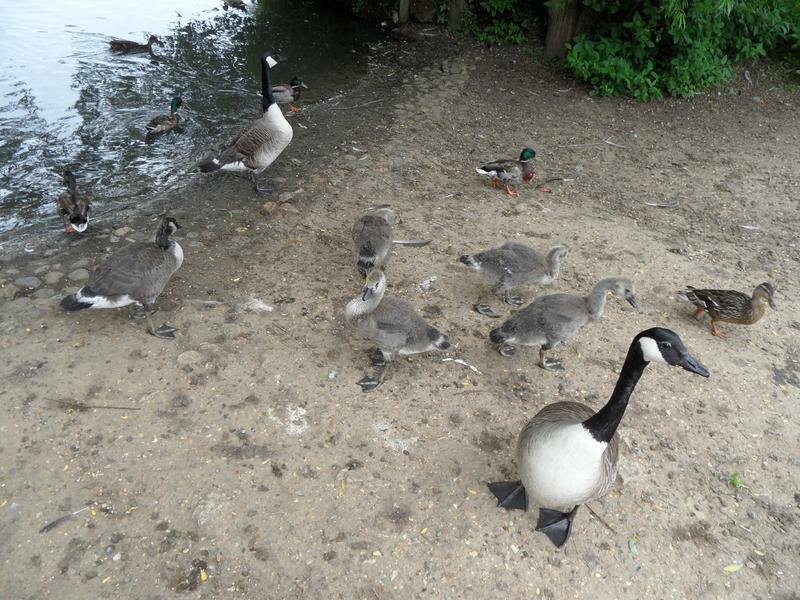 Don't think many people had been feeding them this day. 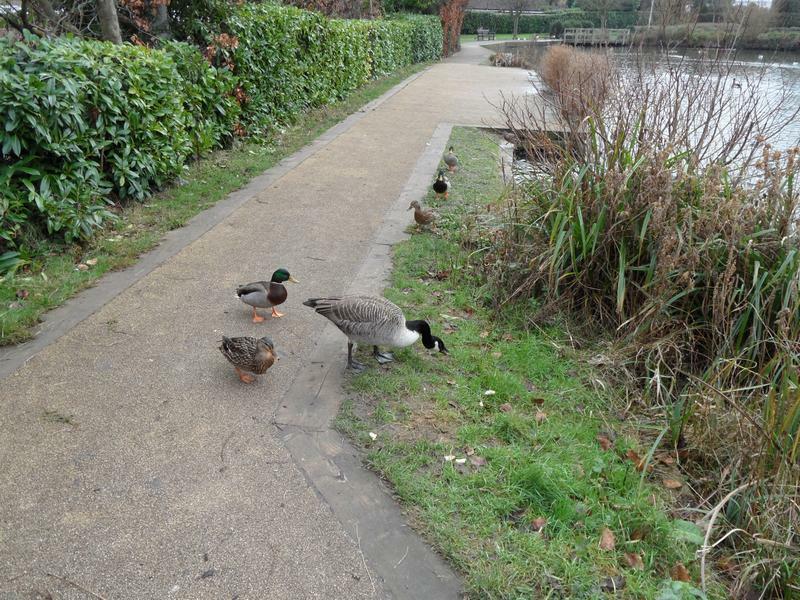 Ducks following us along this path is very unusual, there are often dogs coming around the corner. 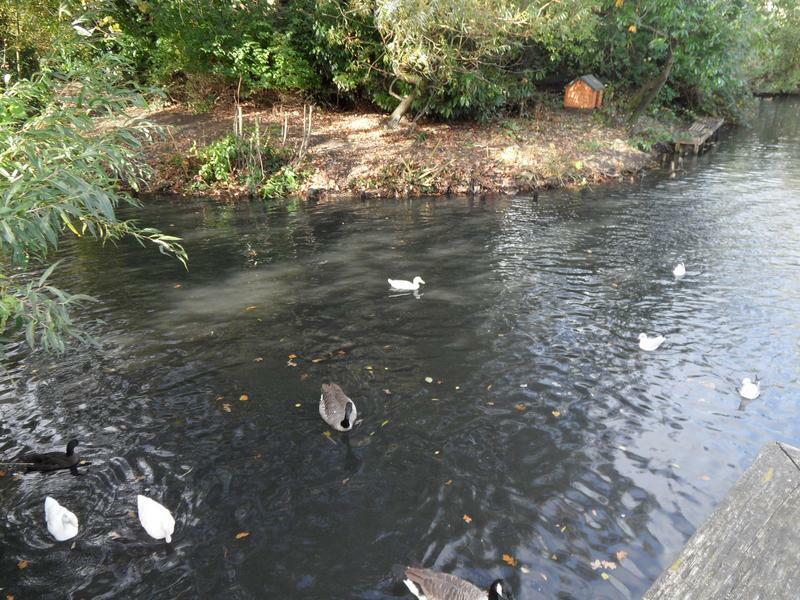 The swan is still hungry and comes out of the pond, they are eating small duck pellets. 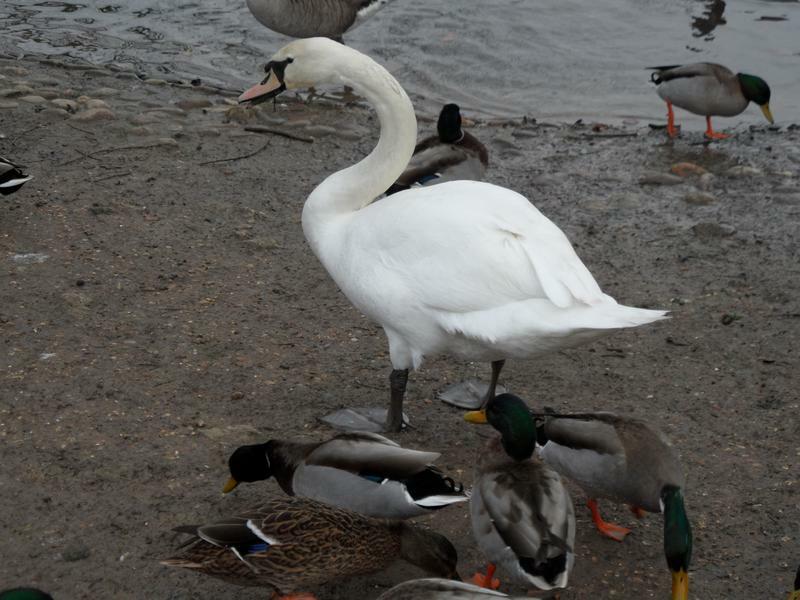 Fortunately the swan is not aggressive today, often you have to keep a distance. 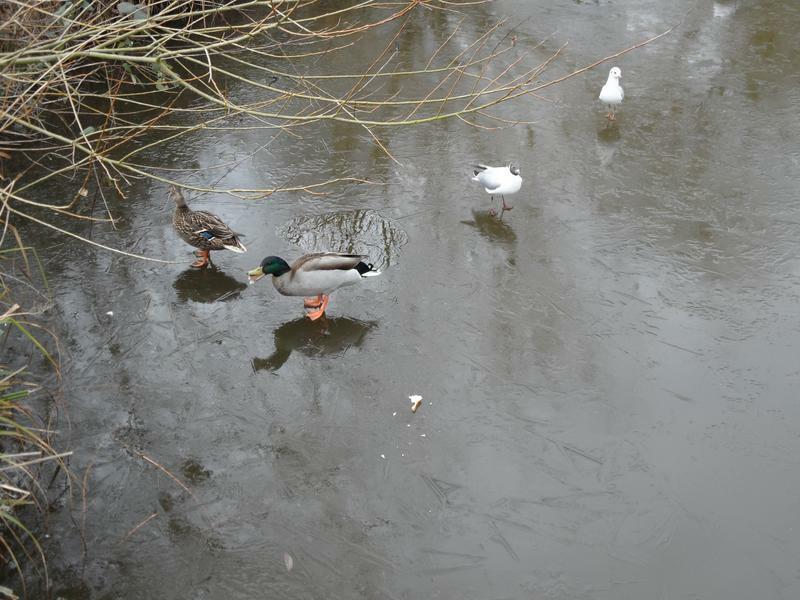 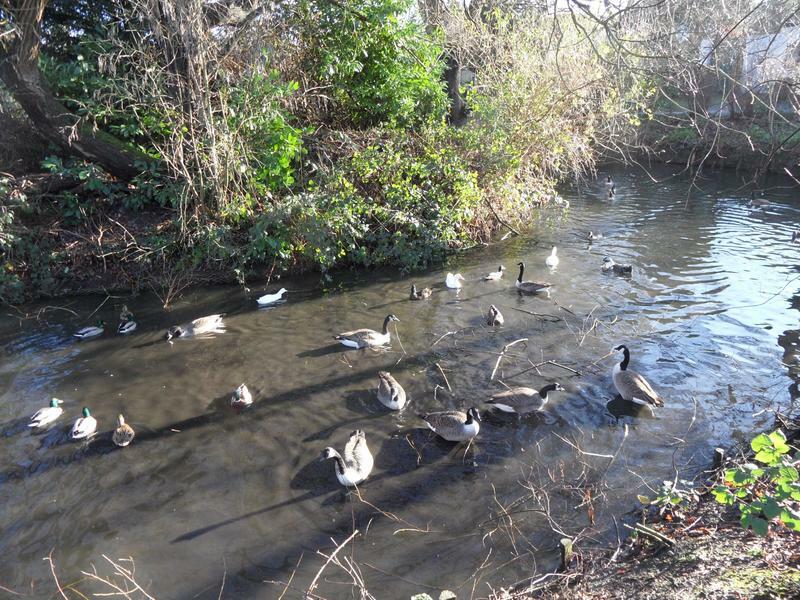 27th January 2013, everyone seems to have gone on holiday, somewhere, very few water fowl to feed today. 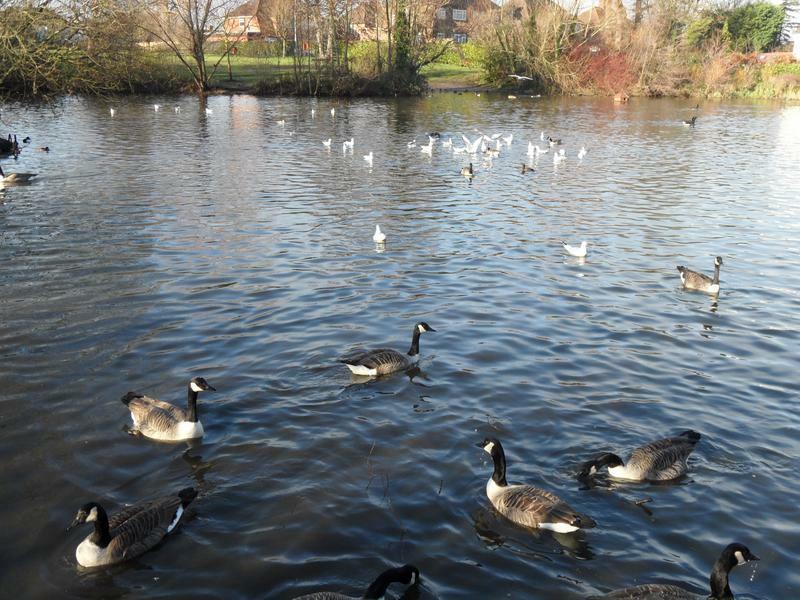 9th February 2013, and it's business as usual, still too many noisy sea birds. 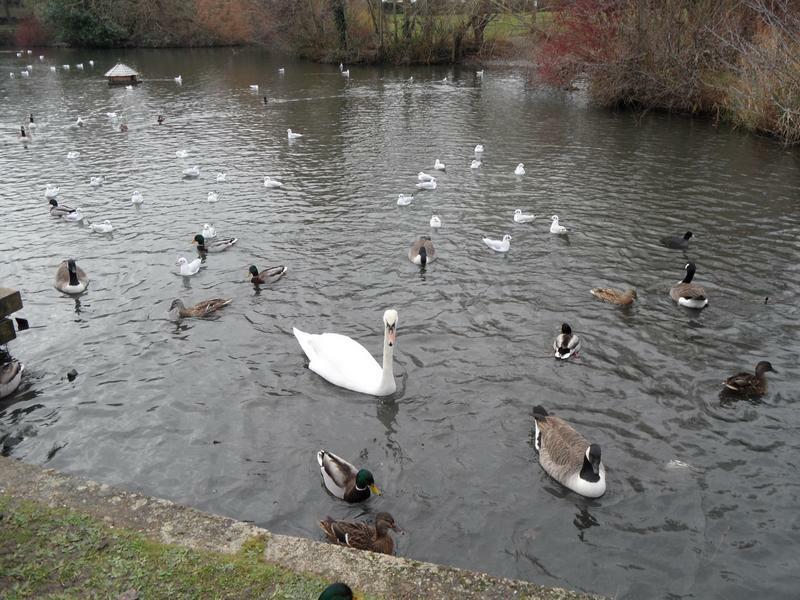 The swan has gone, not seen him again. 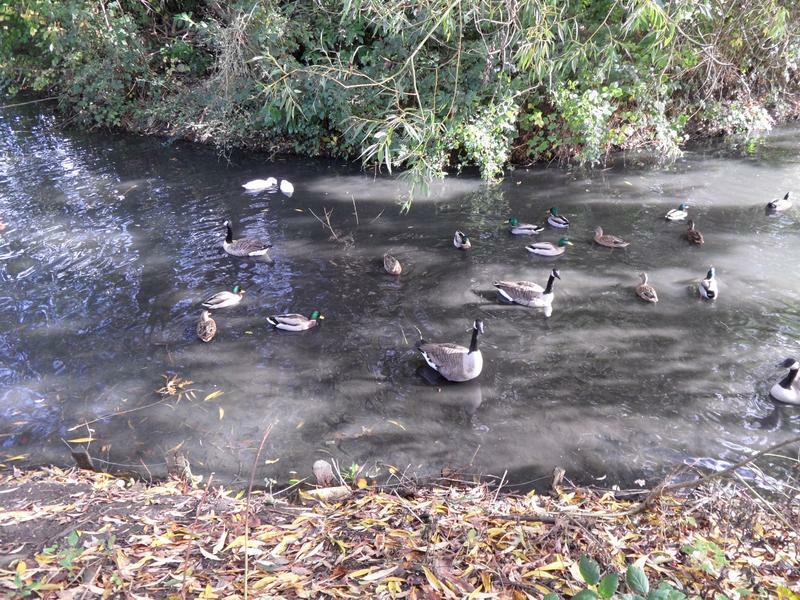 Most of the Mallards are around the island, leaving just geese here. 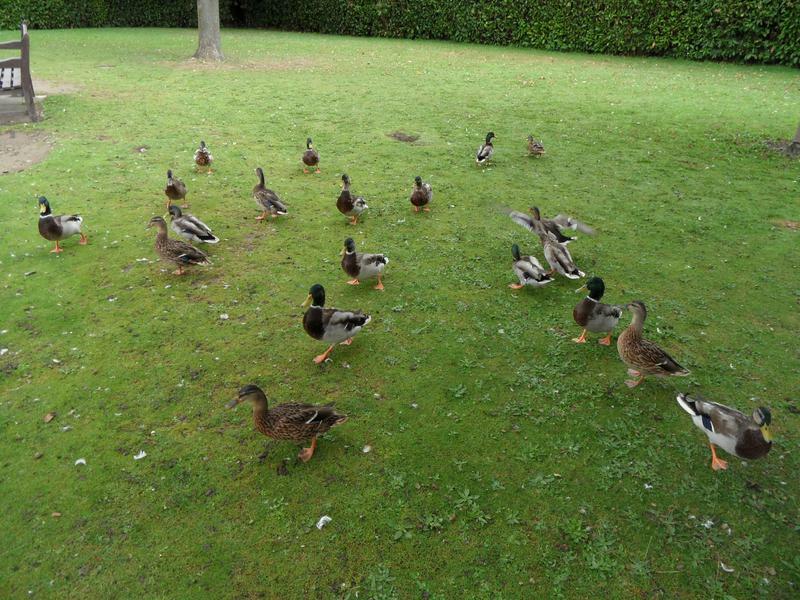 The grass is very boggy and slippery from weeks of rain, so the ducks have to come up to the path to be fed. 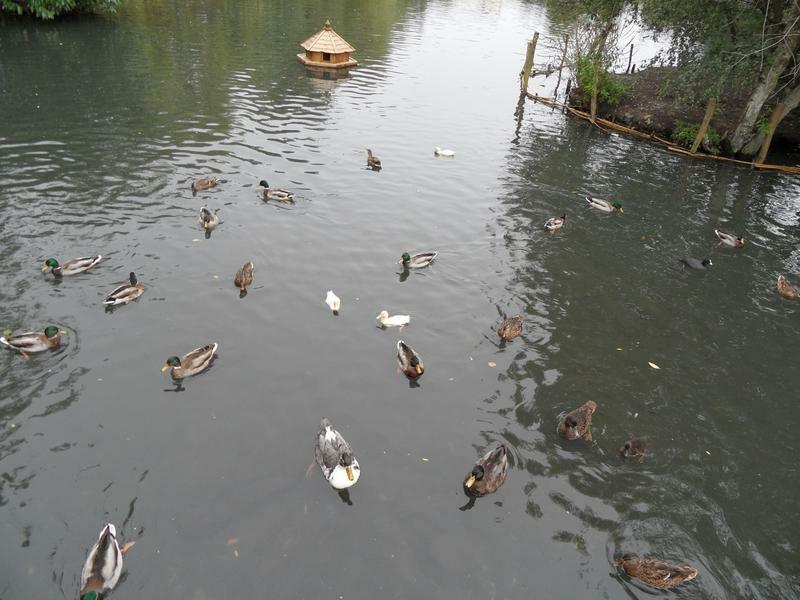 The main breeding island where nests are safe from foxes and dogs. 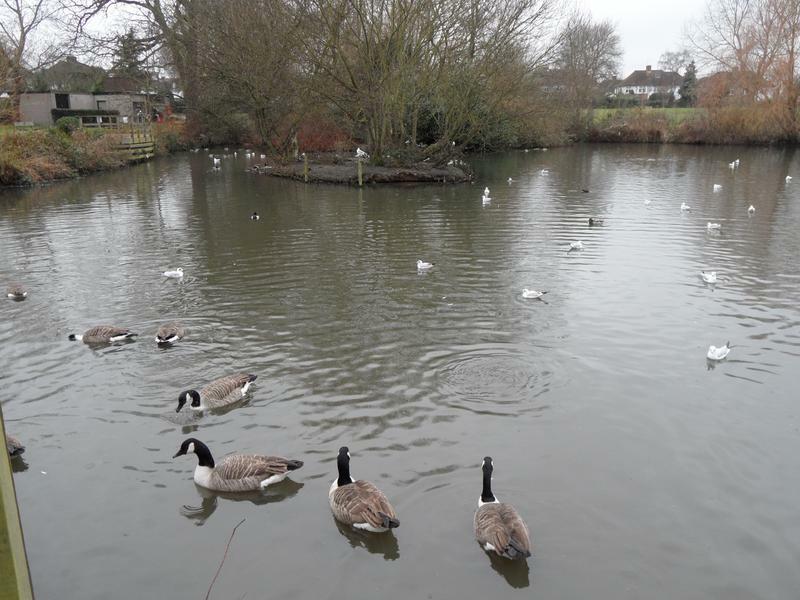 24th February 2013, lots of sea birds, not as many ducks and geese today. 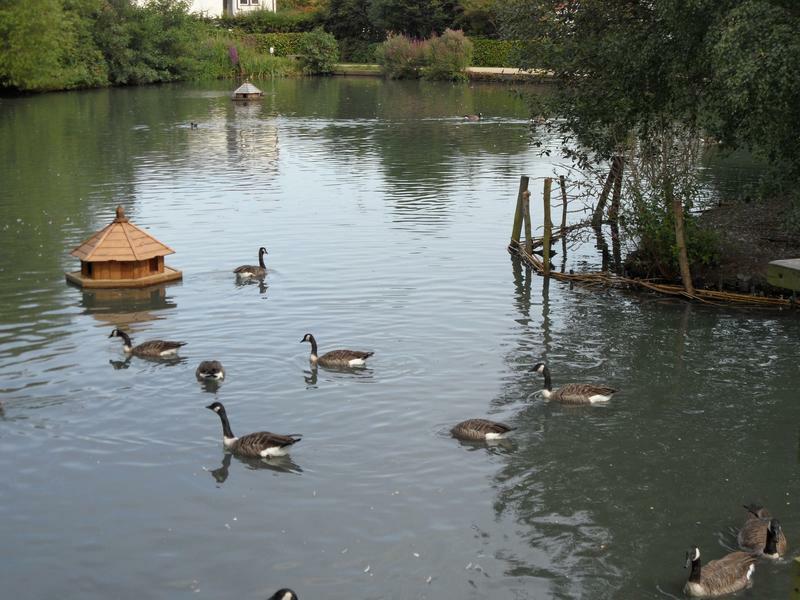 A wooden decoy duck someone has left on the pond, it moves around each week. 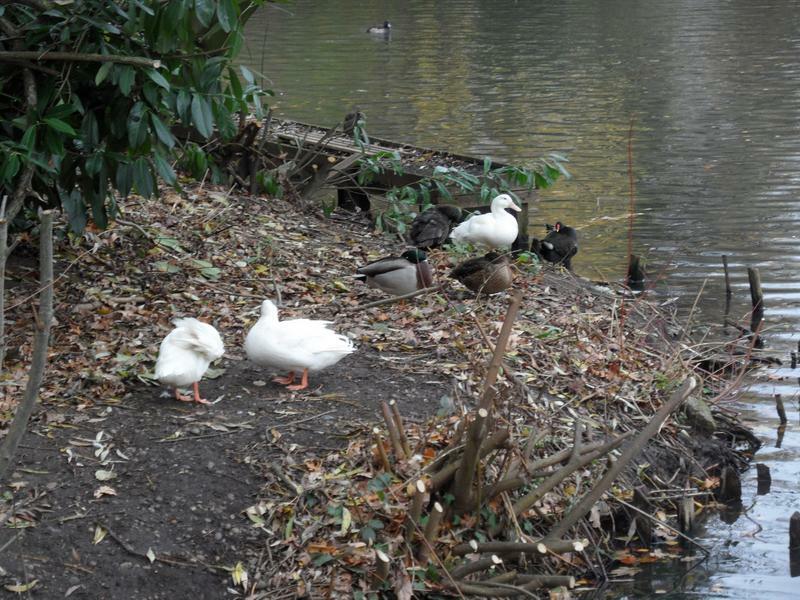 The Muscovy Duck is still here, with two strangely coloured Mallards. 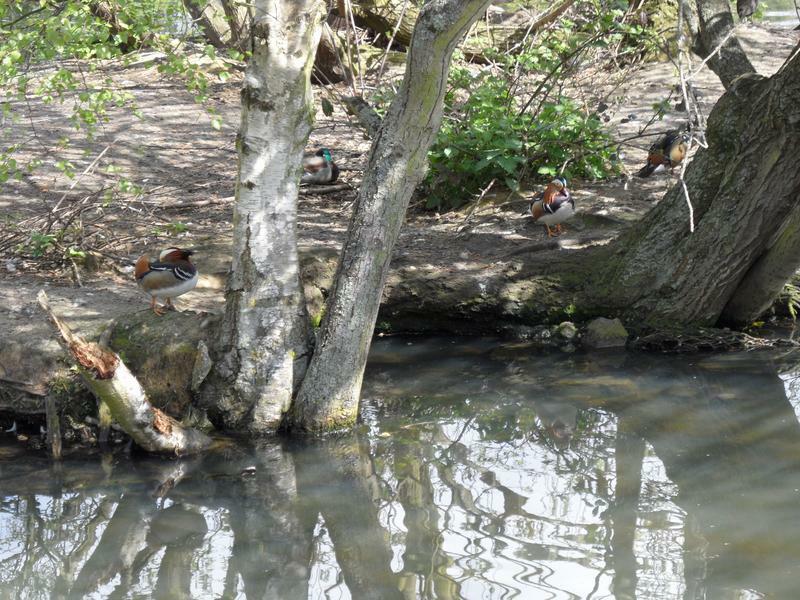 17th March 2013, a rare sight at this pond, a pair of Mandarin Ducks, female in the foreground, male watching but not eating. 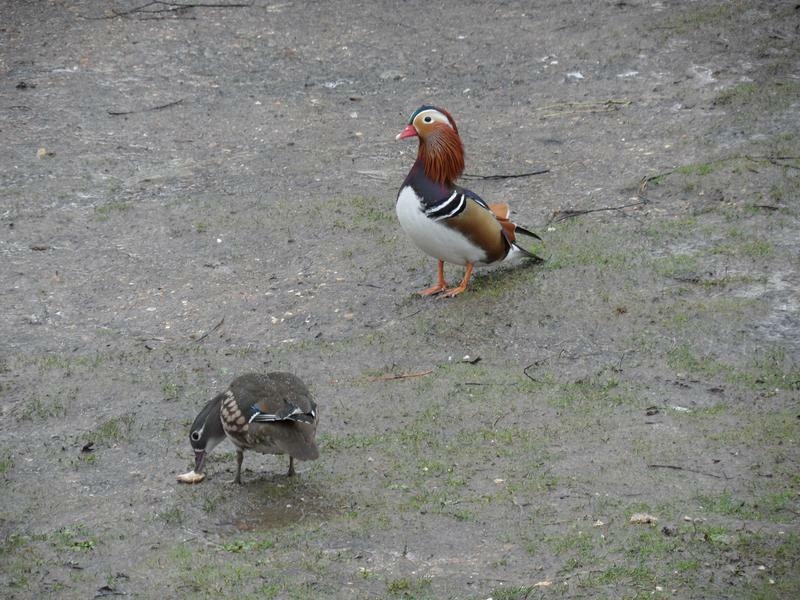 The Mandarins are both smaller than Mallards, but generally the birds don't seem that hungry today. 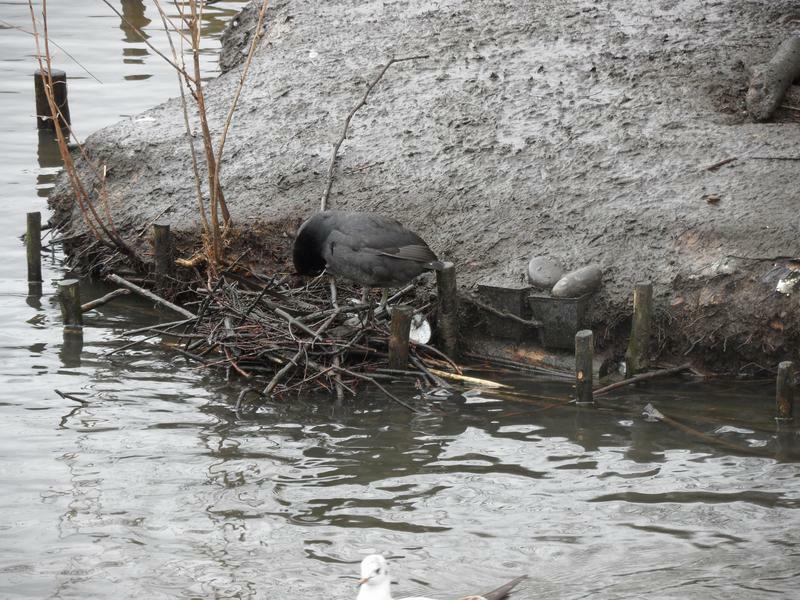 17th March 2013, the Coot is already building her nest, she starts early and may have two or three clutches of chicks during the season. 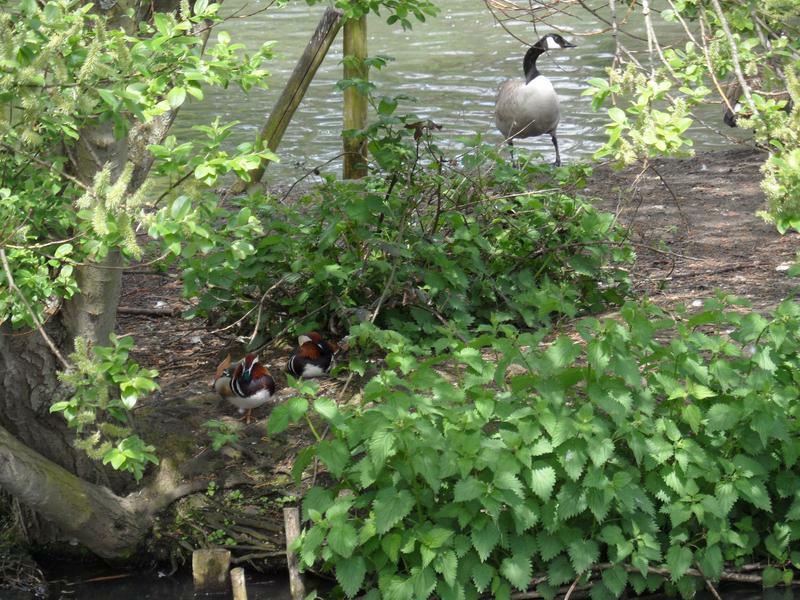 The female Mandarin is now on the small island, perhaps thinking about a nest as well. 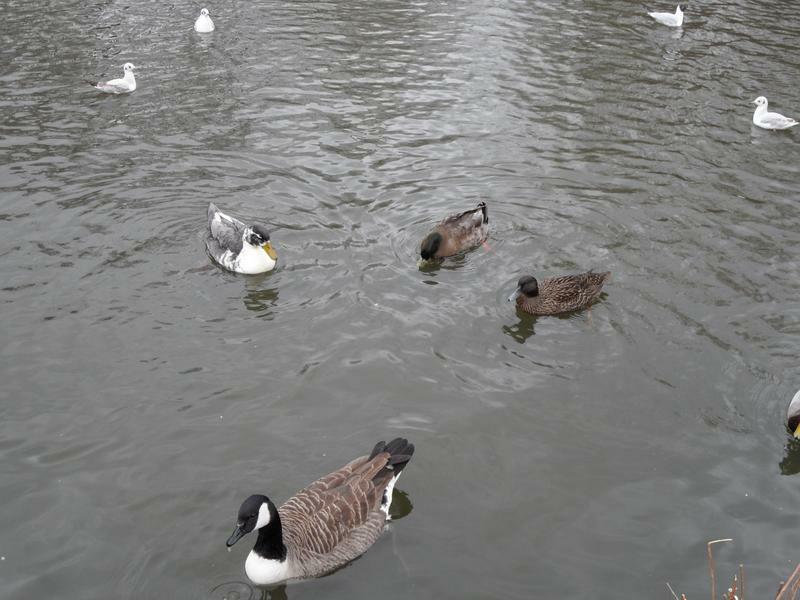 and easier for the sea birds to steal their food. 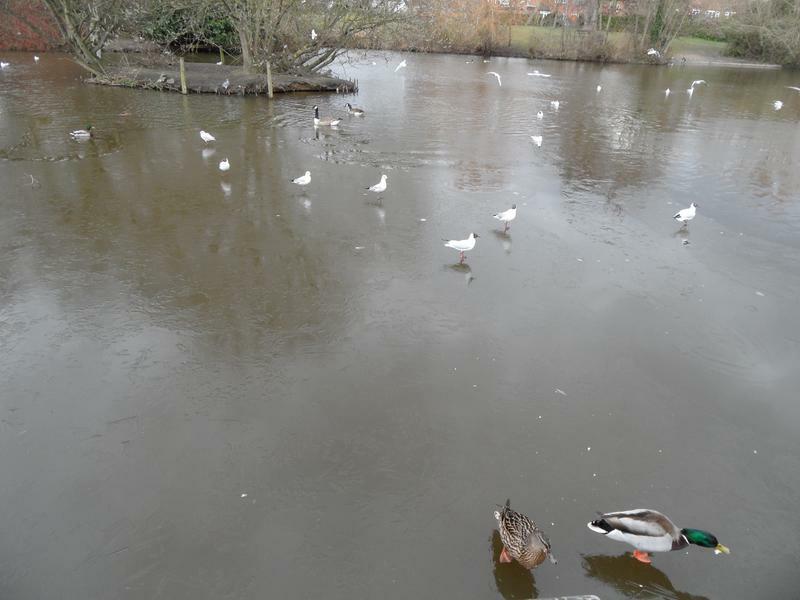 The ice covers about a quarter of the pond, but does not last long under the weight of ducks and geese, it finally sinks. 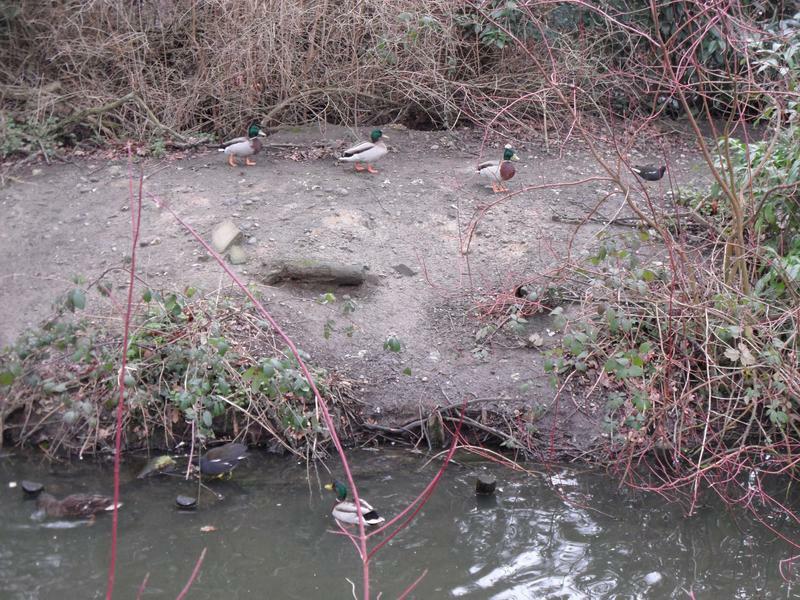 Always see one pair of Mallards in this corner, probably near a nest. 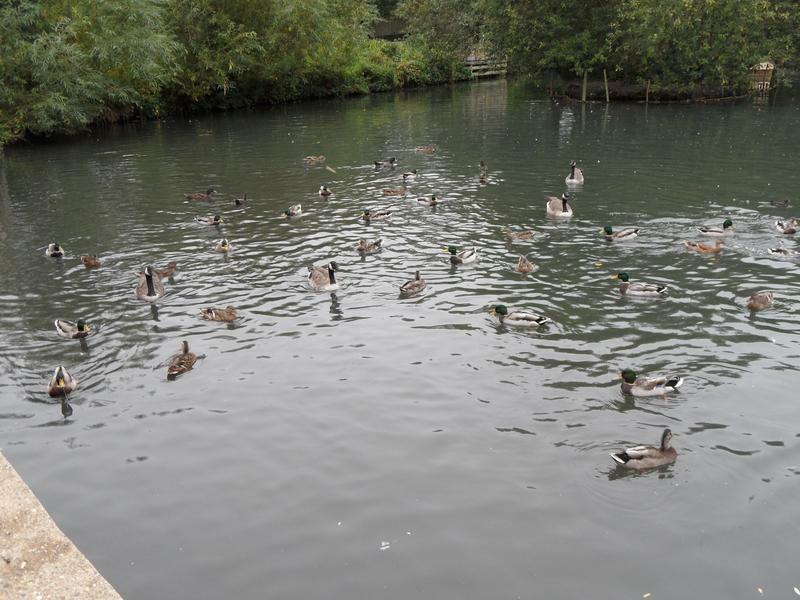 Clear water over here, but not that many ducks or geese. 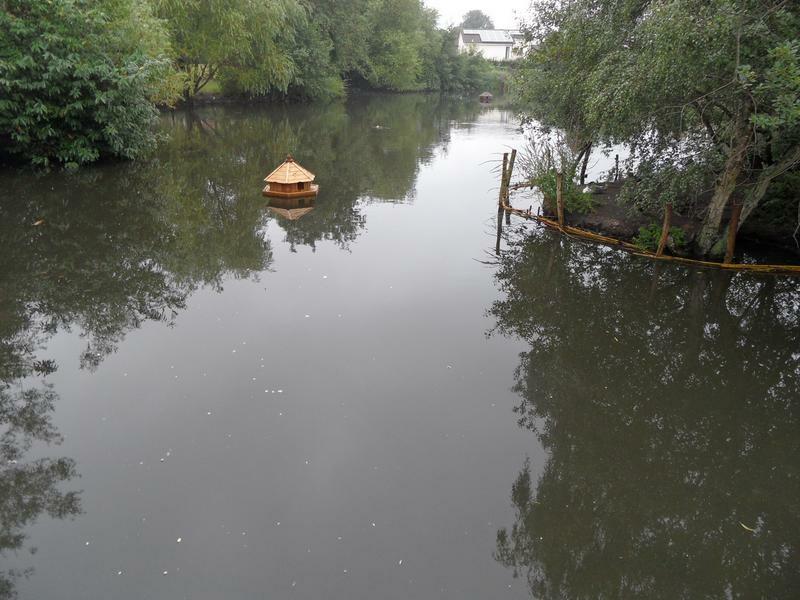 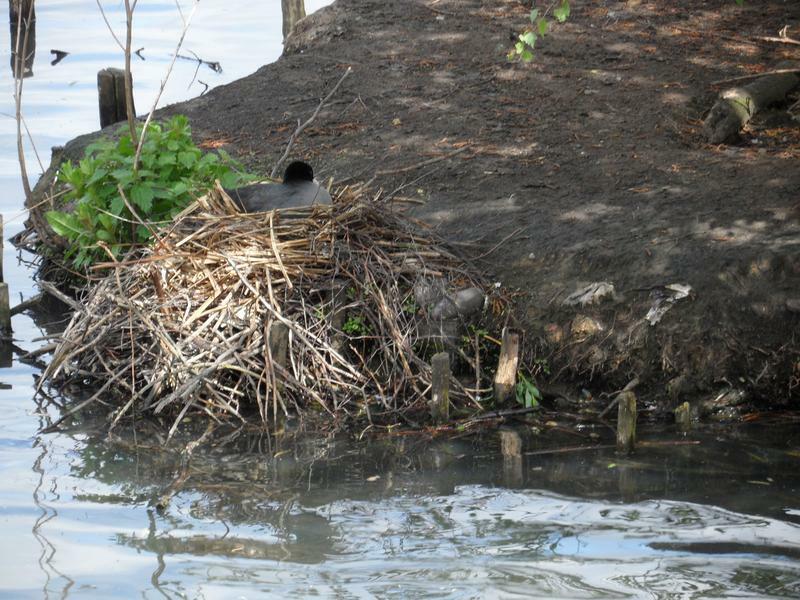 The new Coot nest, but that is a Moorhen behind it. 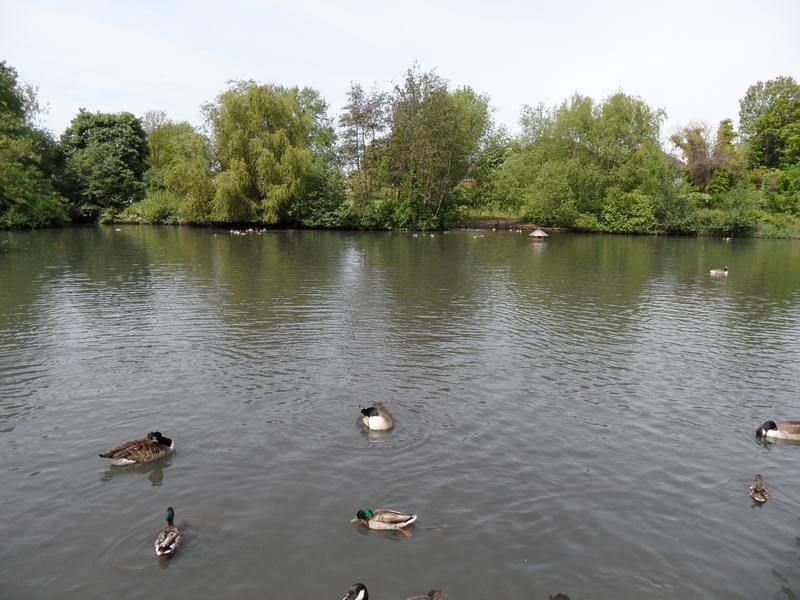 Good view of the other side of the small island. 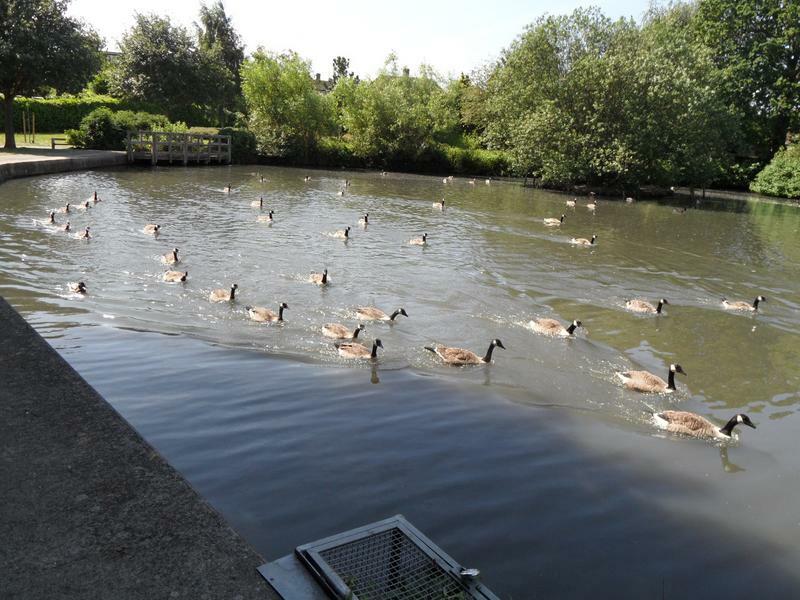 Hungry geese heading our way for food. 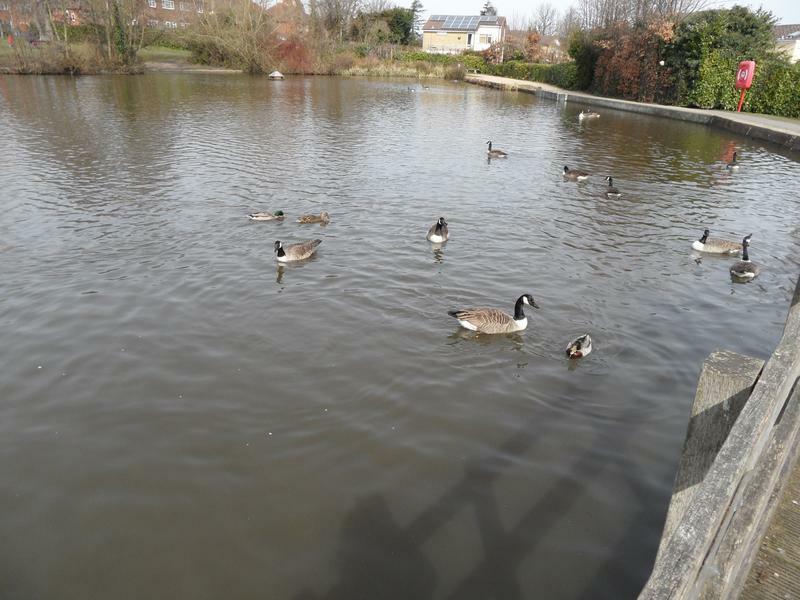 7th April 2013, weather is a little warmer, all the seabirds have flown off north, and the pond is very quiet, and no-one seems hungry. 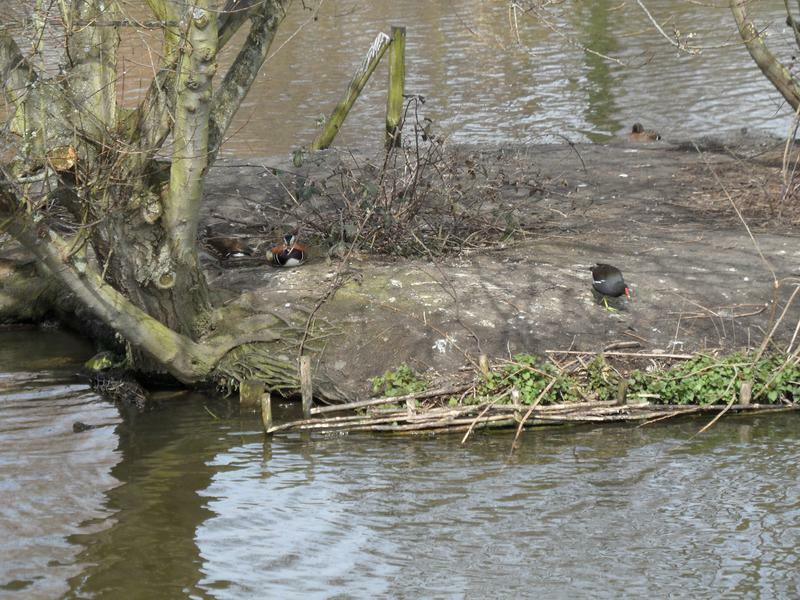 A pair of Mandarin Ducks are sitting on the small island, with a Moorhen. 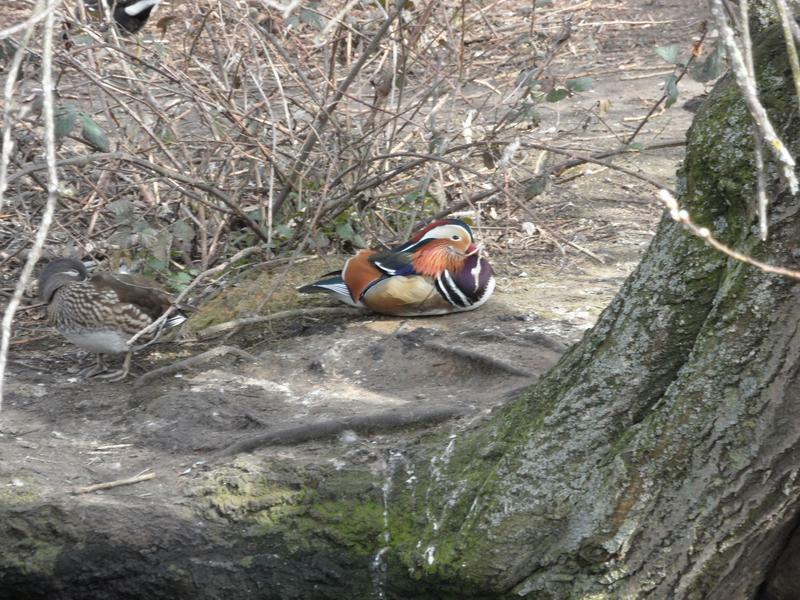 Close-up of the Mandarins, female on the left, male on the right. 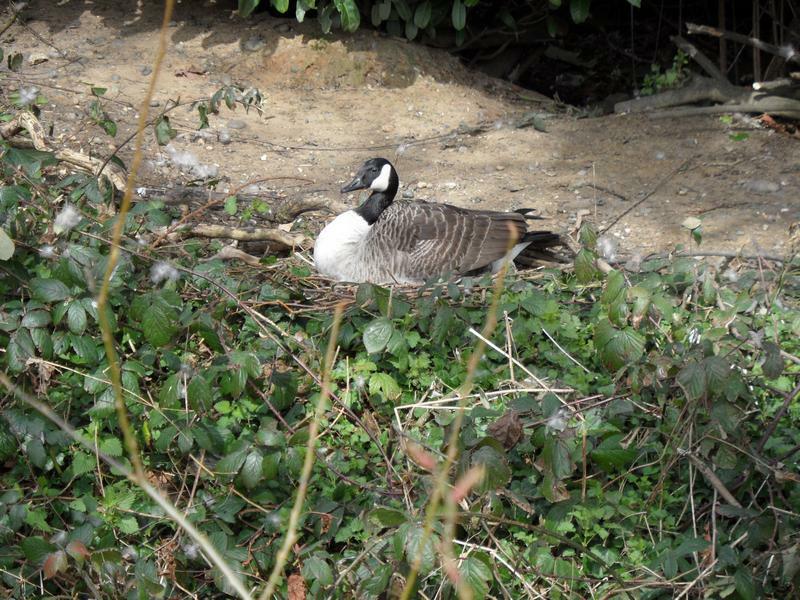 One Canada Goose is sitting on a nest on the large island. 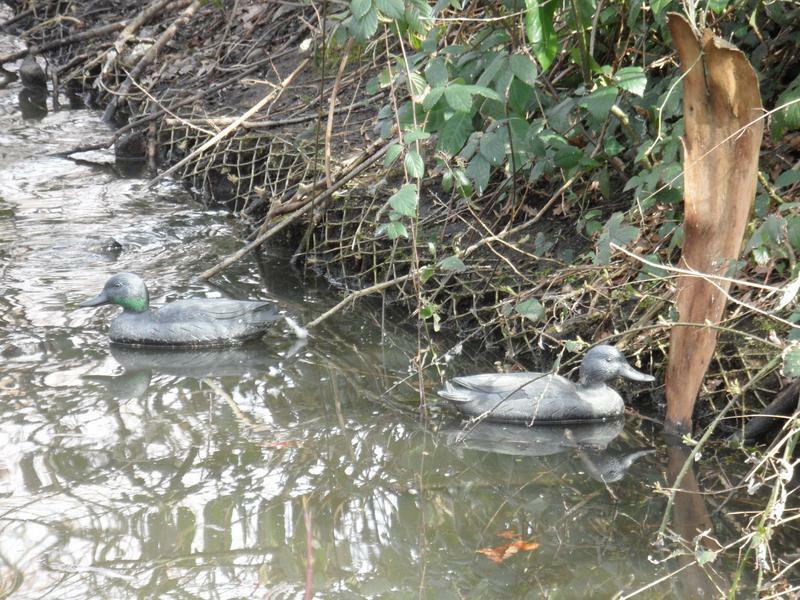 The wooden decoy ducks seems to have breeding, now two of them. 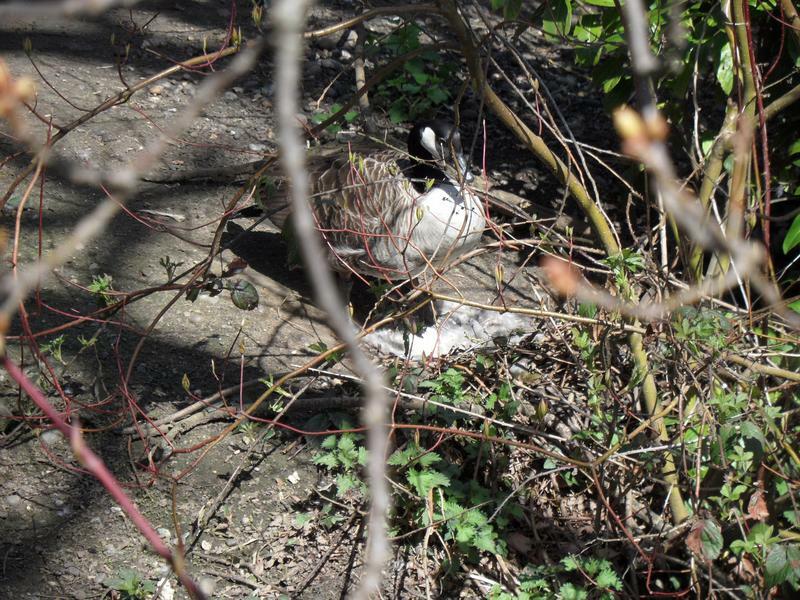 21st April 2013, the Muscovy Duck showing a lot of interest on the Moorhen nest, looked in all the entrances. 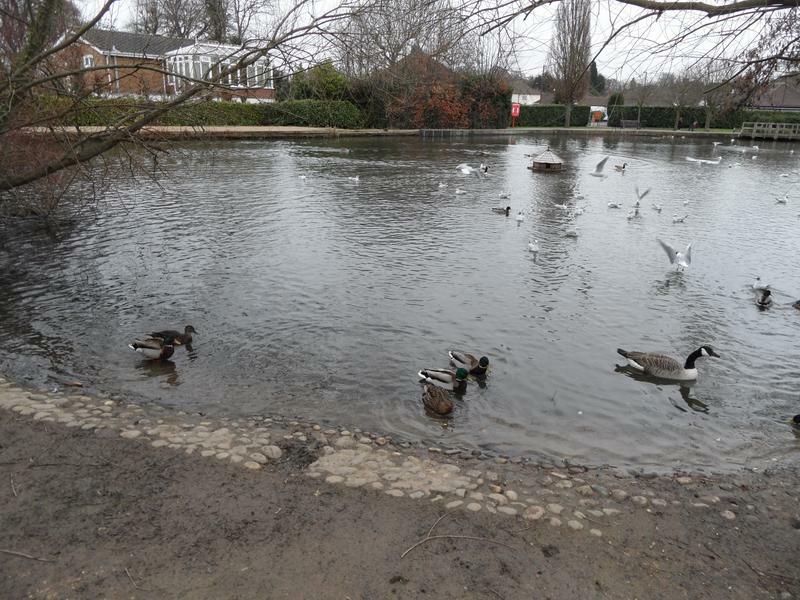 Very quiet again this week, warmer weather means more people feeding the birds, few of whom seemed hungry. 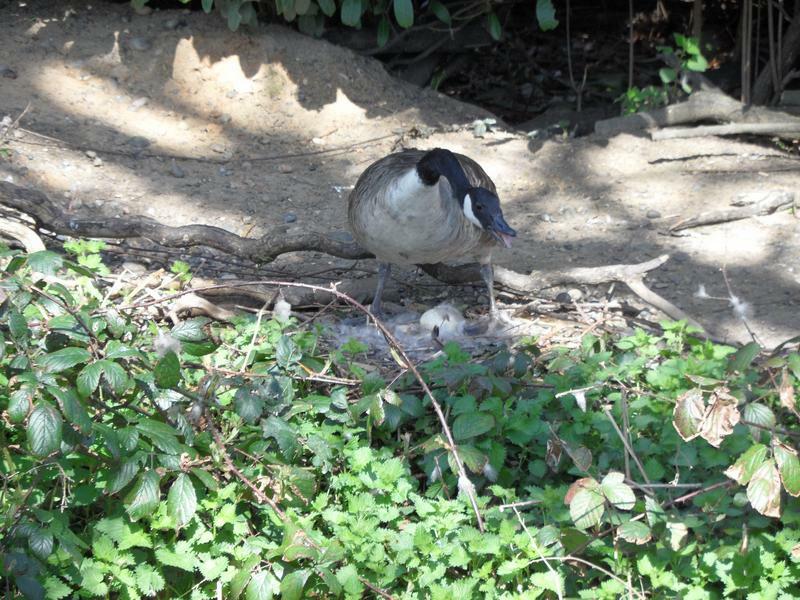 The nesting Canada Goose is still there two weeks later, with at least one large egg. 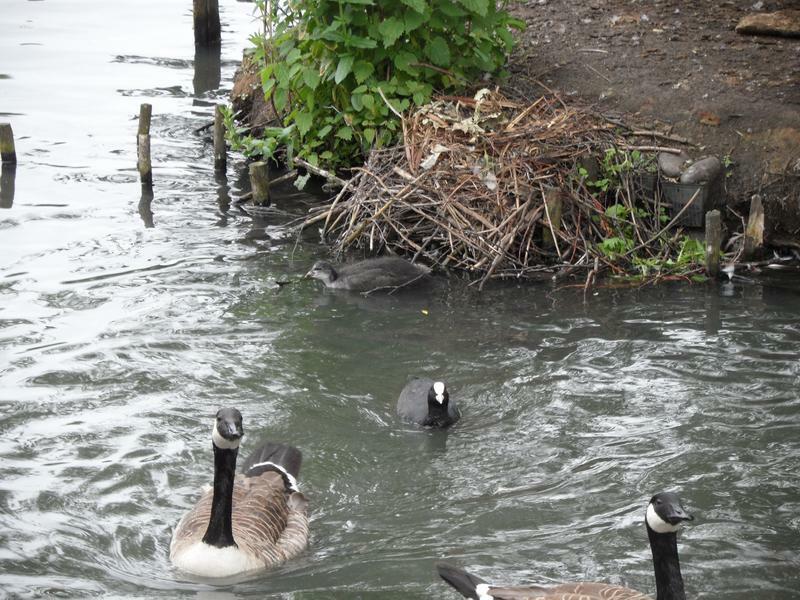 And a second Canada Goose also has a nest 10 yards away on the large island. 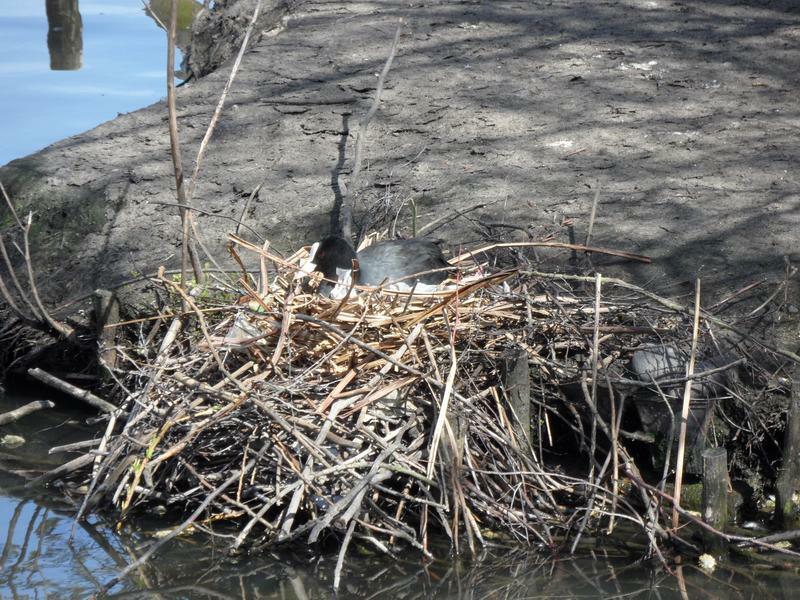 The Coot has continued building it's nest, which keeps getting taller and taller. 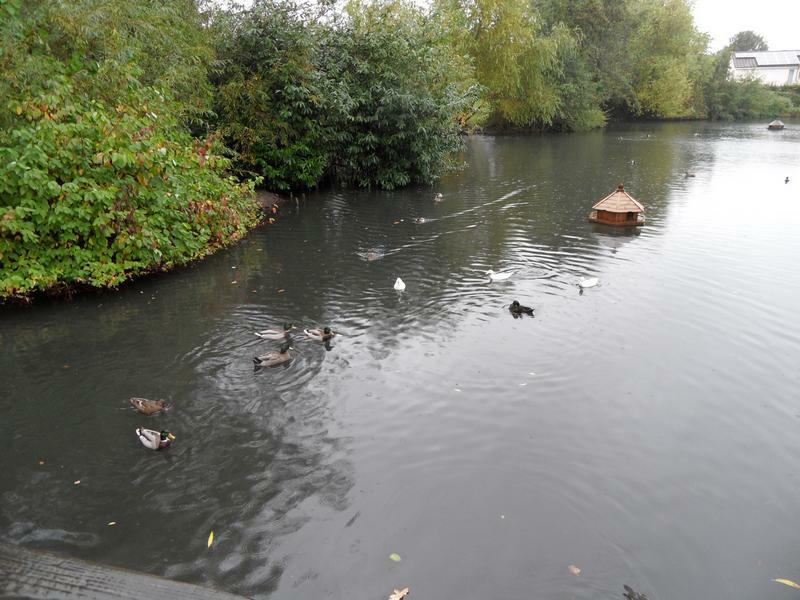 No Mandarin Ducks this week, just a few Mallards sitting on the small island, and the Moorhen in the water. 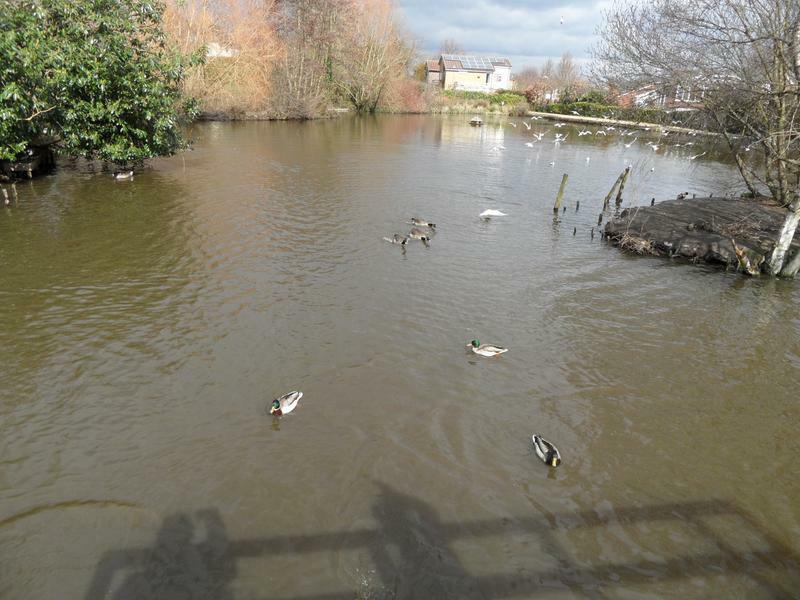 28th April 2013, the pond is relatively quiet again, not much interest in food. 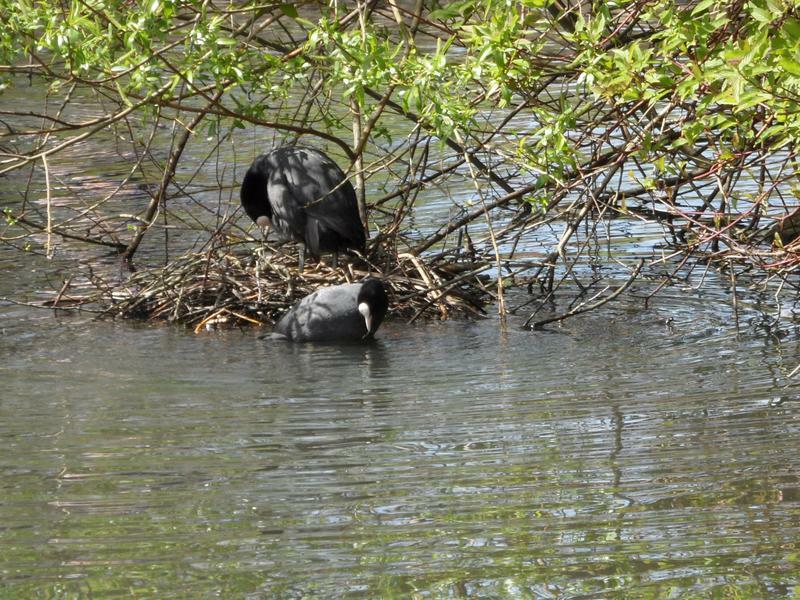 A pair of Coots are building a new nest under some branches near the beach. 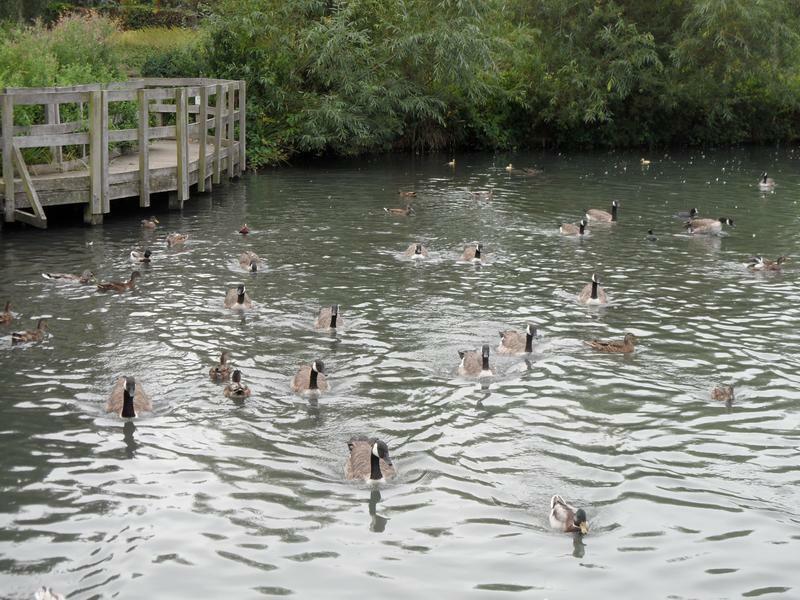 Again not great rush for food. 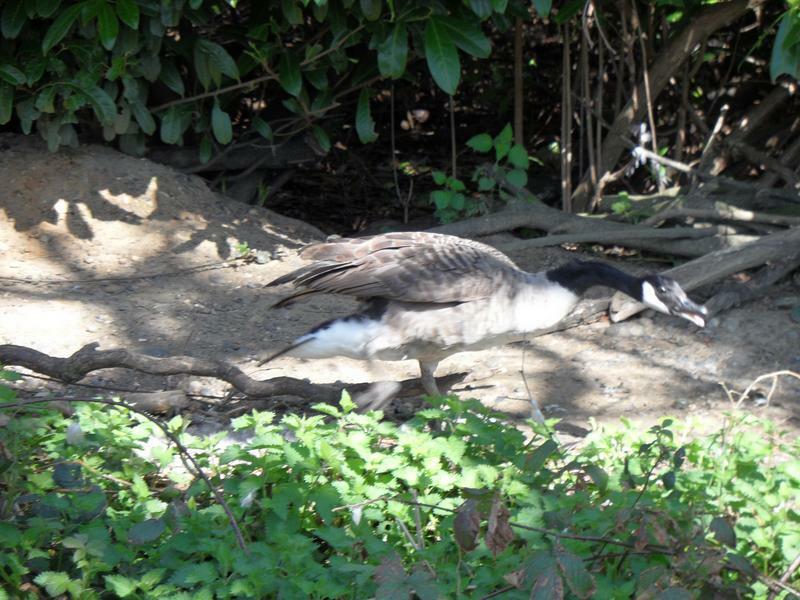 The nesting goose jumps off her nest when she sees food in the water. 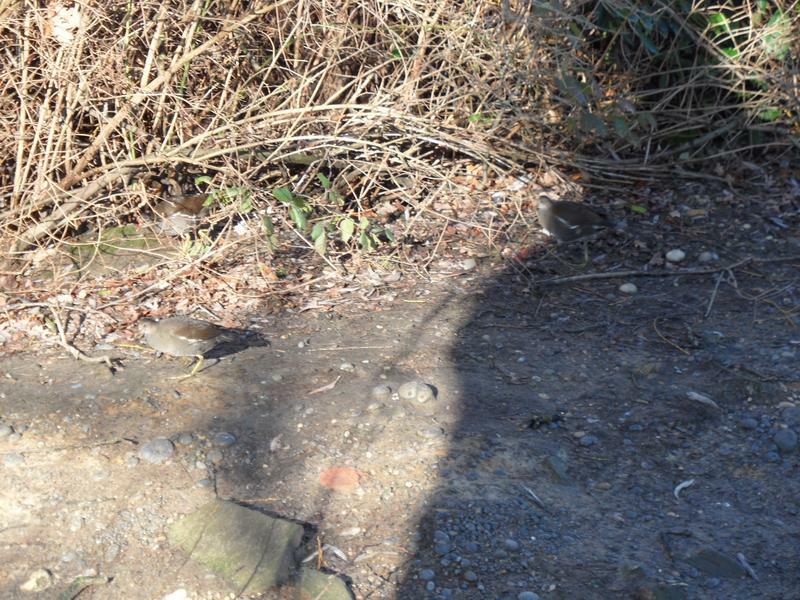 a stray egg or a stone. 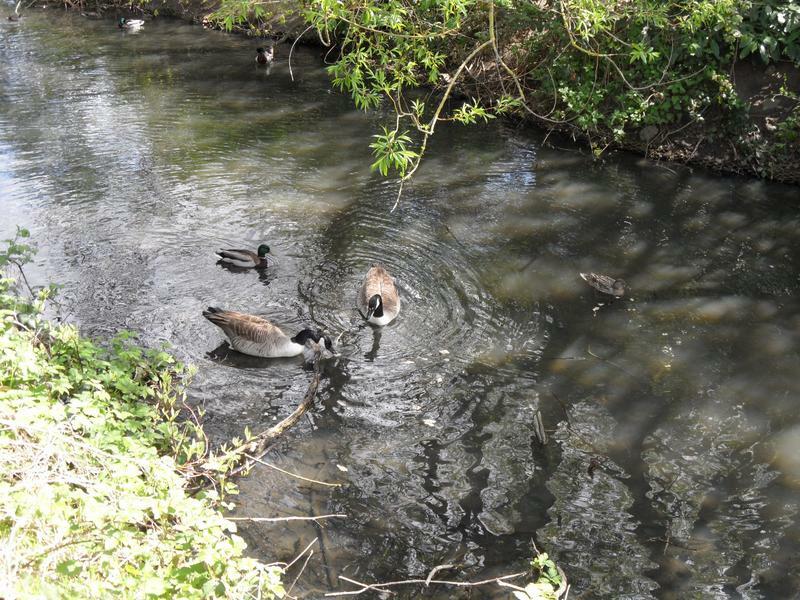 4th May 2013, very pleasant weather, the geese are all sun bathing, no rush for food. 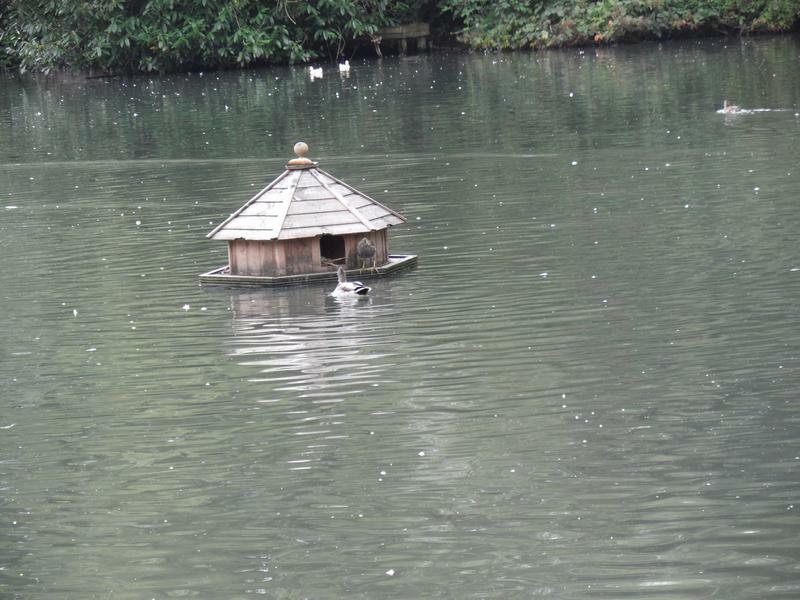 The Mandarin Ducks are back, a boy sitting on the small island. 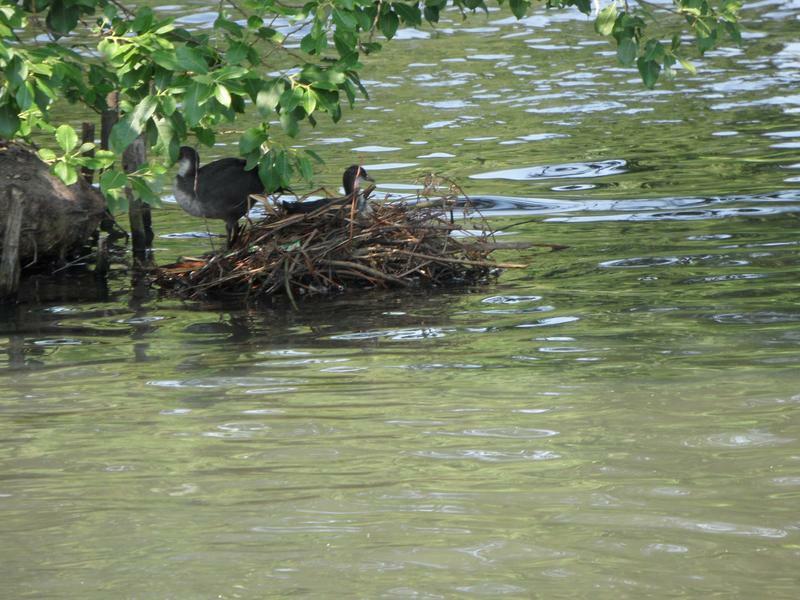 The Coot nest is getting even taller, and they added a new twig to the top while we were watching. 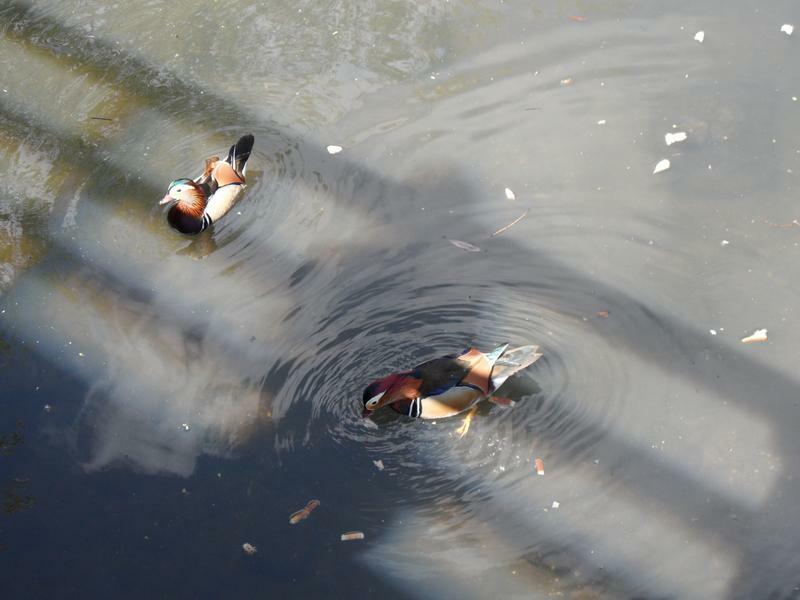 Two more Mandarin Ducks in the water. 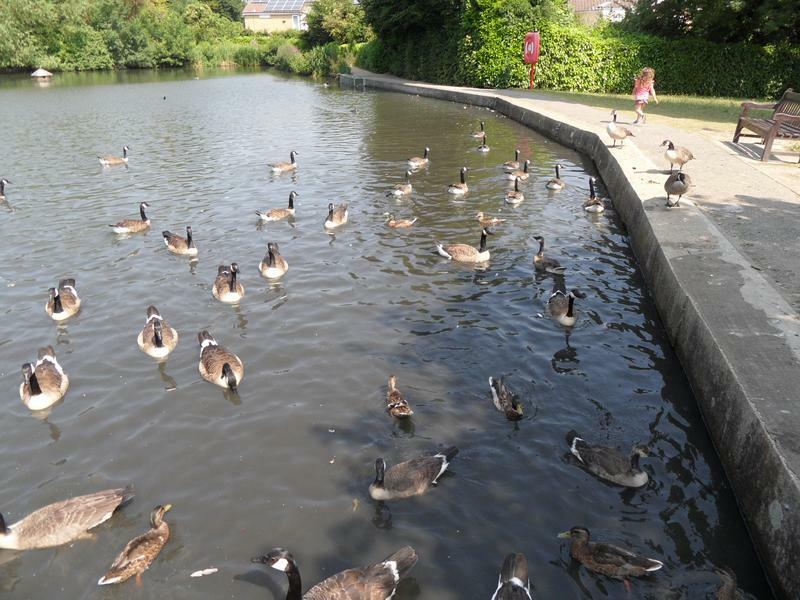 why the boys are hanging around. 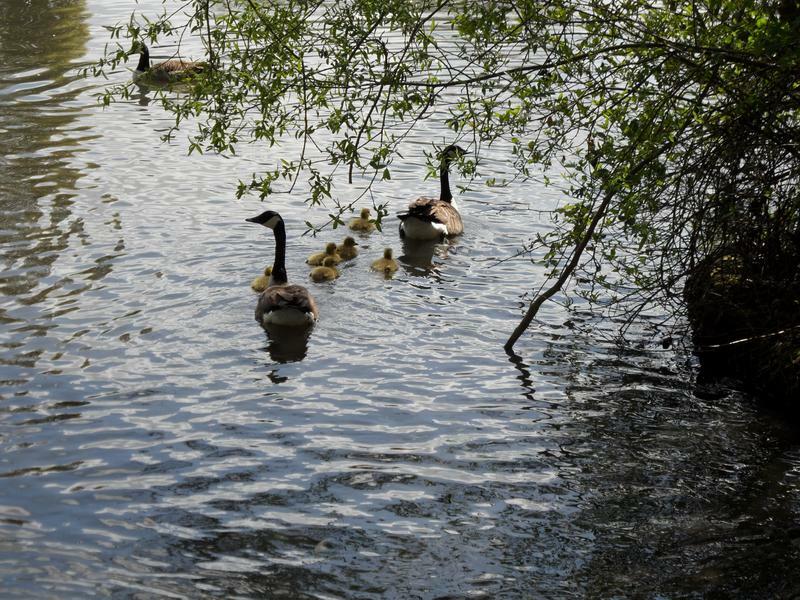 The Canada Goose has goslings in her nest, probably hatched within the last 24 hours, we only see fleeting glimpses through the leaves. 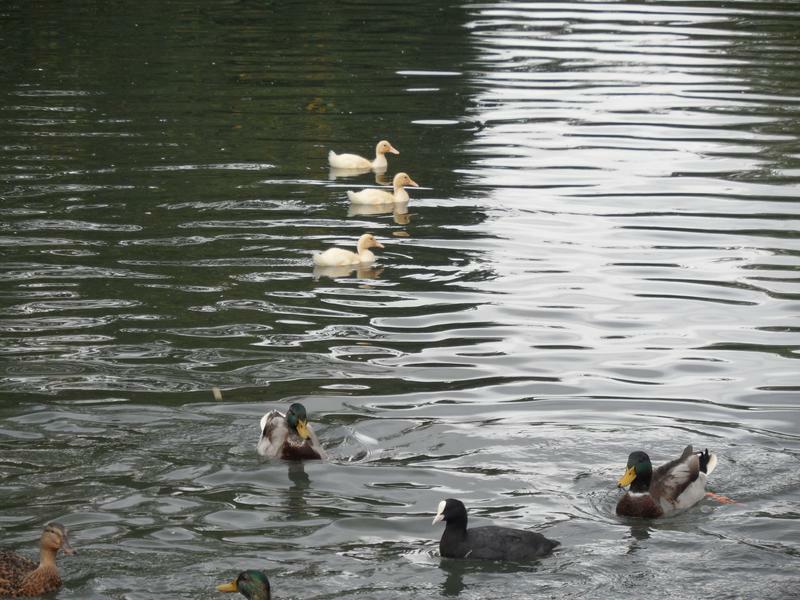 Finally find some Mallards behind the large island. 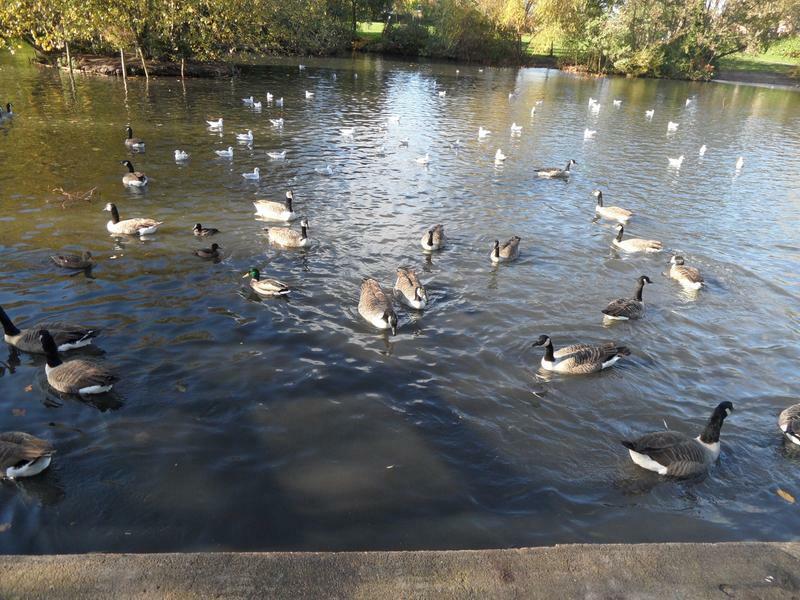 More activity at the beach, Canada Geese, Mallards, Coots and Moorhens. 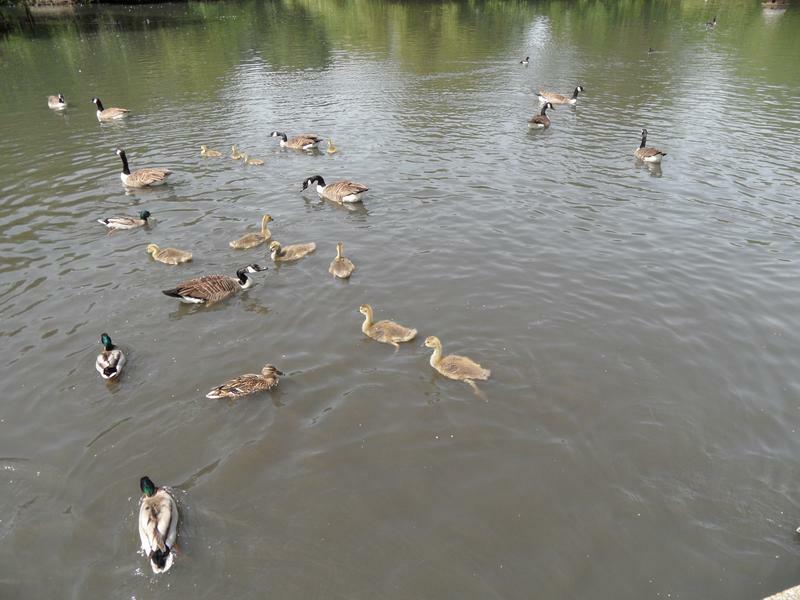 A second family of geese appear from nowhere. 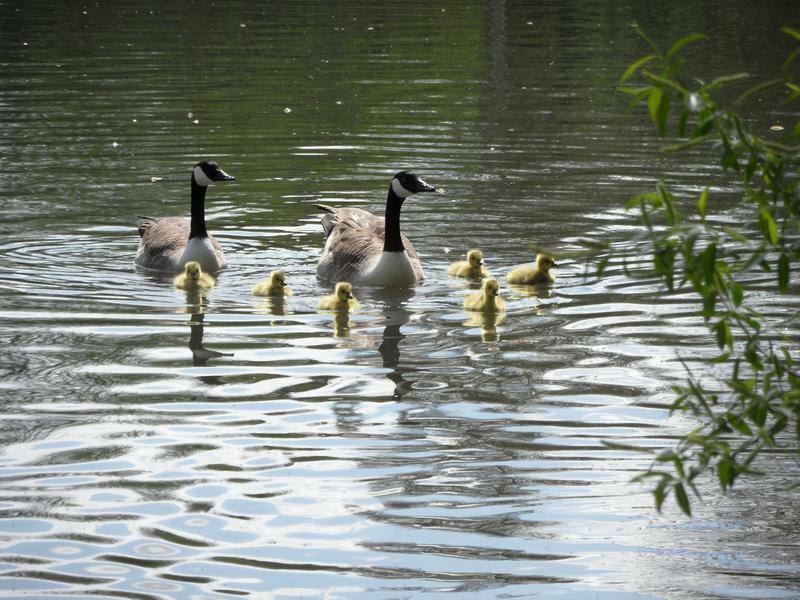 Six goslings, less than a week old. 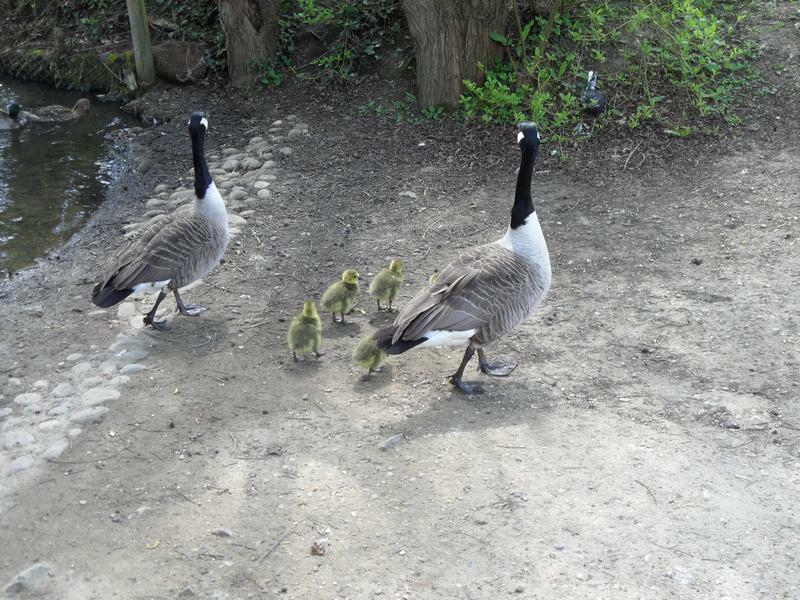 Heading up onto the beach. 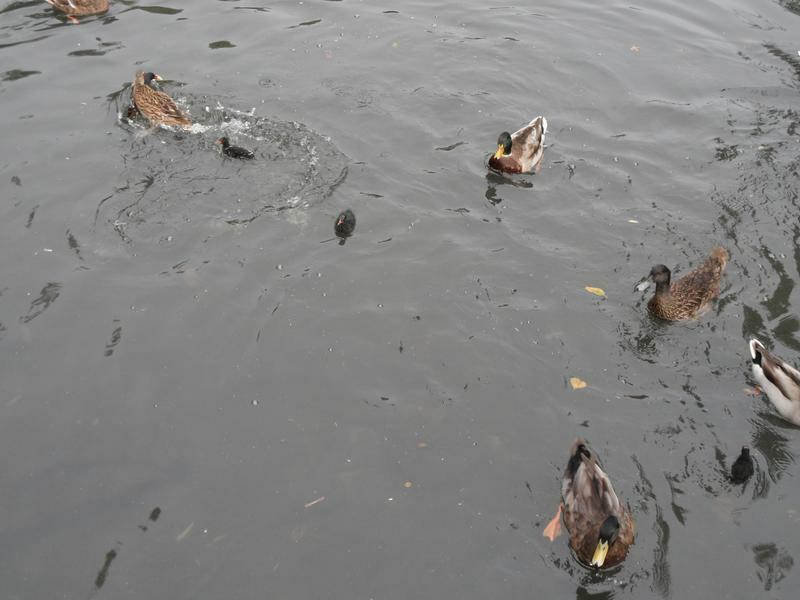 They jump at the bread, but don't seem able to eat it yet, forgot to bring duck pellets which are smaller. 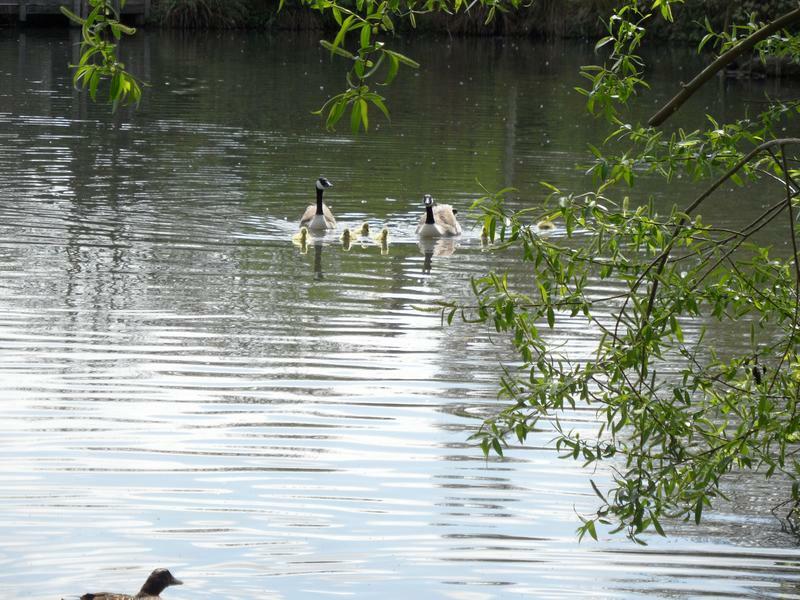 The whole family out of the water for a couple of minutes. 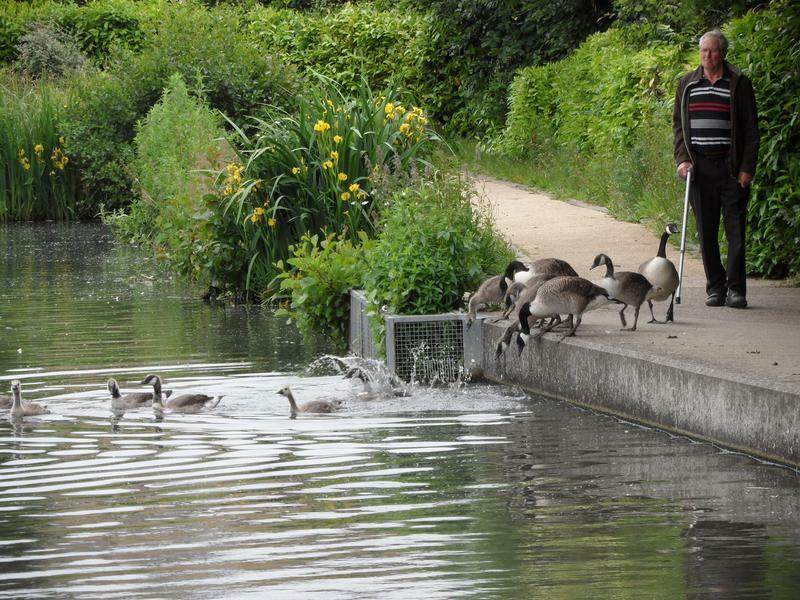 Bored already, they head back to the water. 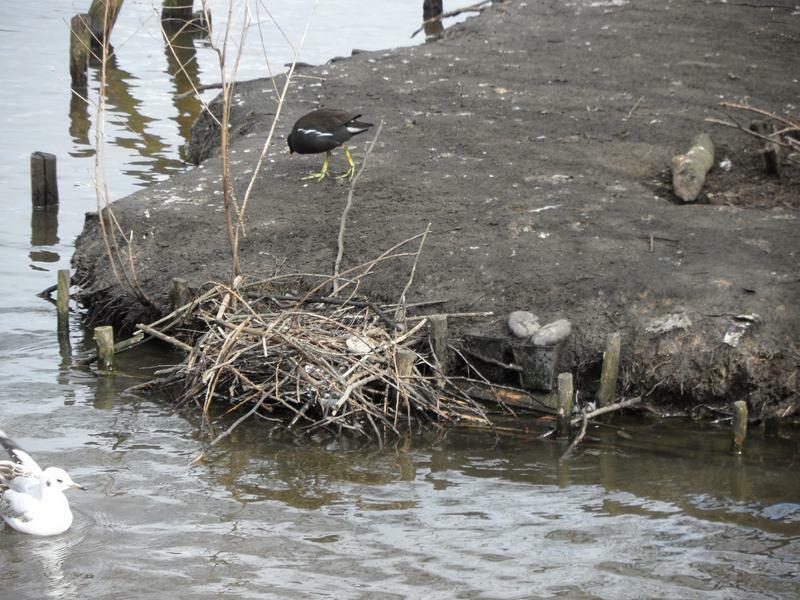 The second Coot nest, not quite the major engineering effort of the one on the island, but perfectly fine. 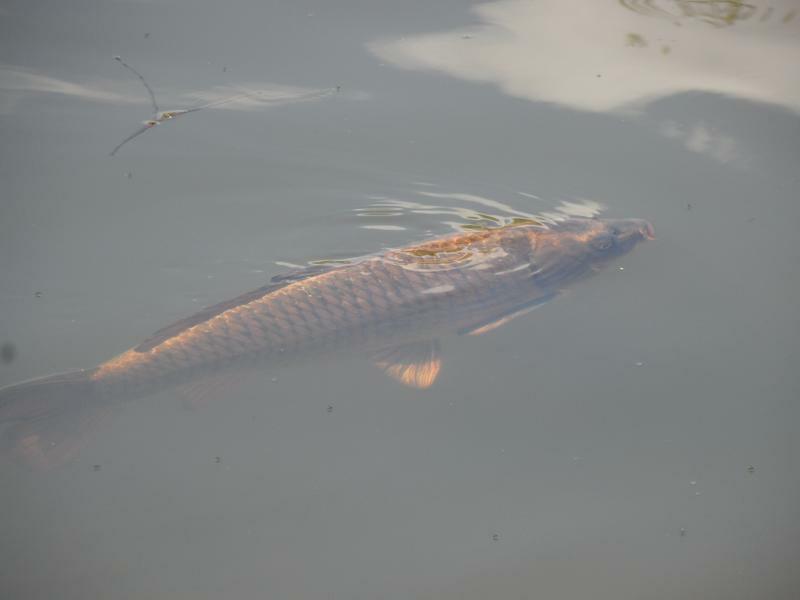 Rare to actually see any fish in Croydon ponds, but this is a two foot long carp. 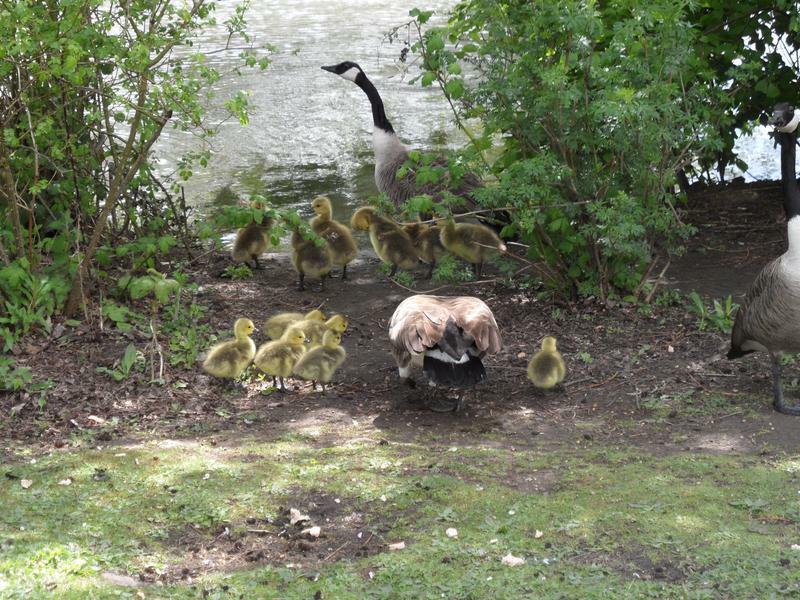 12th May 2013, the Canada Geese family arrives for food, six goslings look about two weeks old. 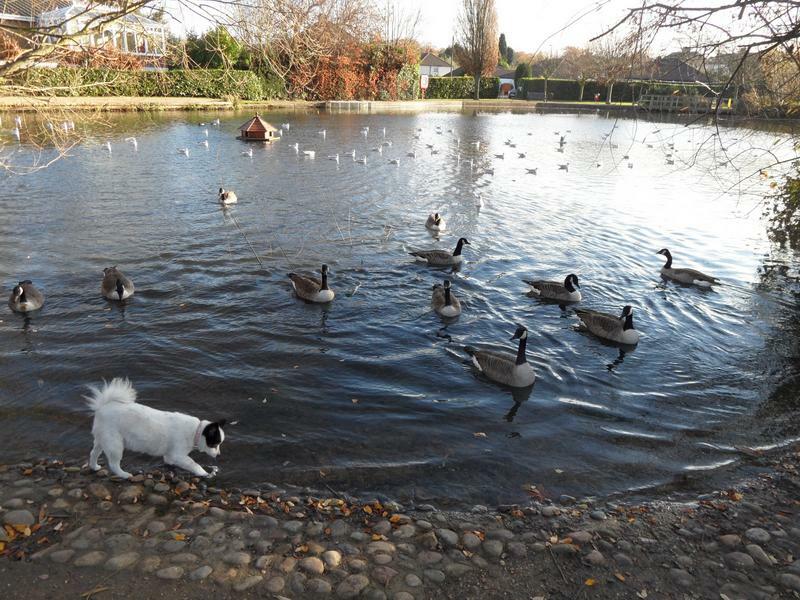 Not sure what the interest is by the park gate, since they all rush back into the pond when a dog arrives. 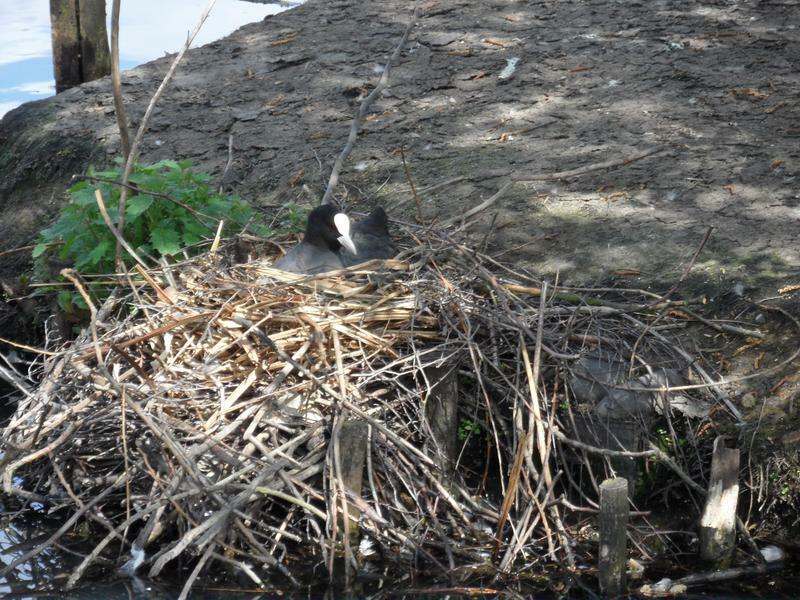 The Coot is still on her massive nest. 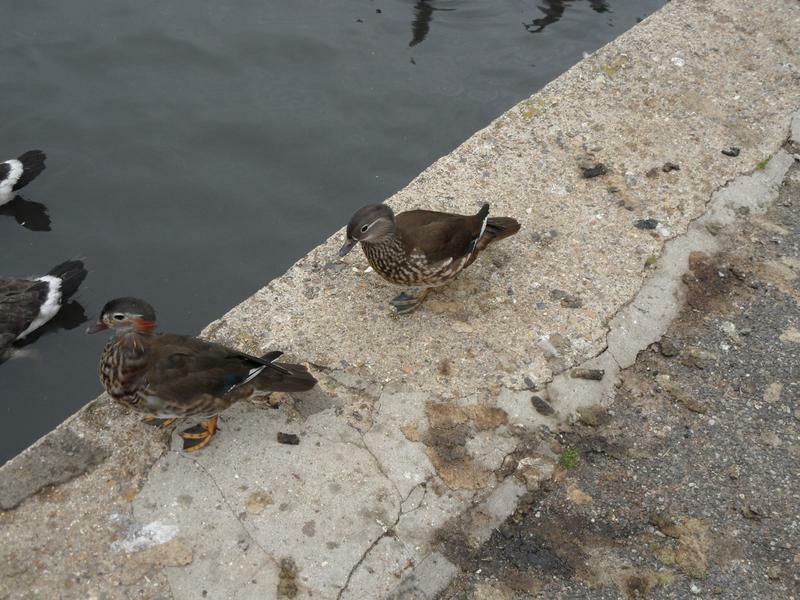 Two boy Mandarin Ducks on the island, there could be a female in the scrub. 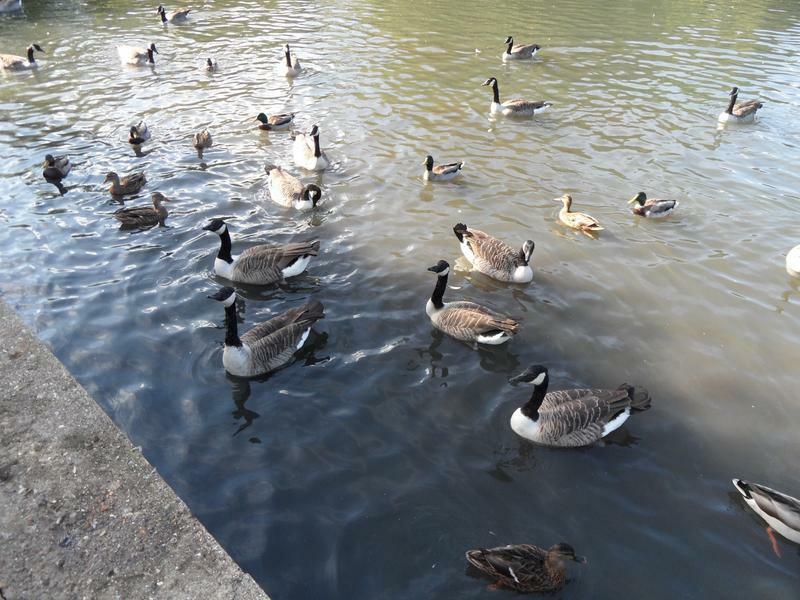 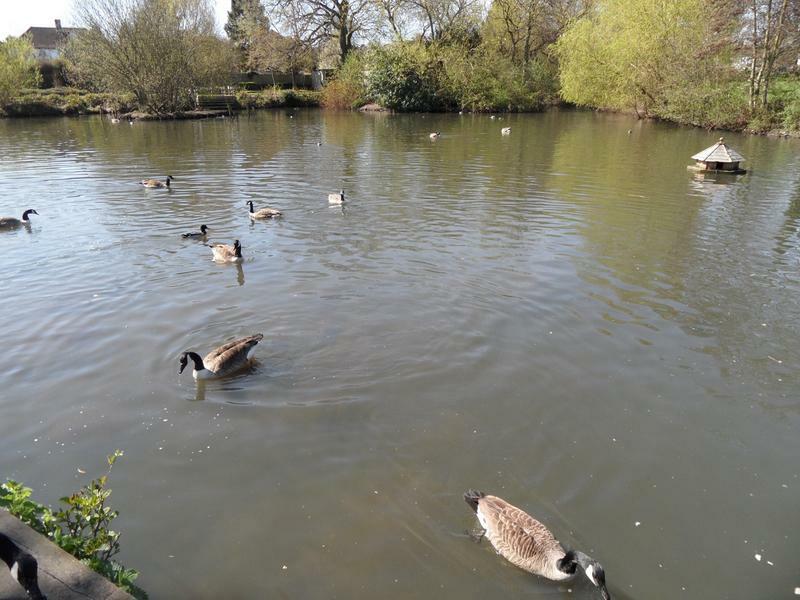 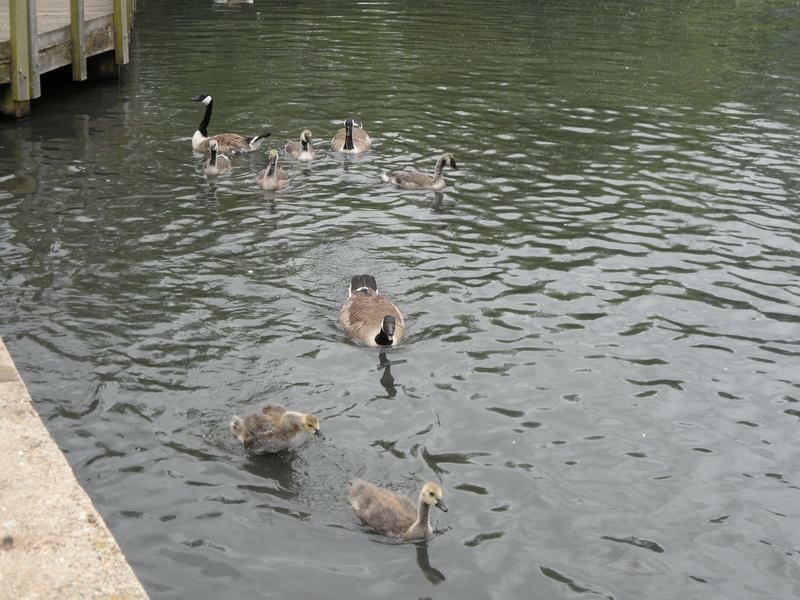 The goslings have swum to the other side of the pond. 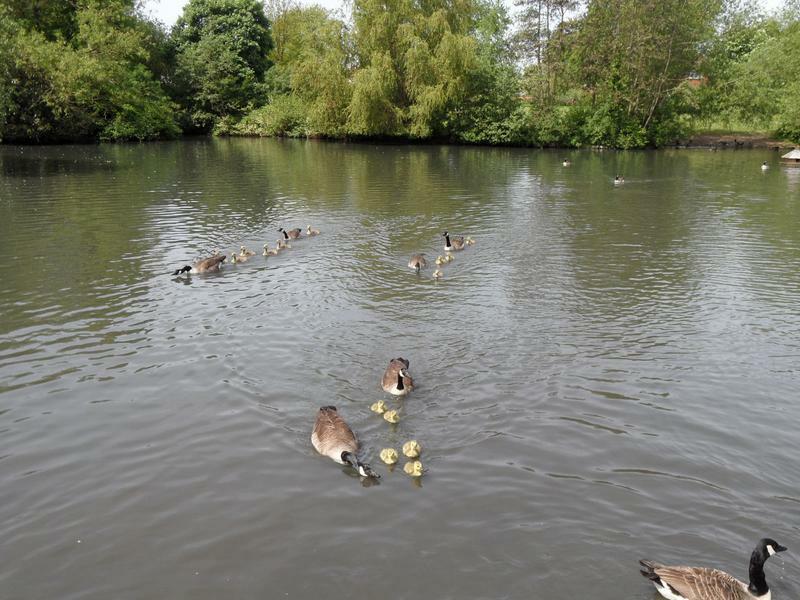 Where they join an earlier and large family, probably three weeks old now. 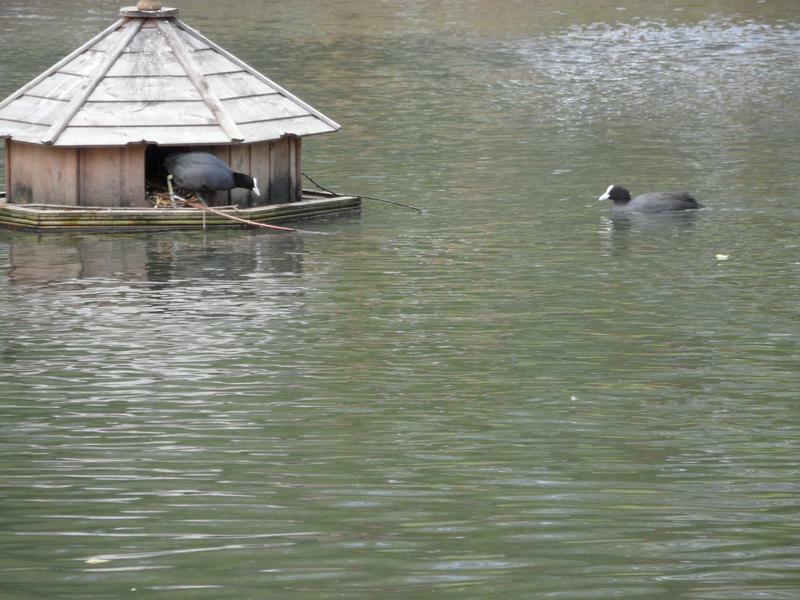 Coots have also taken over the floating nest box. 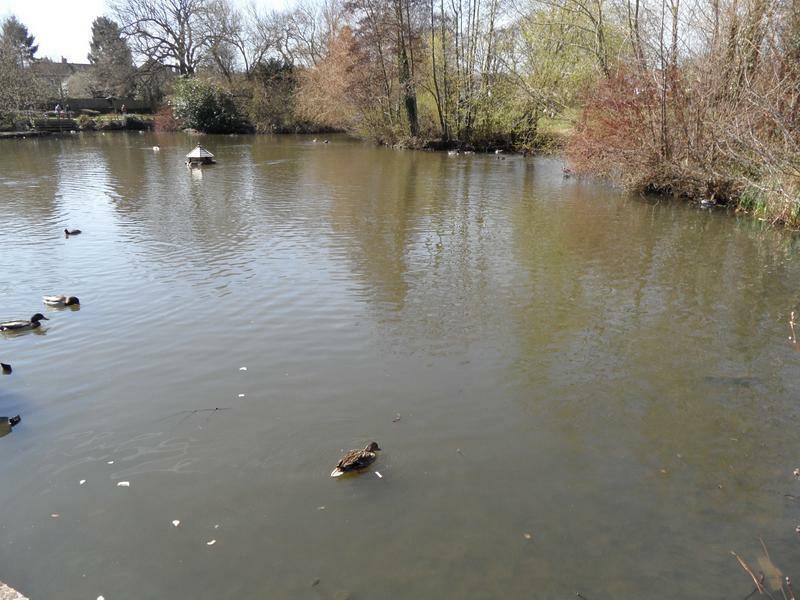 26th May 2013, the pond looks quiet at first glance, but what's that in the distance. 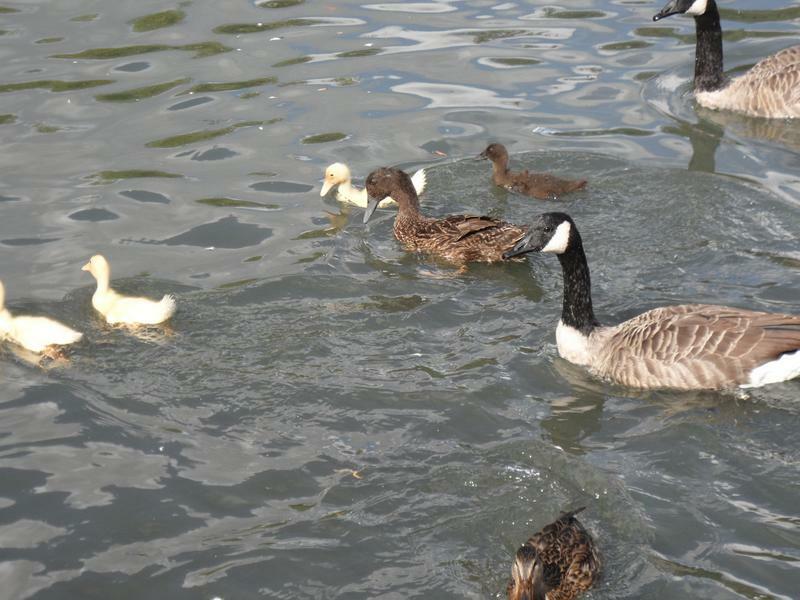 There are now three Canada Goose families, arriving with their parents. 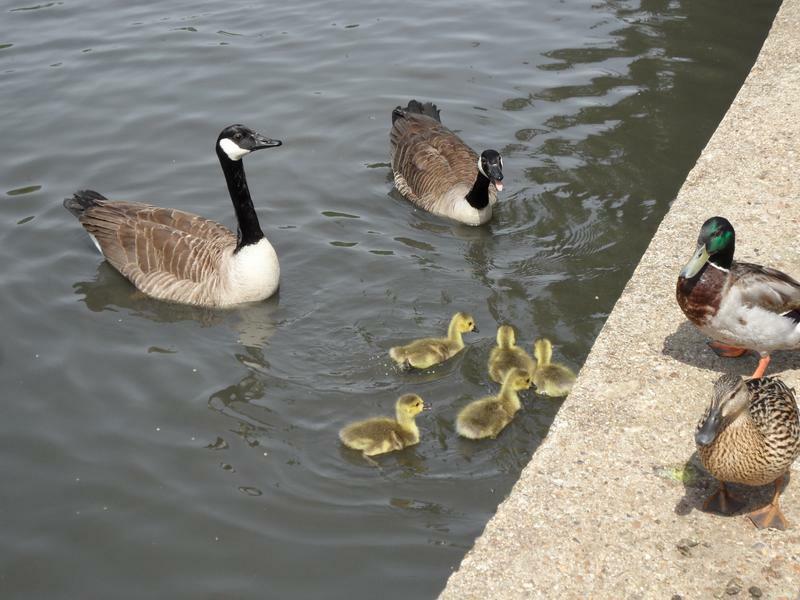 The oldest goslings are approaching the size of ducks. 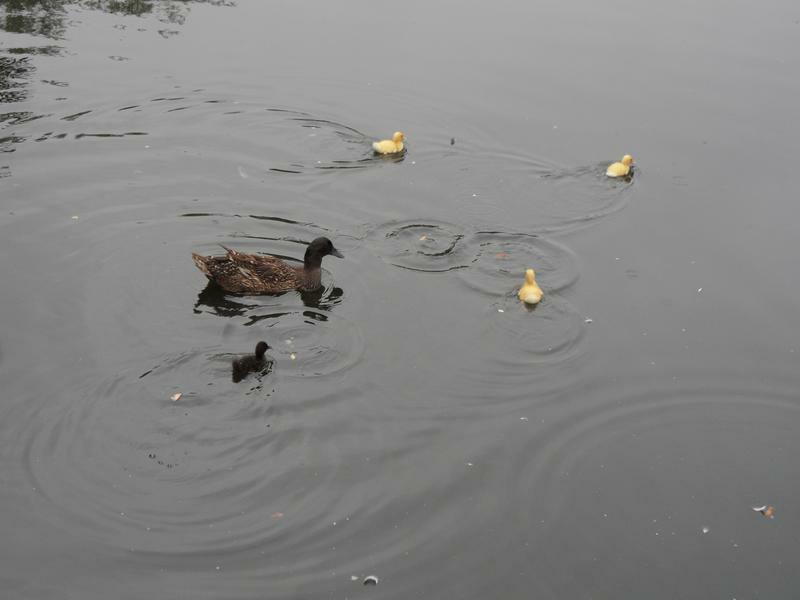 Only five in this family, from six last week. 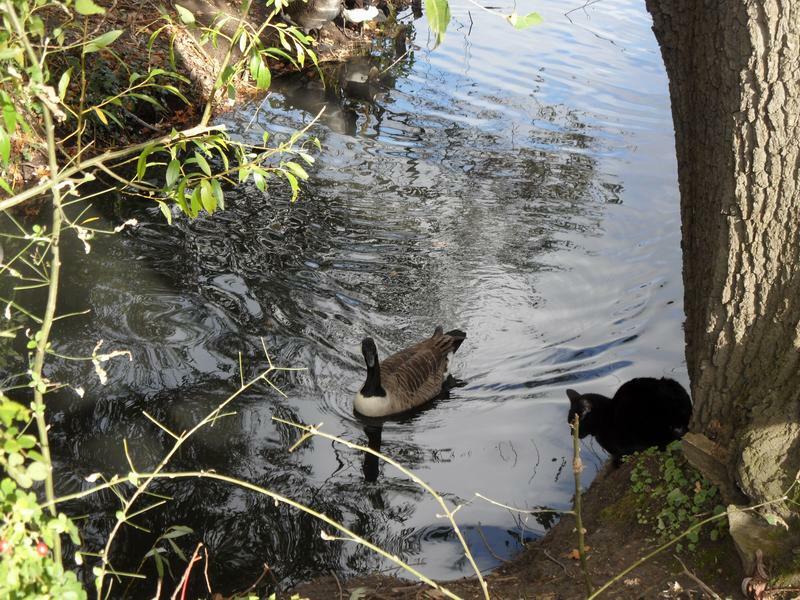 Don't often see cats in the parks, but this one was hiding in the shrubs and scratched the dog's nose when she got too close. 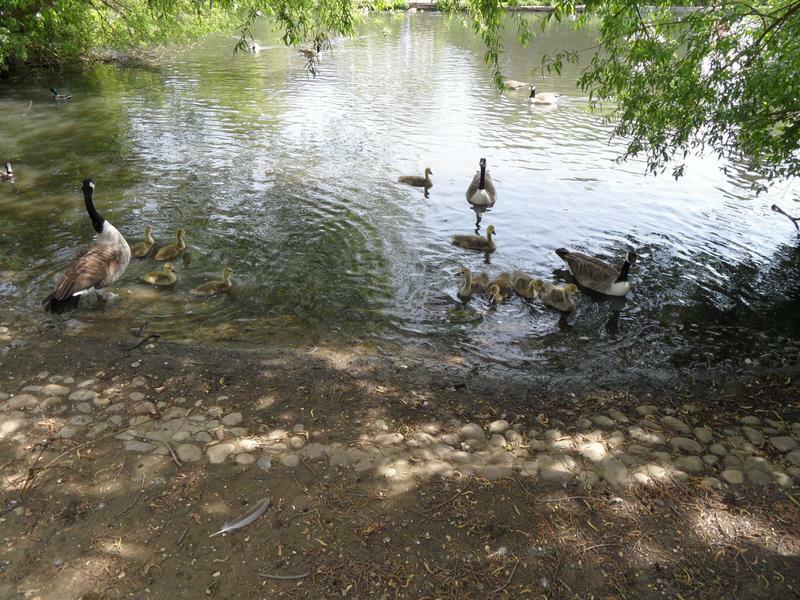 After feeding, the goslings all return to the beach area and exit the pond for the grass. 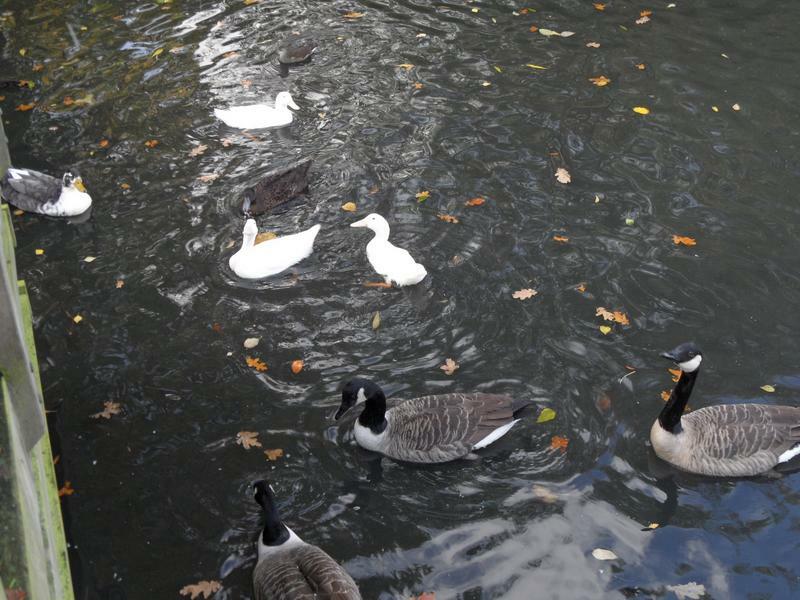 Not sure where the third family went. 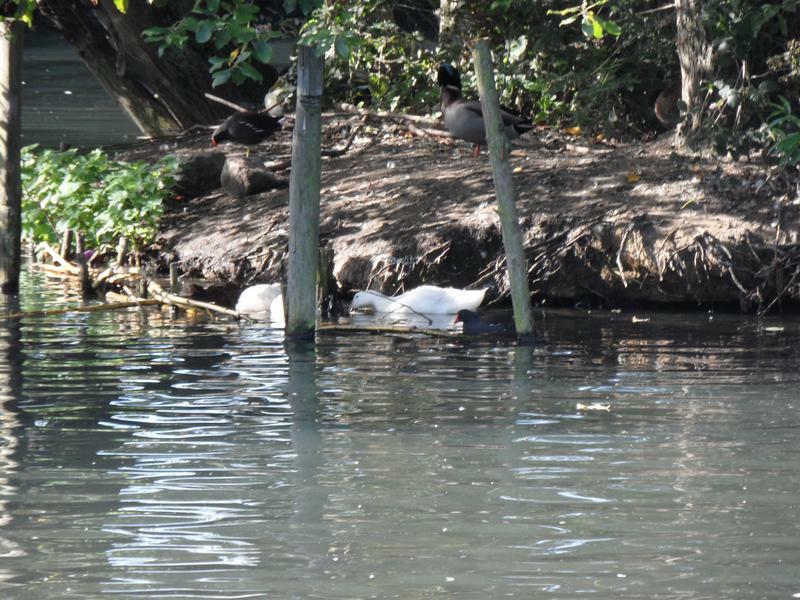 Not sure what's happening on the small island, something much larger is now sleeping in the Coot nest, with a Muscovy Duck behind. 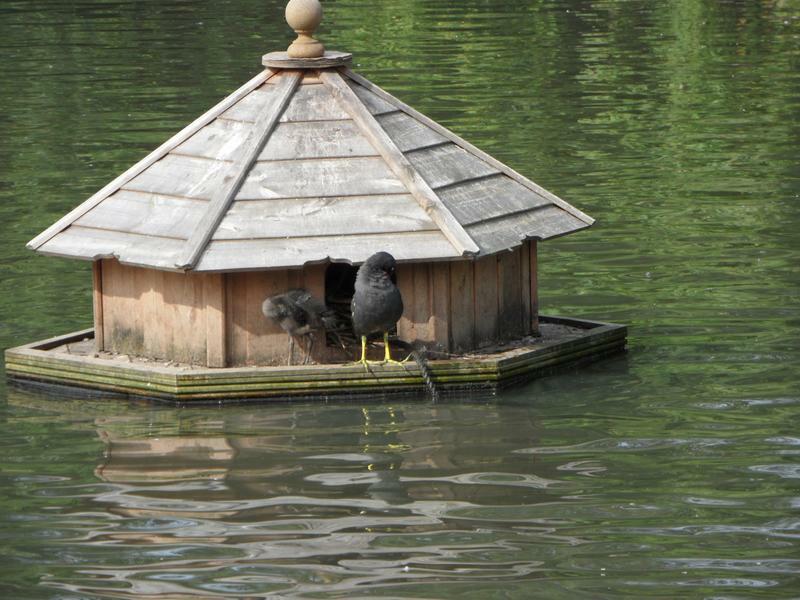 At least the Coot no longer needs the nest since she has three chicks. 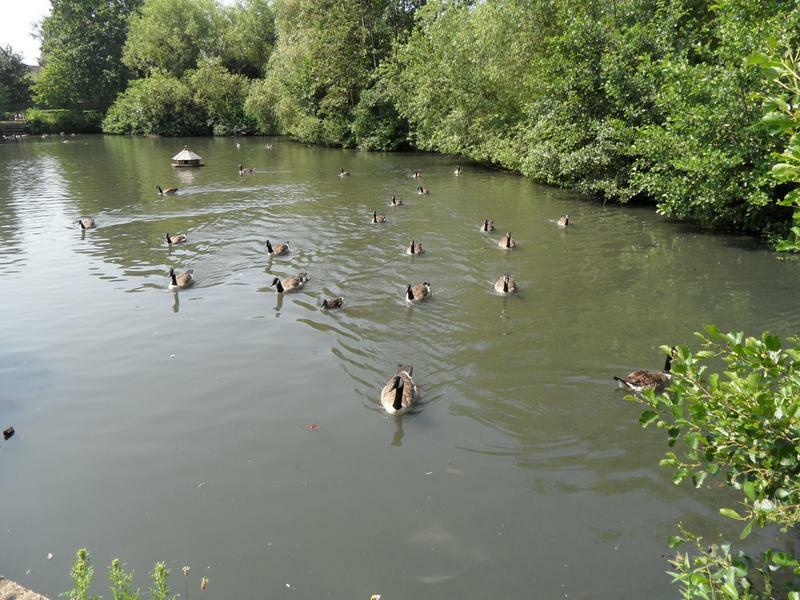 2nd June 2013, the pond again looks quiet. 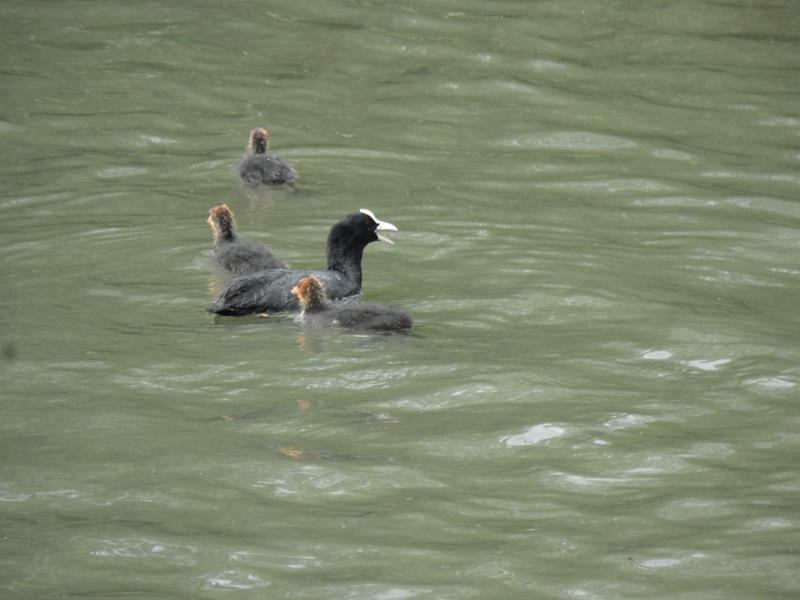 The Coot chicks are still with mother. 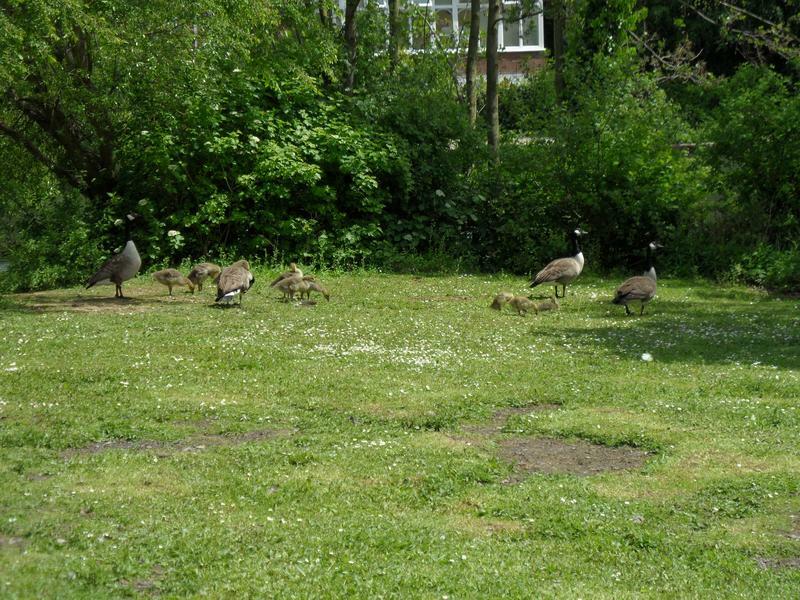 These goslings are now about a month old, and massive already. 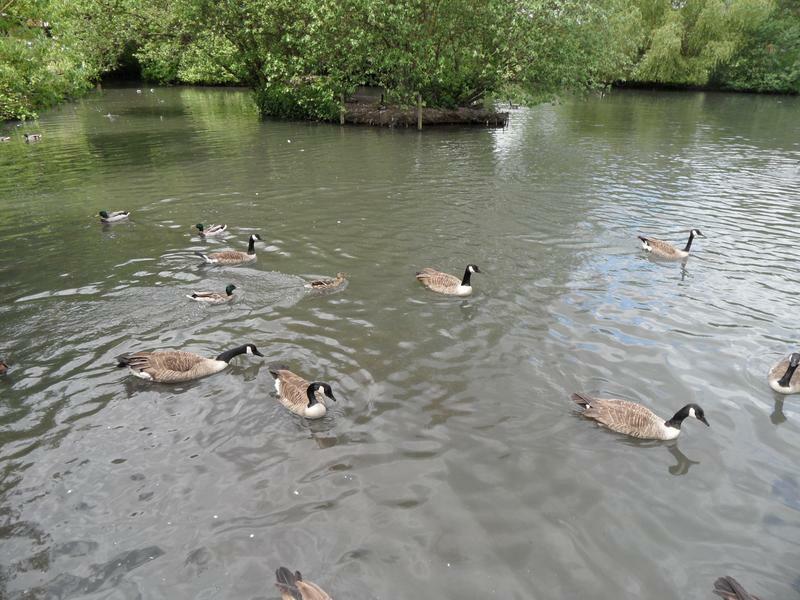 After a swim, they return to the grass. 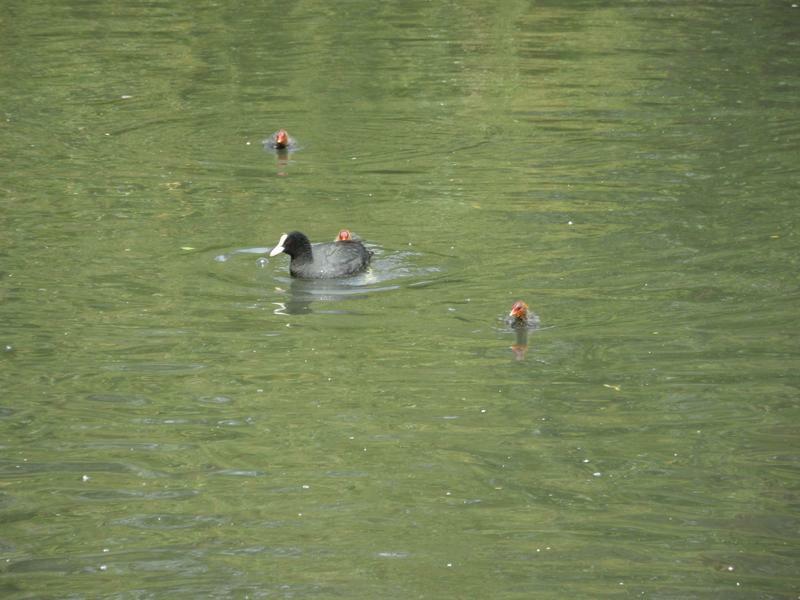 The Coot still has her three chicks. 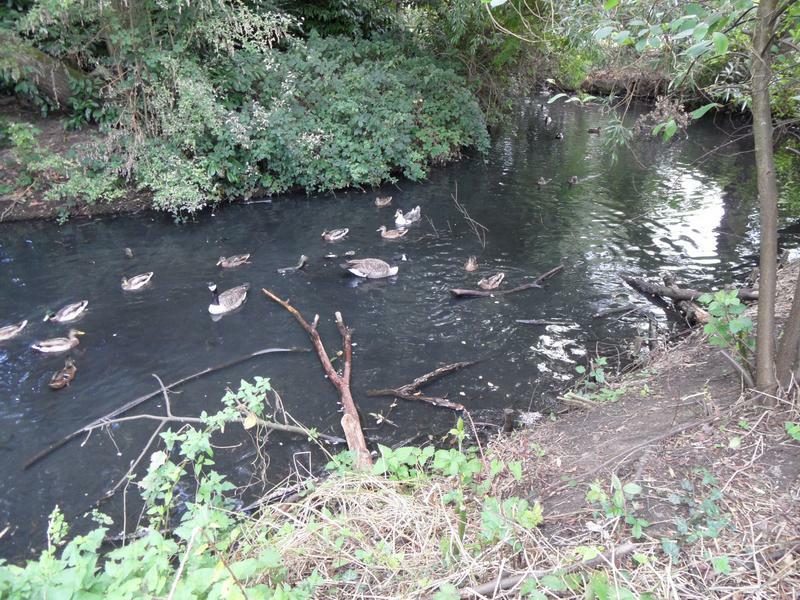 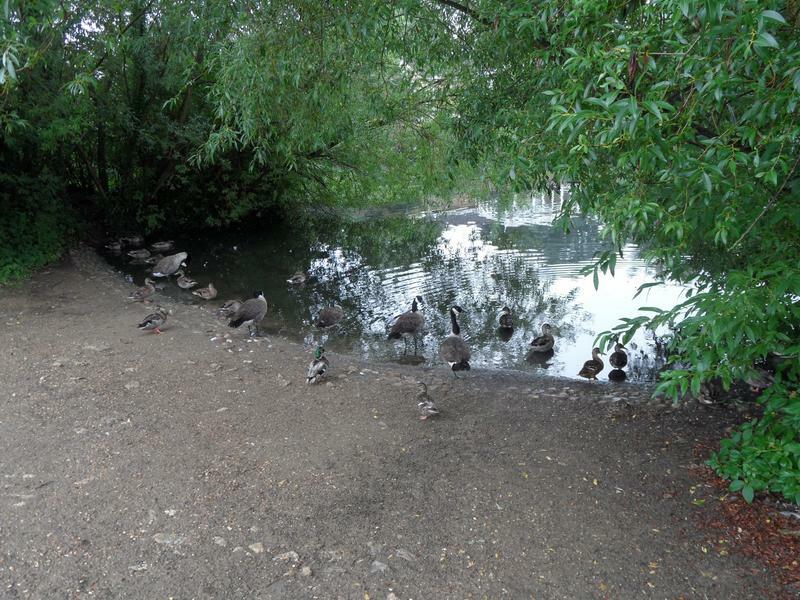 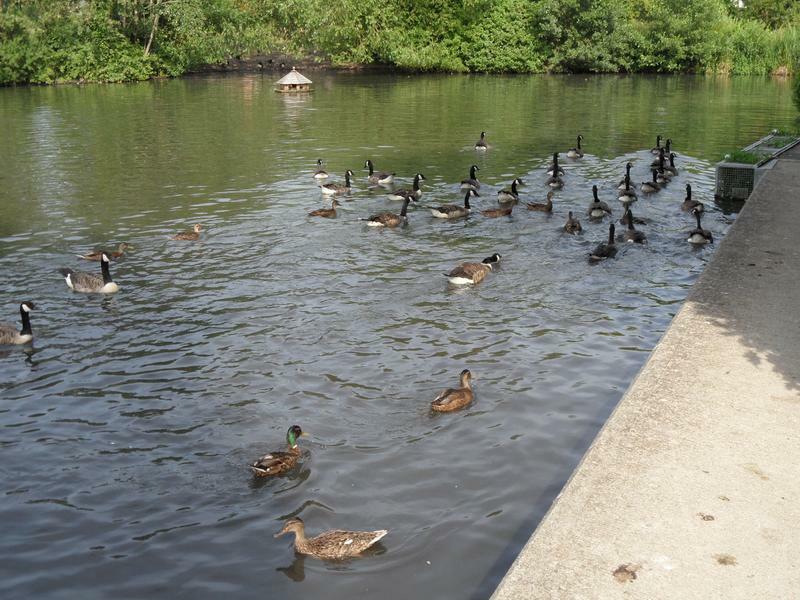 17th June 2013, no enough room on the path for all the goslings and walkers, so they jump back in the water. 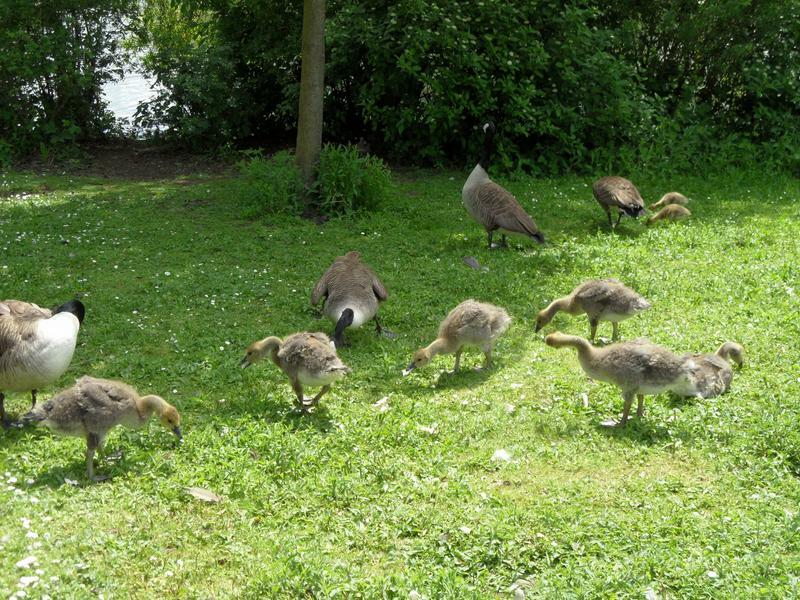 Now almost fully grown, the goslings in the foreground have lighter coloured and more fluffy necks than the adults. 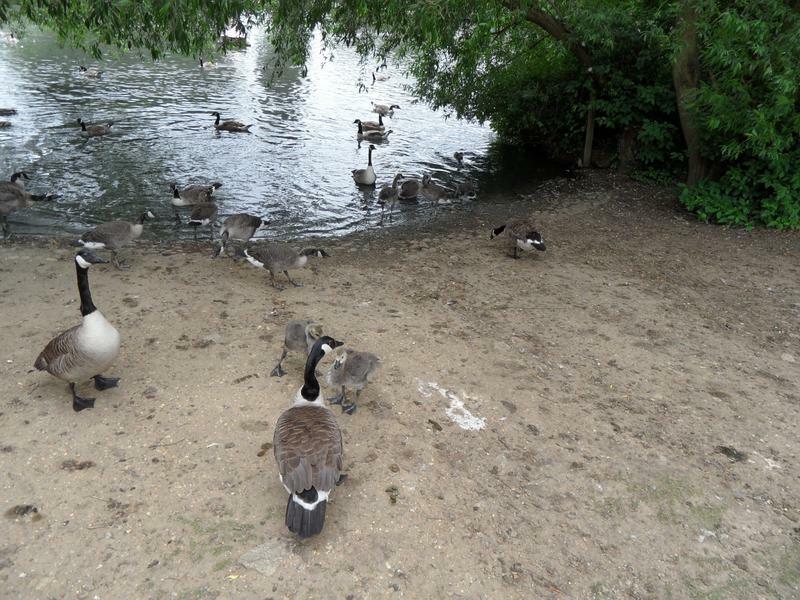 Two families of goslings, an adult at my feed waiting for food. 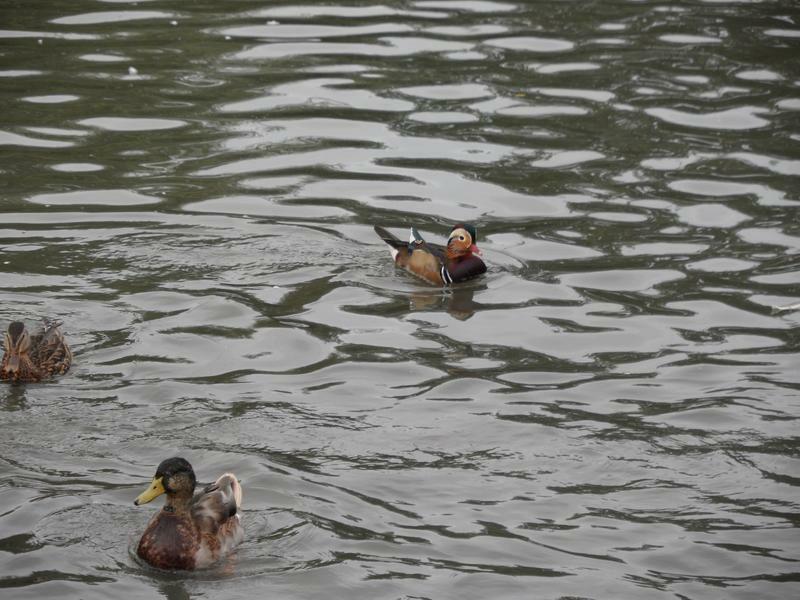 Two Mandarin Ducks, probably a mating pair, the red neck feathers suggest a male. 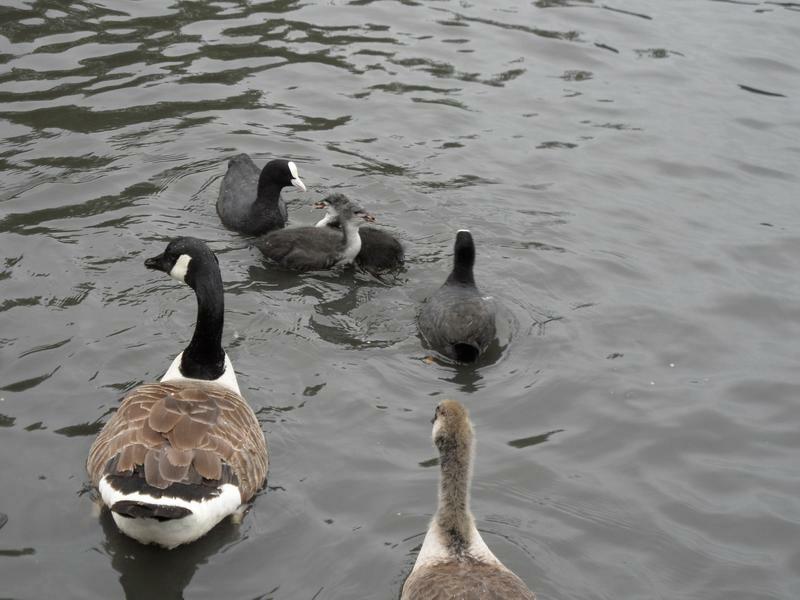 A Coot family. 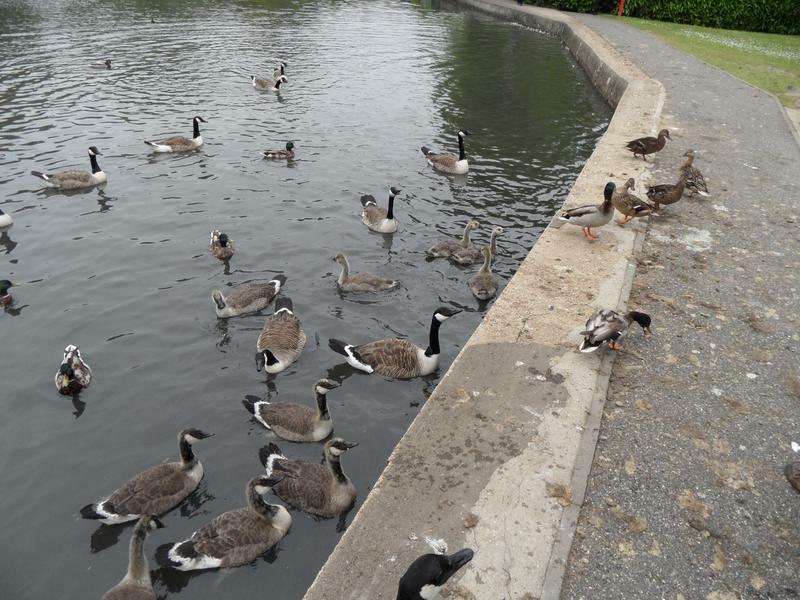 The chicks have trouble getting fed, the geese keep chasing them and trying to take any food they catch. 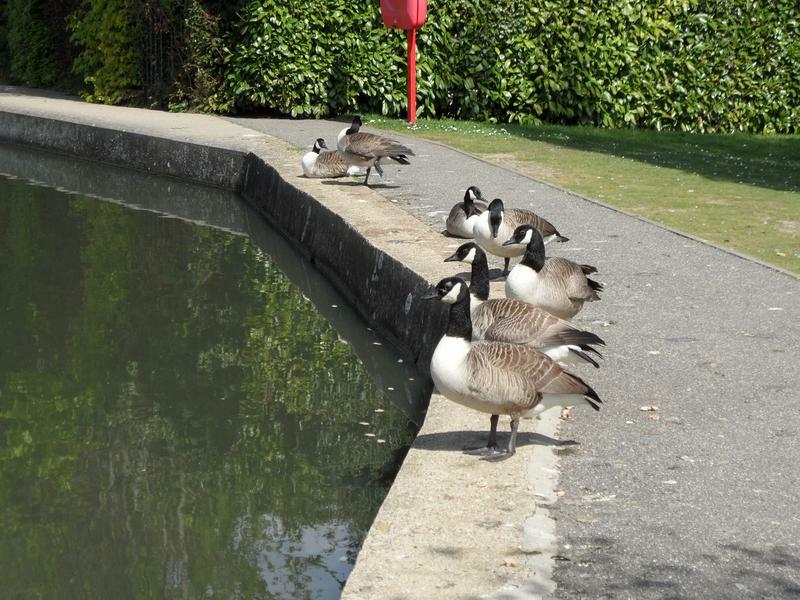 Everyone has followed us to the corner of the pond. 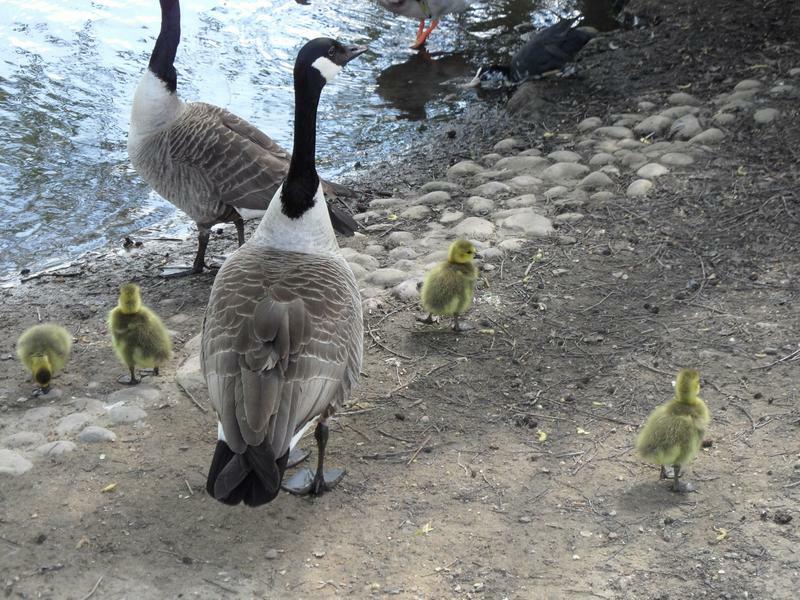 The youngest Goose family on the beach. 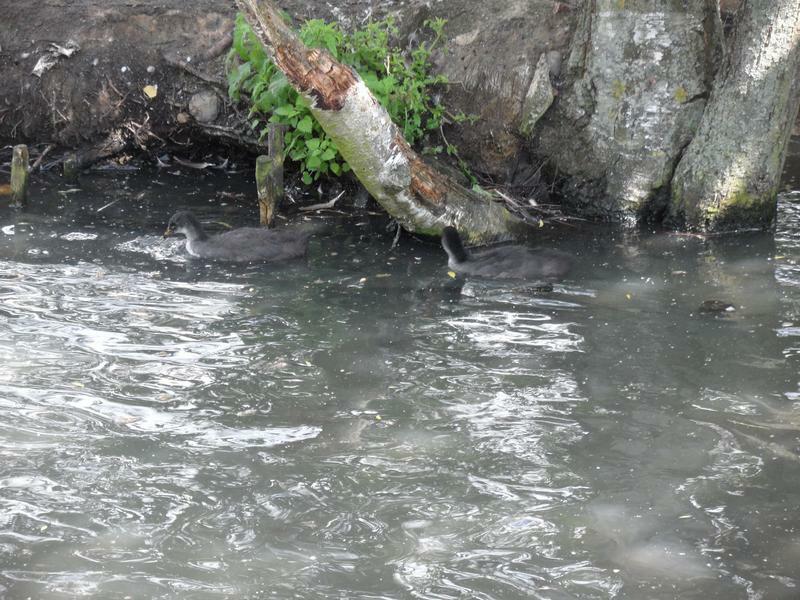 Another Coot family near the nest. 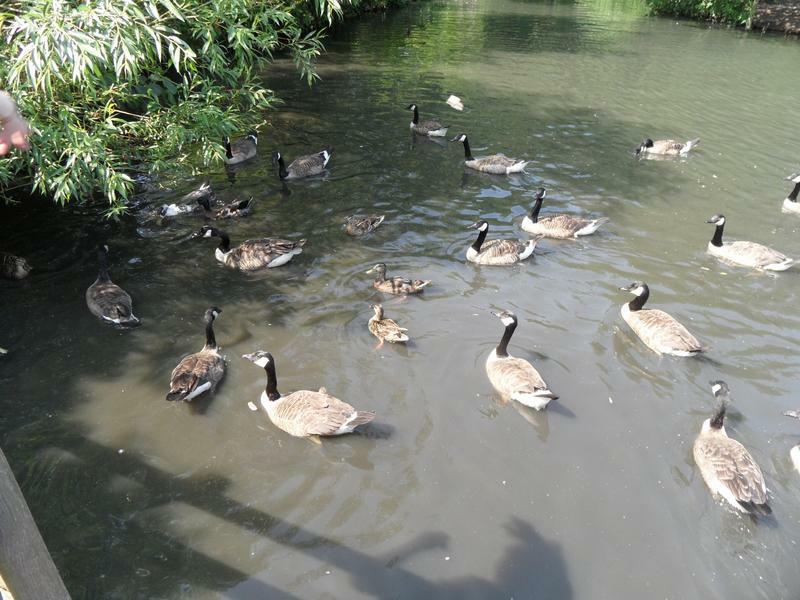 23rd June 2013, two Geese families looking for food. 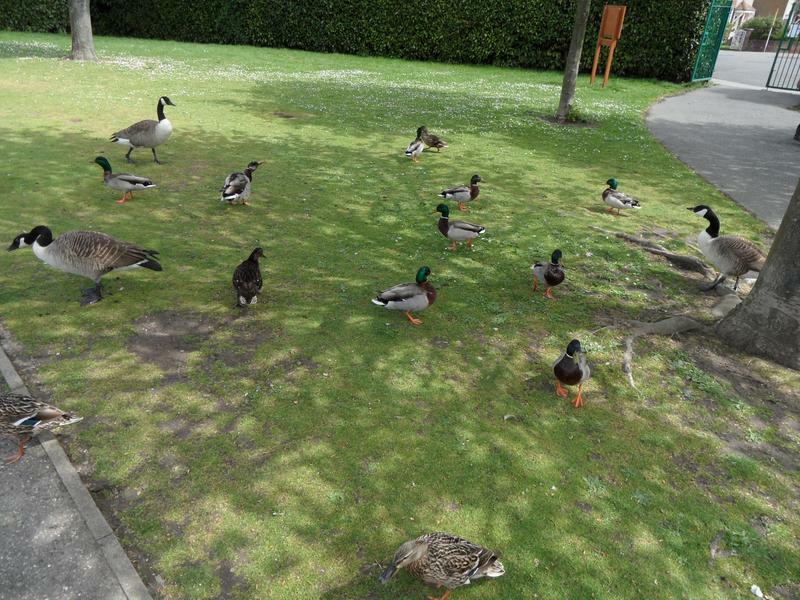 Now evrryone is looking for food. 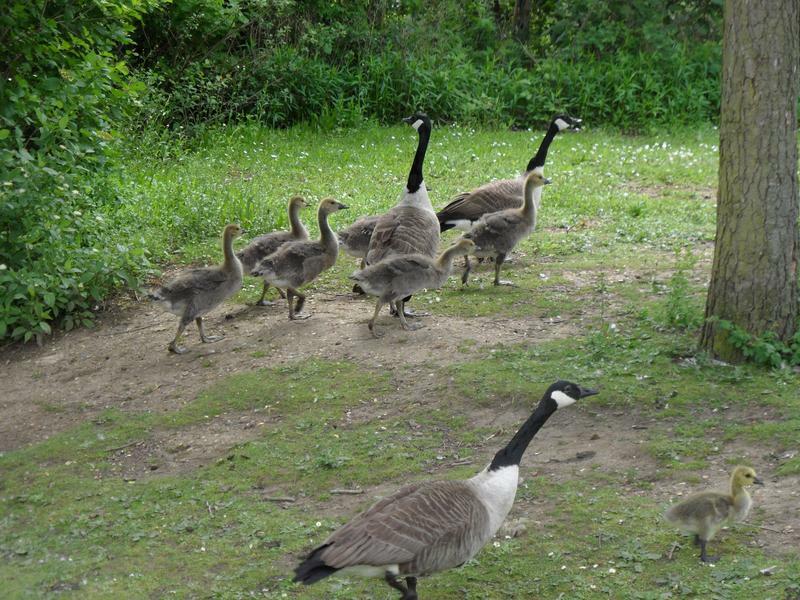 Following us up the grass again. 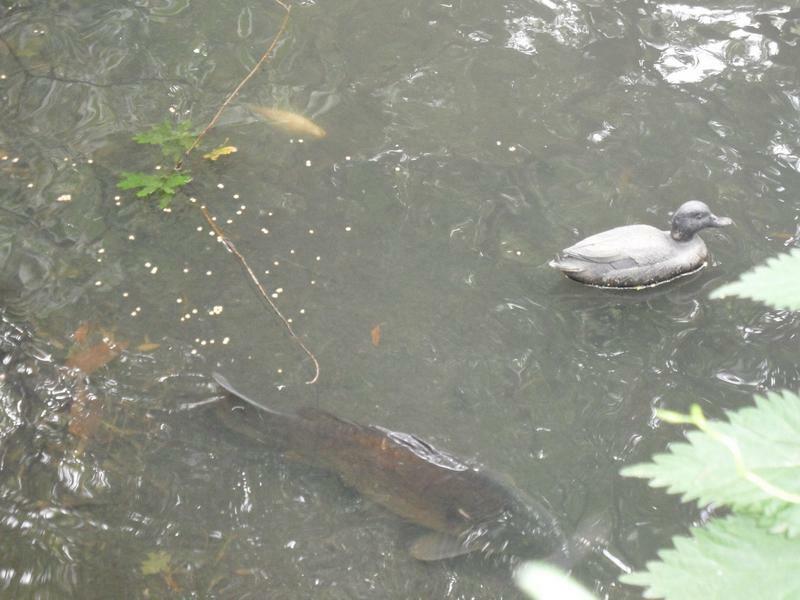 In the shallow water, a large and small Carp can be seen, a second large Carp was out of shot, the plastic duck is still here. 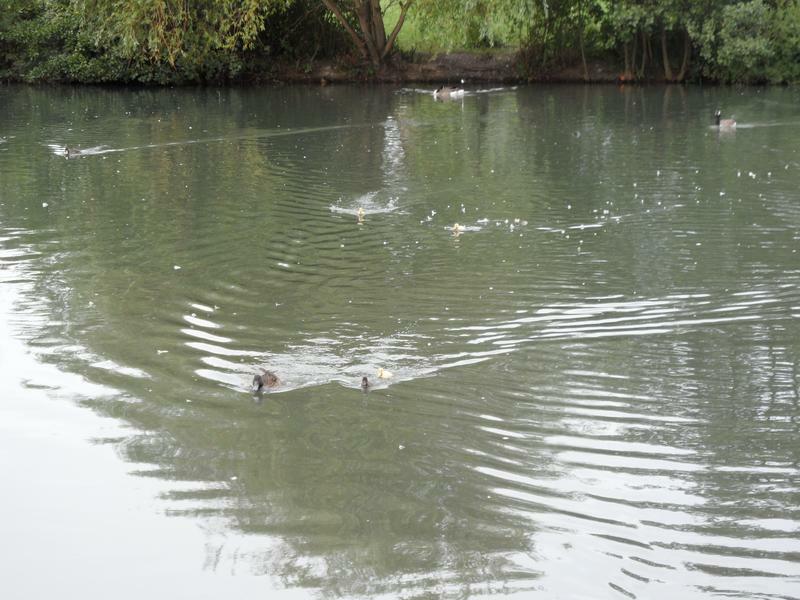 The usual chase down to the pond looking for food. 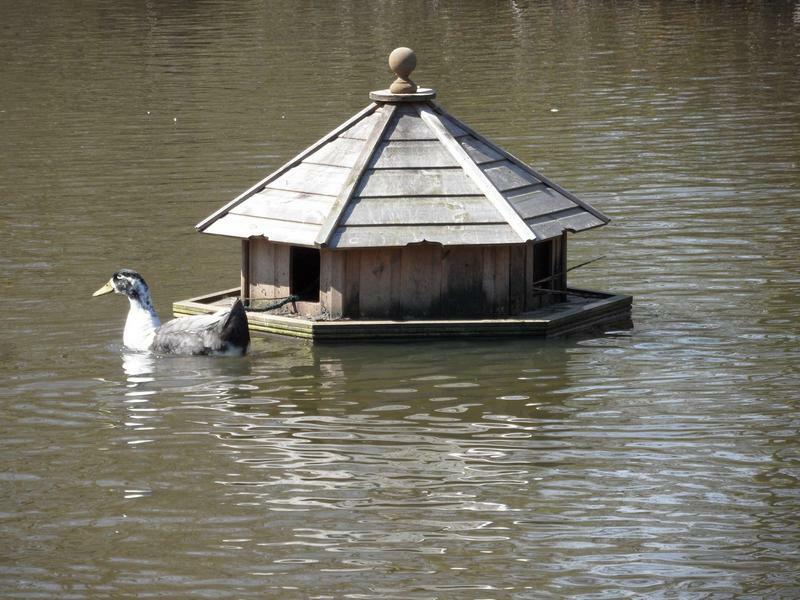 Continuing out of the water. 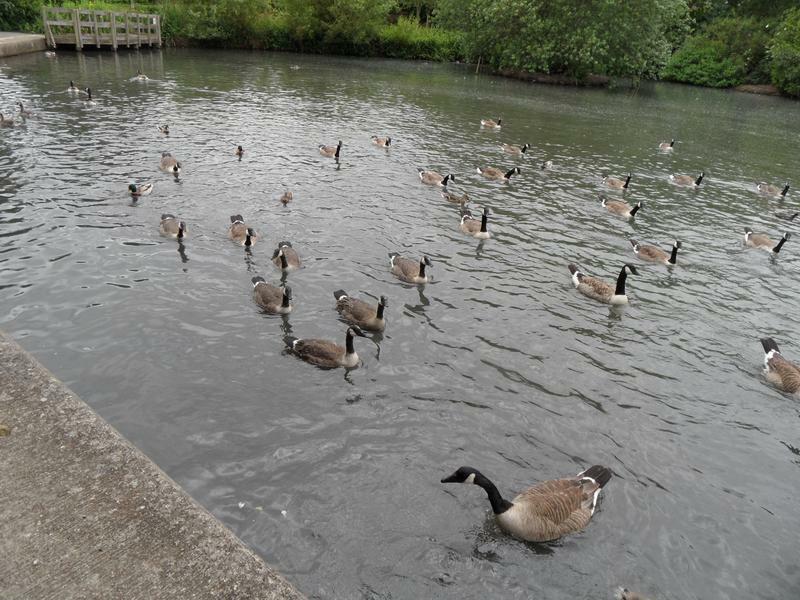 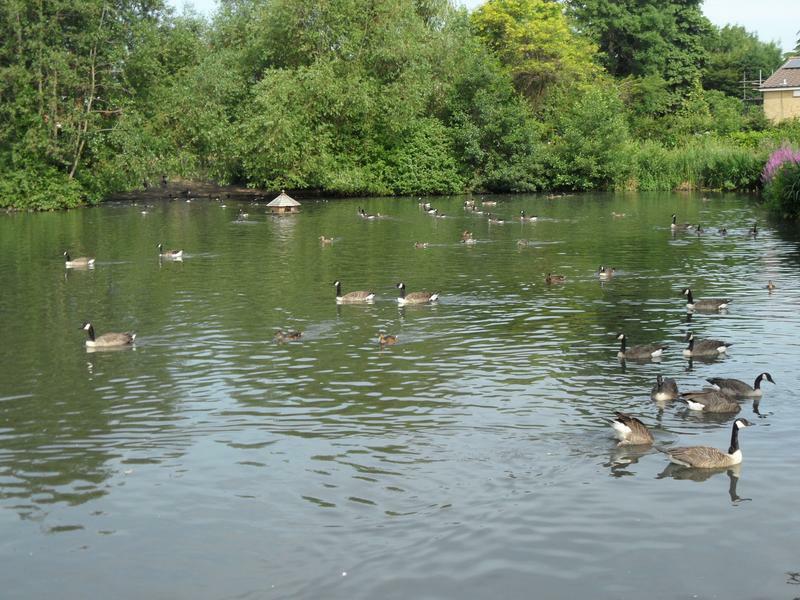 7th July 2013, plenty of hungry Canada Geese. 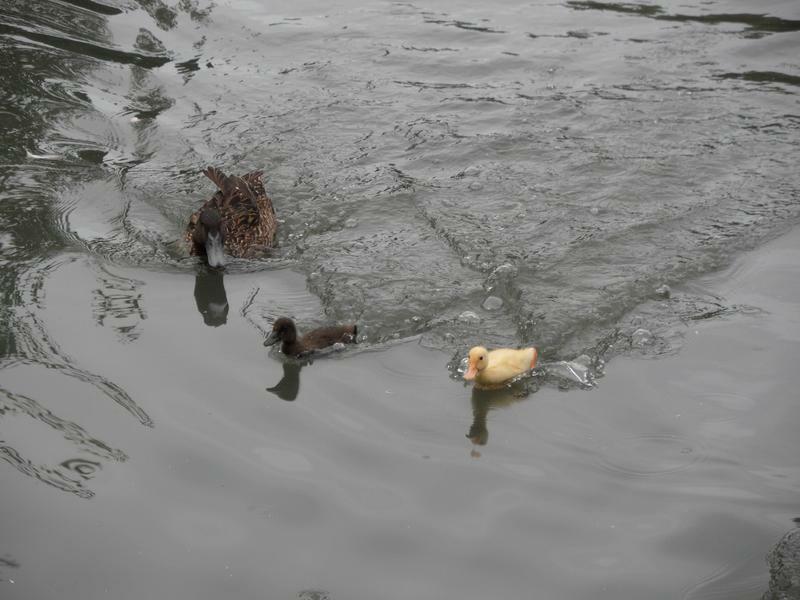 successful duckling is very poor. 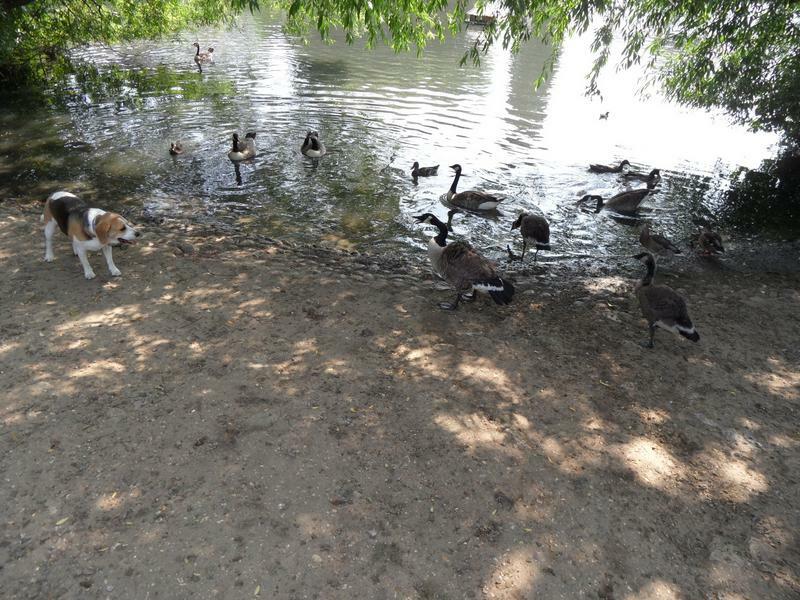 This friendly dog was as much interest in bread as the geese, who kept hissing at him. 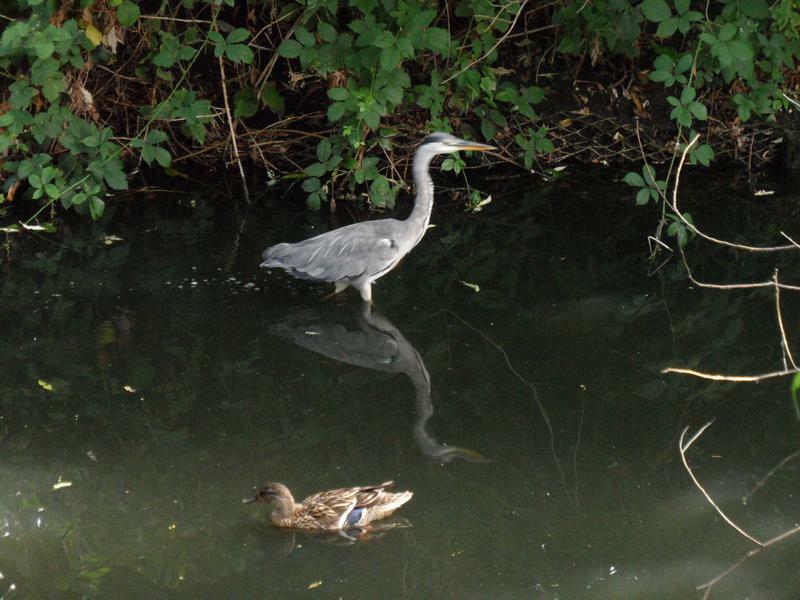 Following us around the corner of the pond. 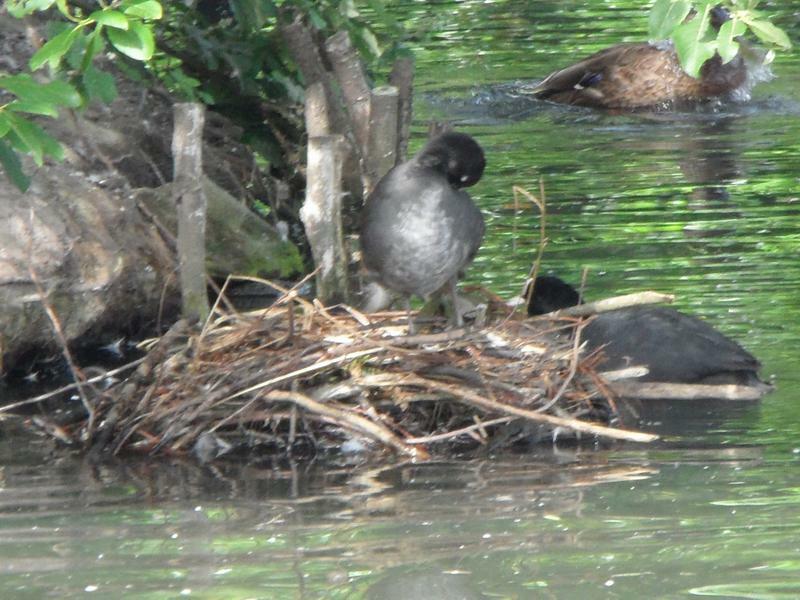 Possibly young Coots sitting on nest on the small island, hard to tell, adults are much darker. 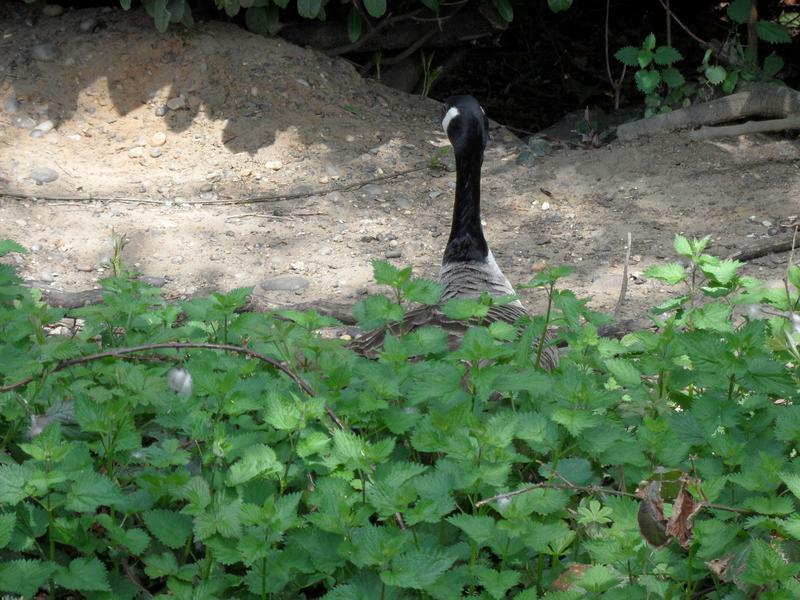 camera shy (I was too slow). 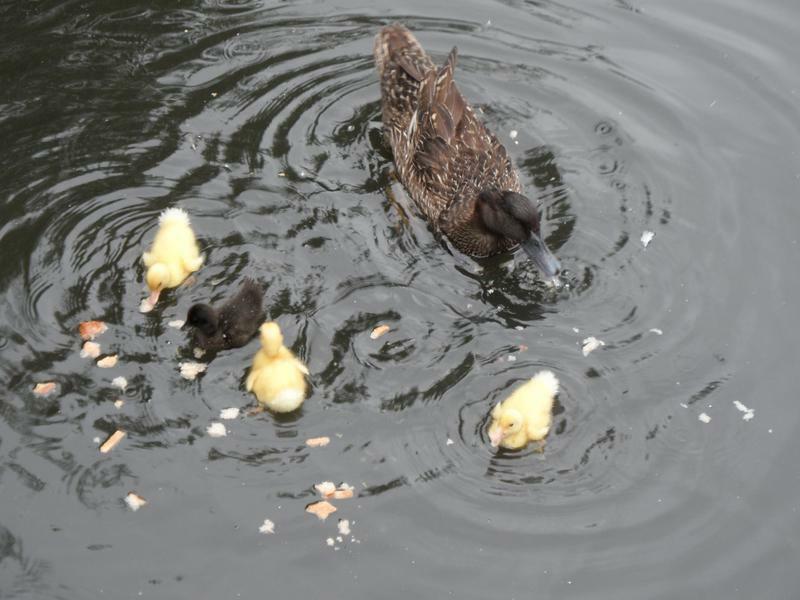 have flown here from other nesting sites, since we've not seen ducklings until July. 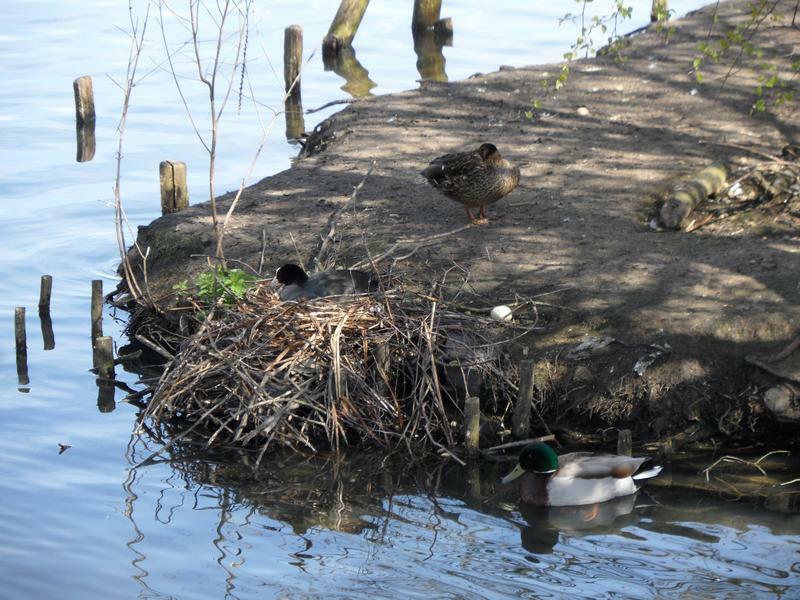 Still not sure what's happening on this nest, one would expect young Coots to be away from the nest. 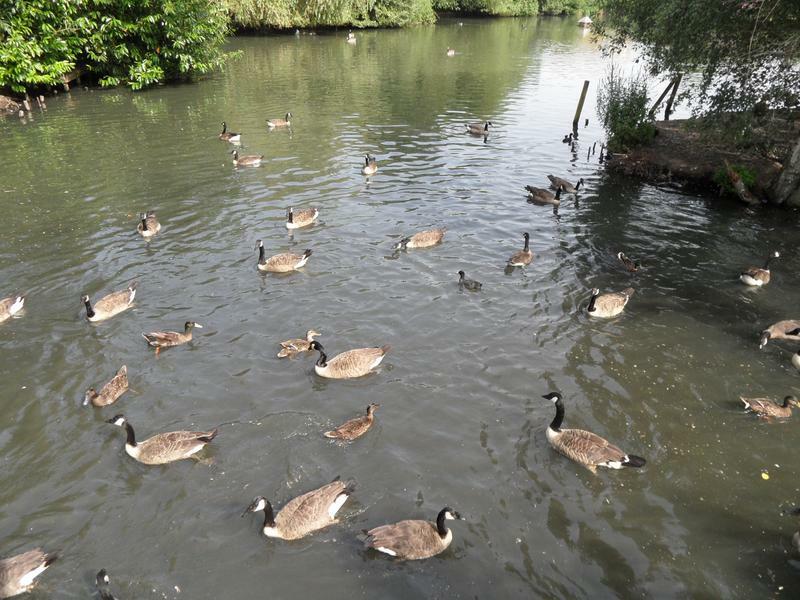 Some weeks there seem few Canada Geese here, but there are a large number now. 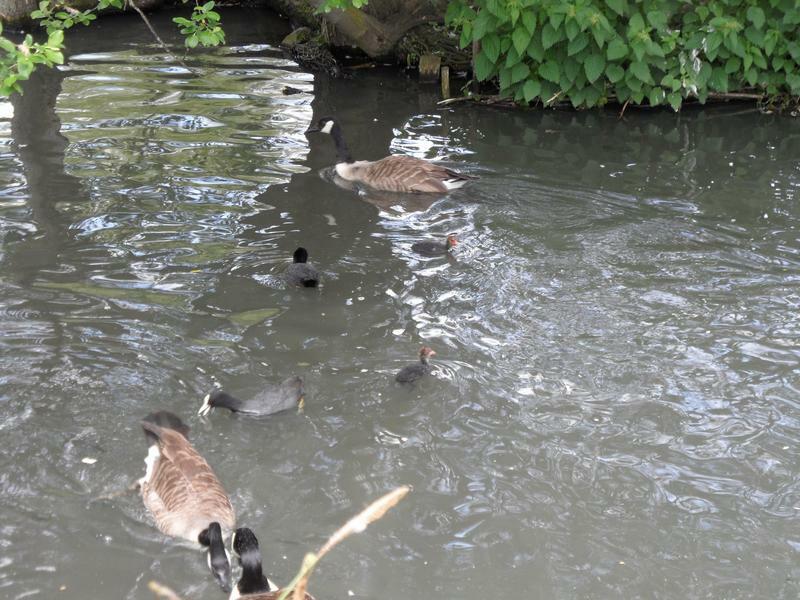 Can not see either of their heads, but this is a Moorhen and one of her chicks, at least two more are inside, just returned from a swim. 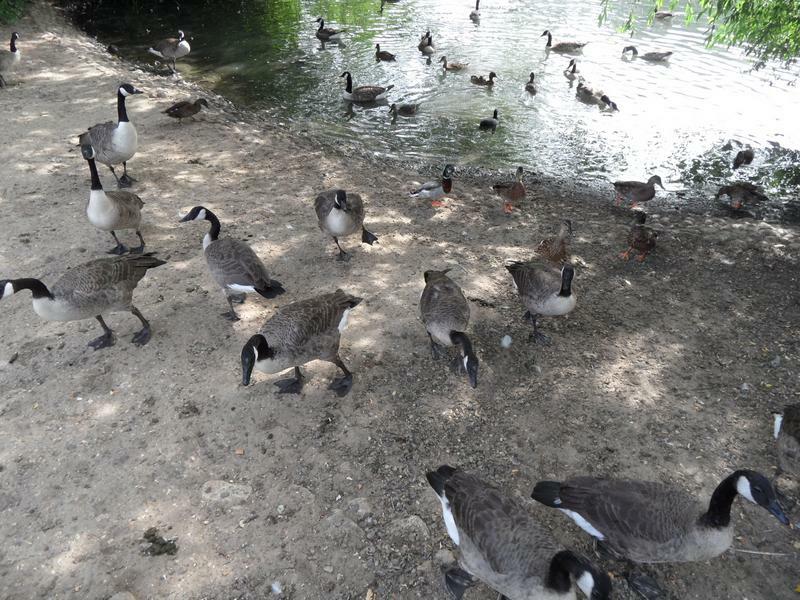 The geese are being a pain around at the beach, circling me looking for food. 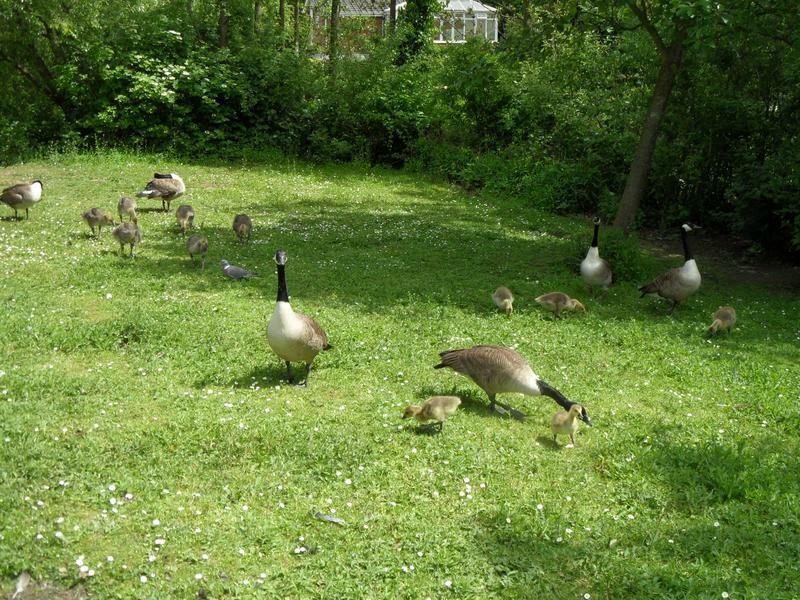 All the goslings are fully grown after just two months. 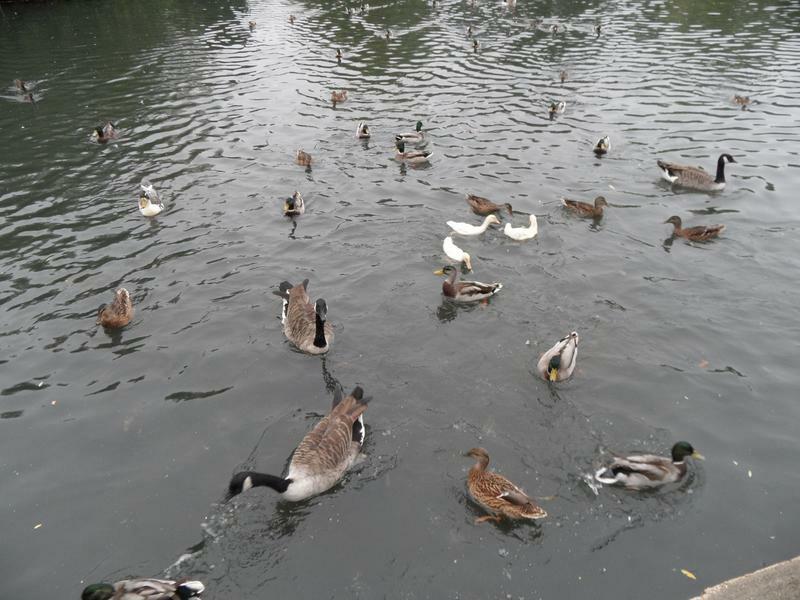 Mix of geese and ducks between the two islands, still hungry. 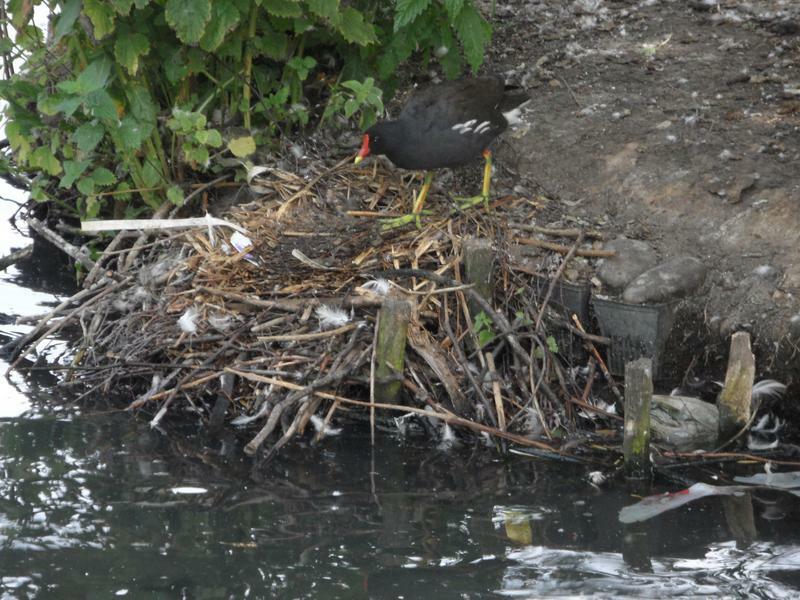 A Moorhen inspecting the older massive Coot nest. 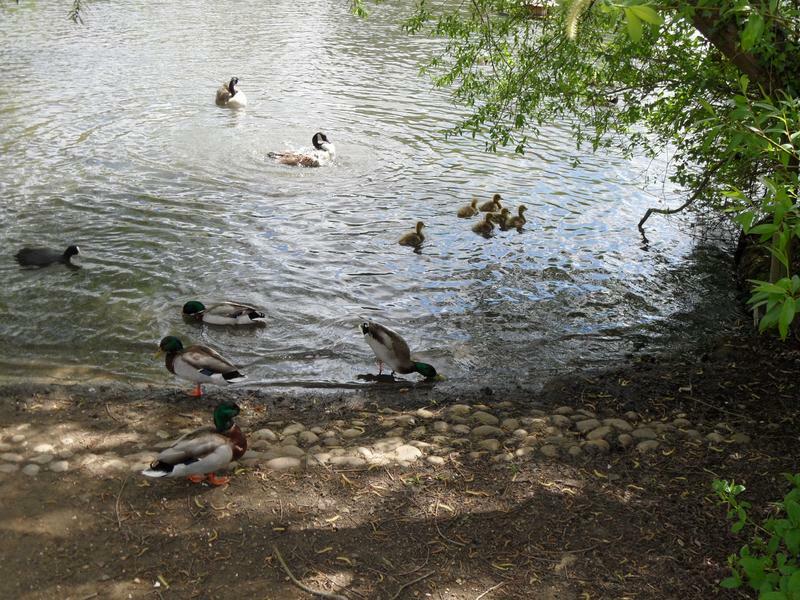 28th July 2013, finally get a photo of the single Mallard duckling with mother. 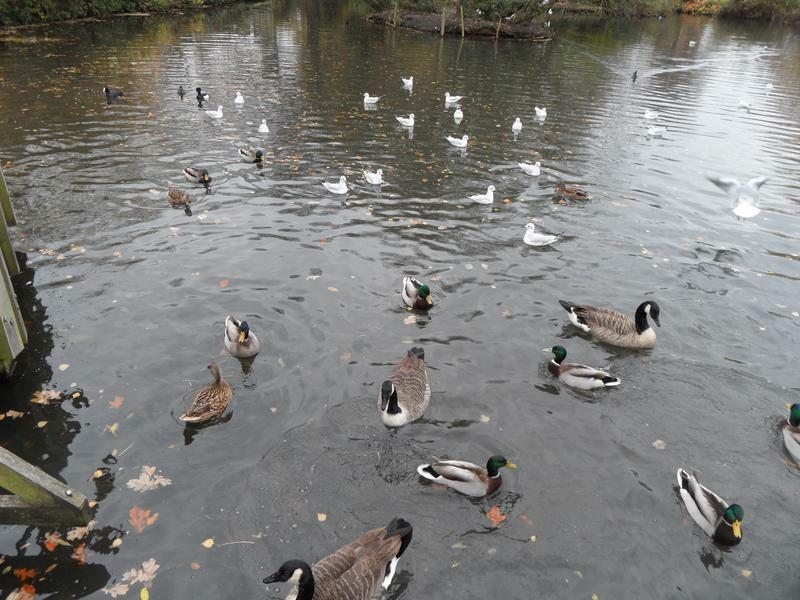 It's relatively quiet on the pond, not many ducks. 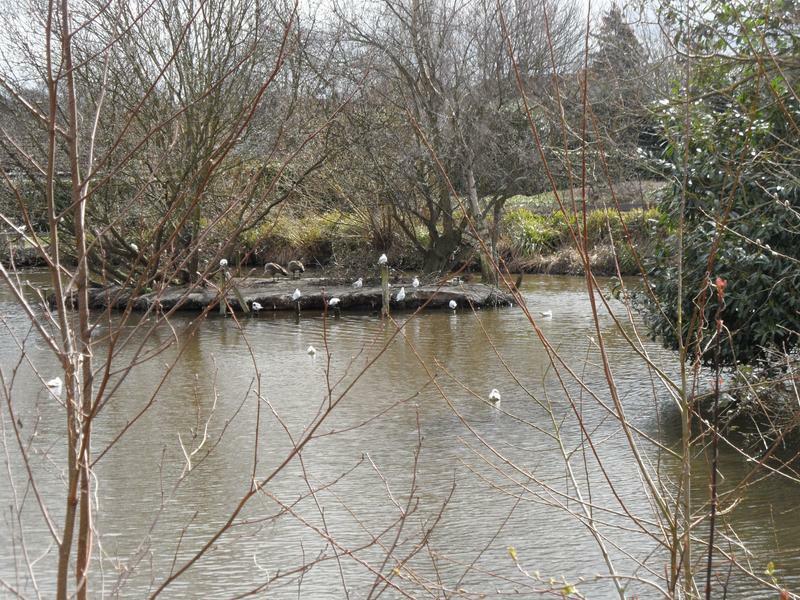 The heron is stalking the shallow water behind the large island, looking fish that favour this area. 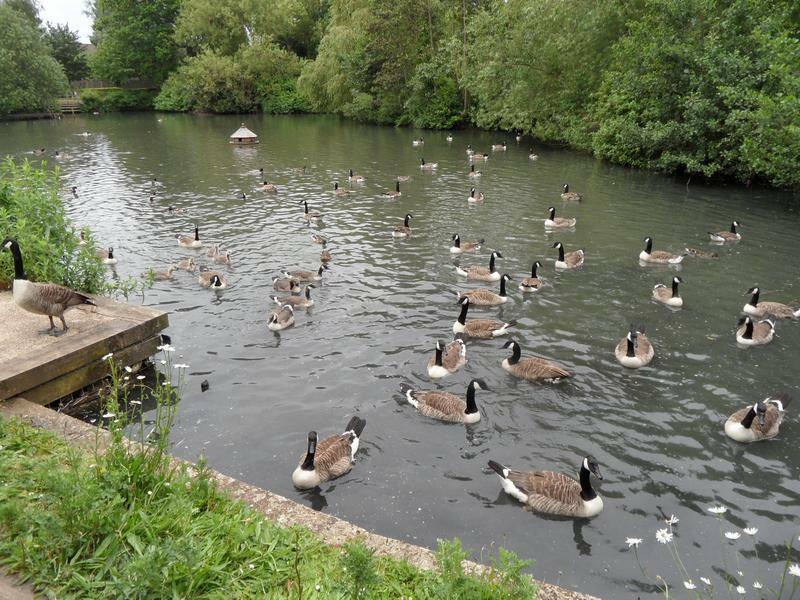 A few more geese near the small island. 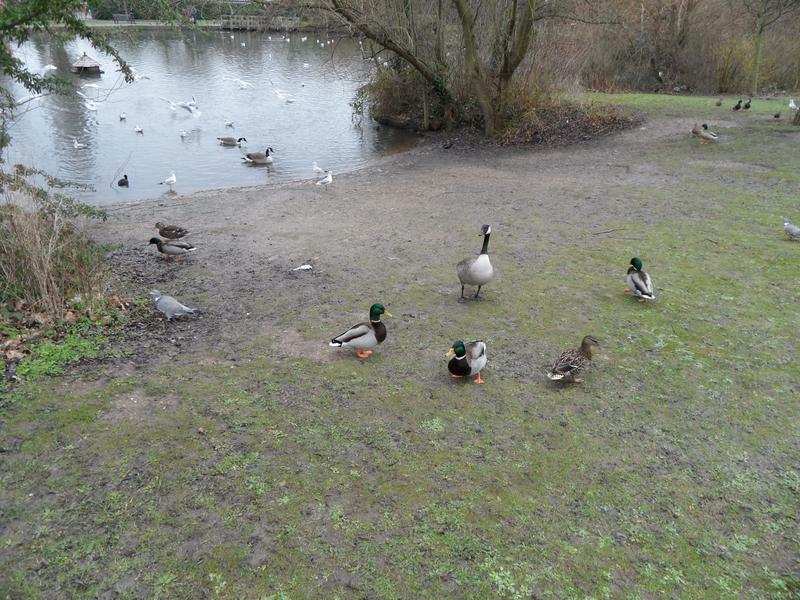 to this park, which does have fewer predators. 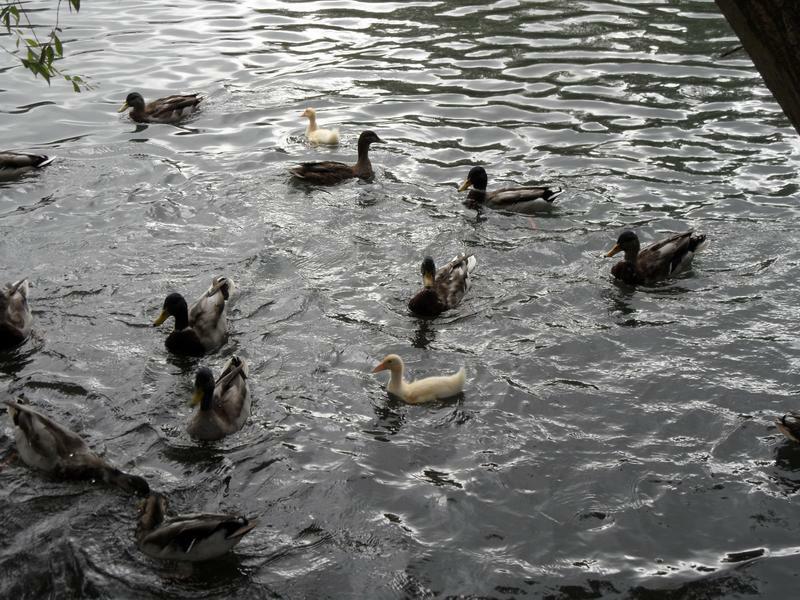 Finished breakfast, swimming off to rest. 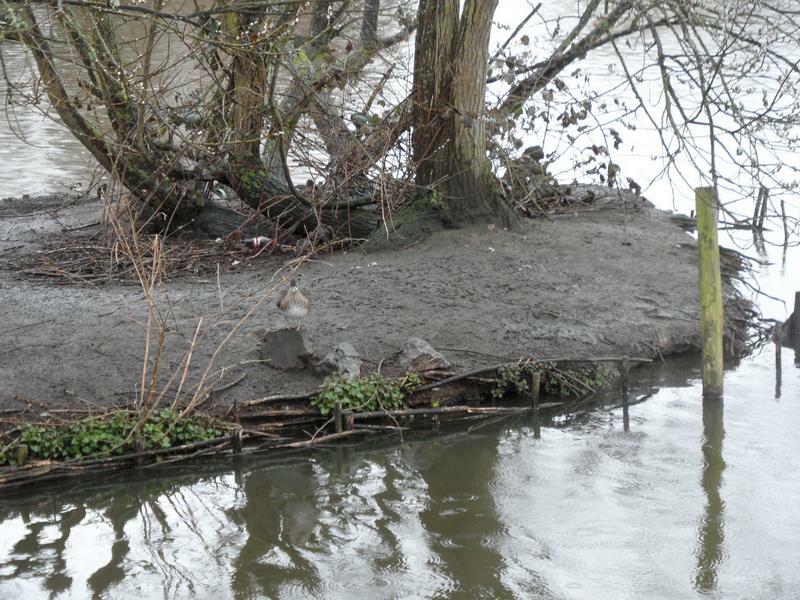 small island, presumably to try and stop erosion of the island by making it harder geese to reach it. 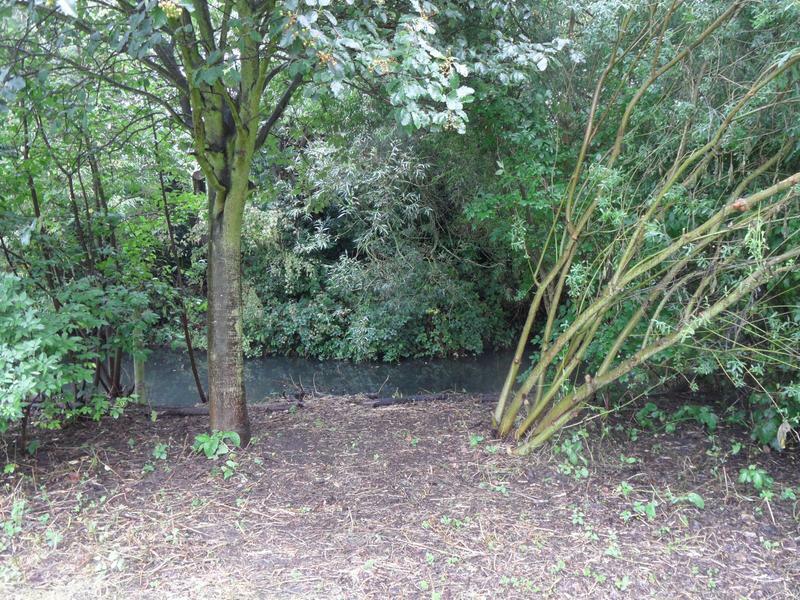 letting more light onto this previously mostly hidden area. 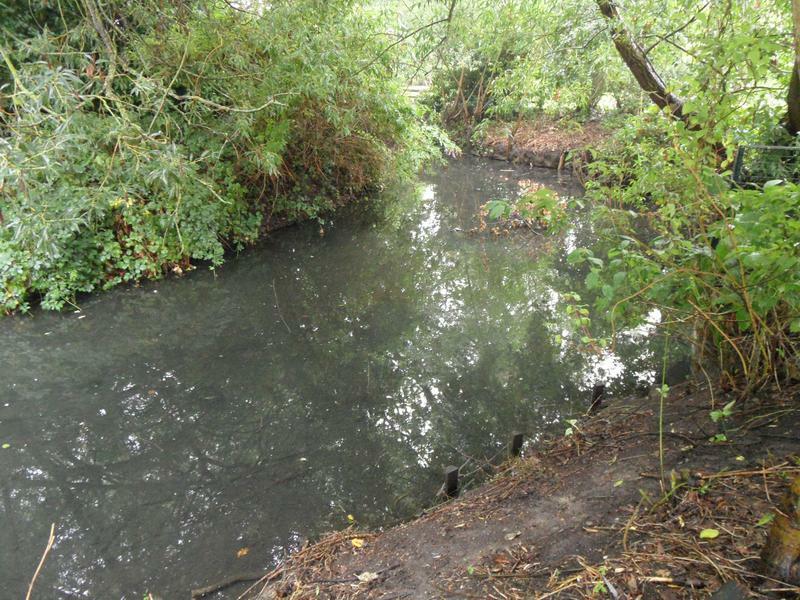 Wider shot of one of the newly cut back areas. 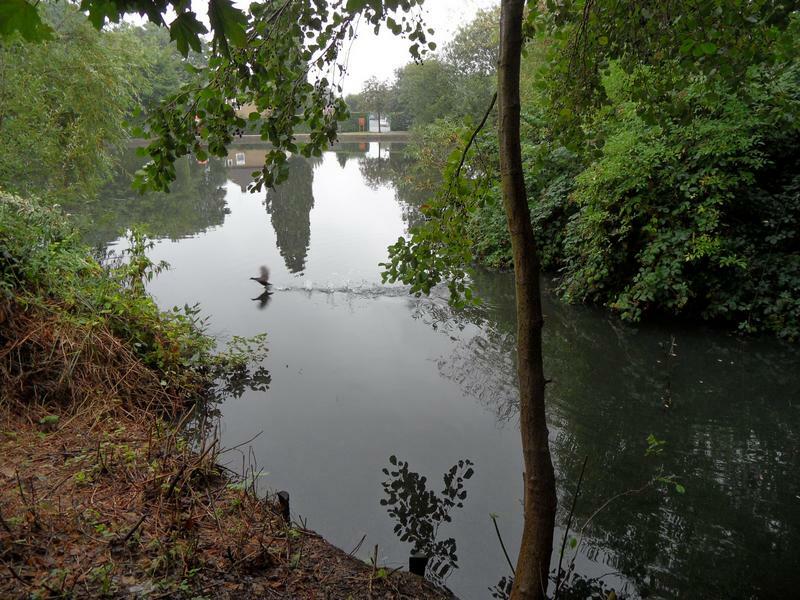 A second cutting gives a new view right across the pond, a Moorhen flying off. 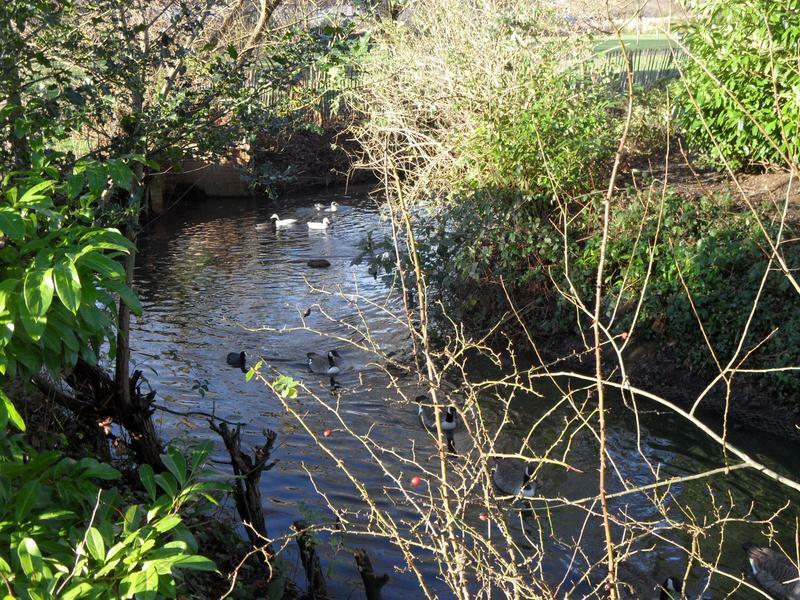 A third cut back area, there was a narrow path here the geese used to leave the pond, but more more accessible now. 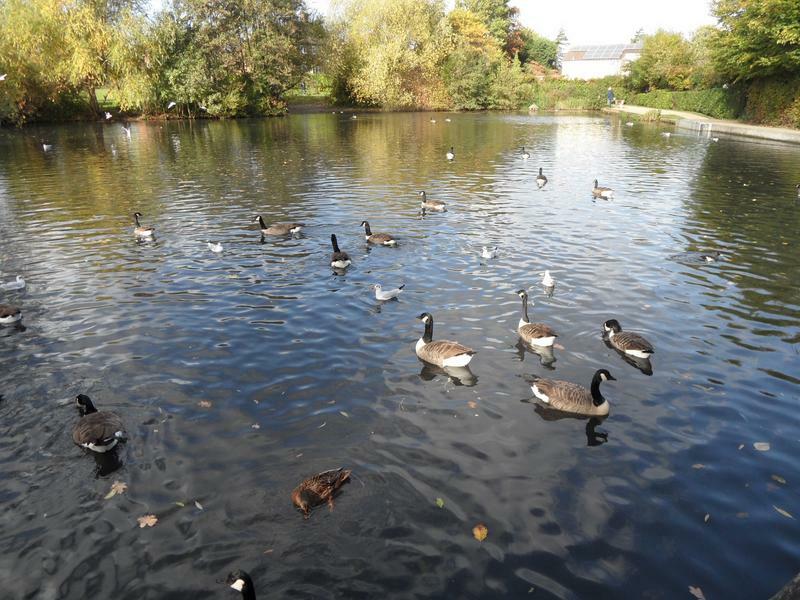 Still quiet at the end of the pond. 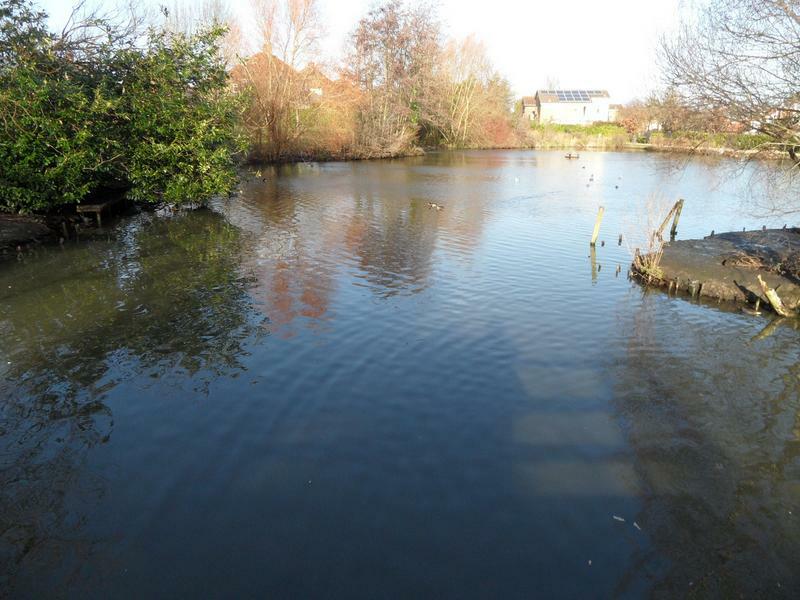 Two of the newly cut back areas can be seen on the far side of the pond. 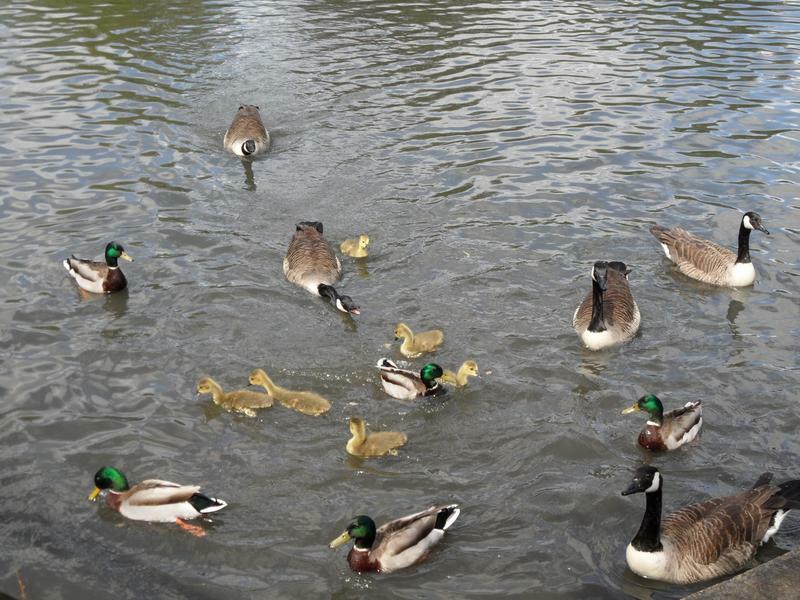 1st September 2013, the pond is busier this week, the new yellow duckling Mallard family heads our way. 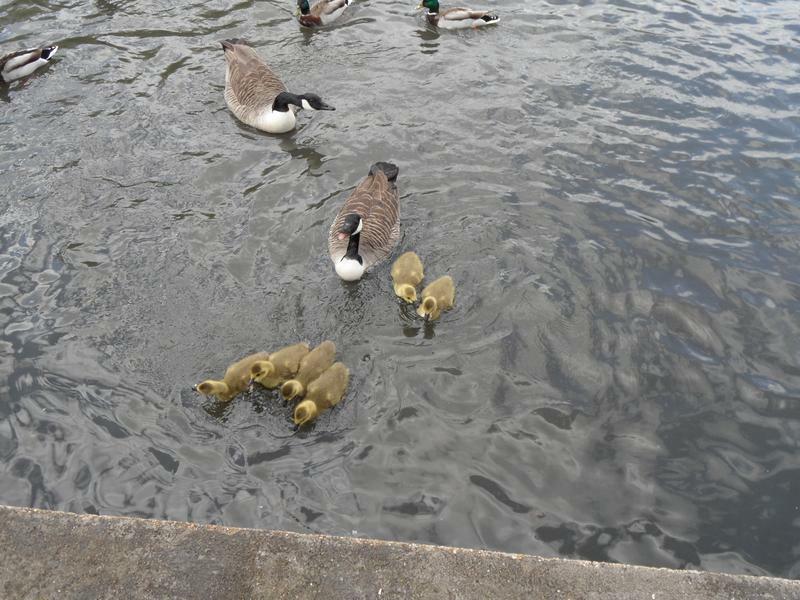 There are still three yellow Mallard ducklings, but they keep getting scattered by geese. 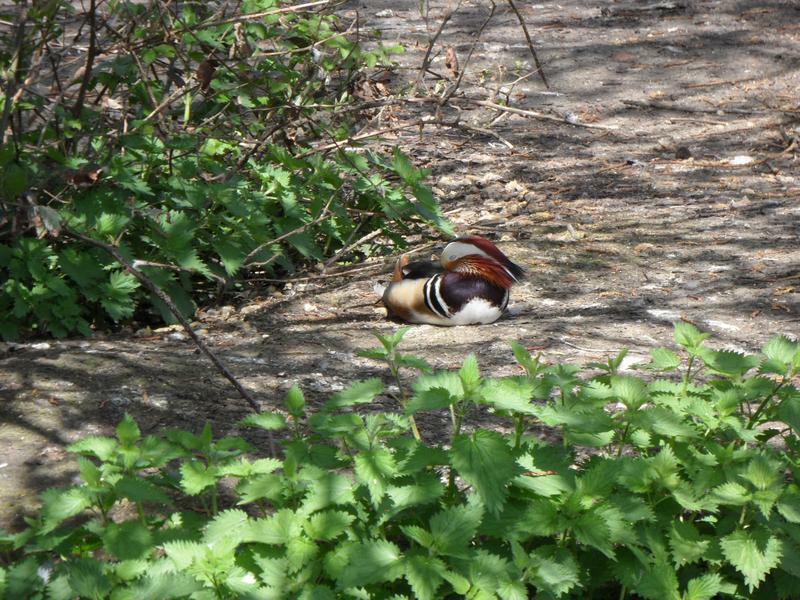 A male Mandarin Duck has full mating colour again. 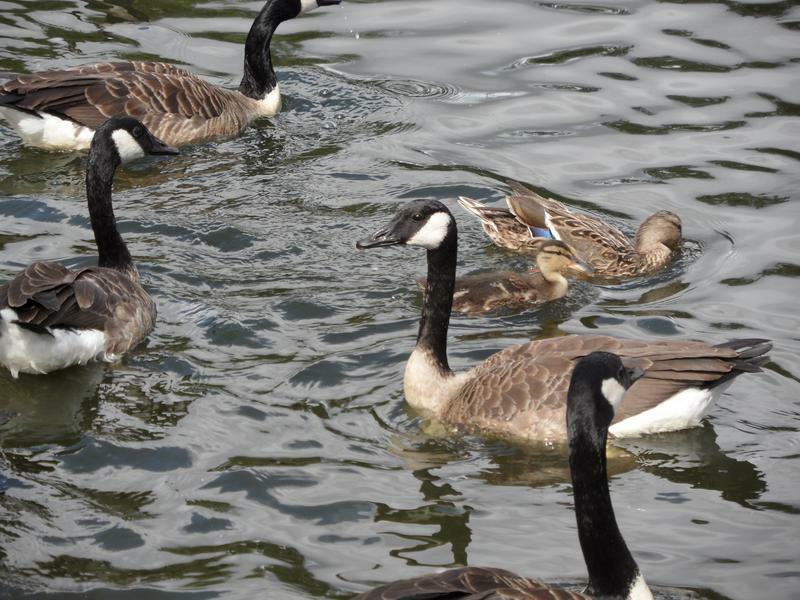 All the Canada Geese have come back from wherever they went last week, the yellow Mallard family can be seen in the background. 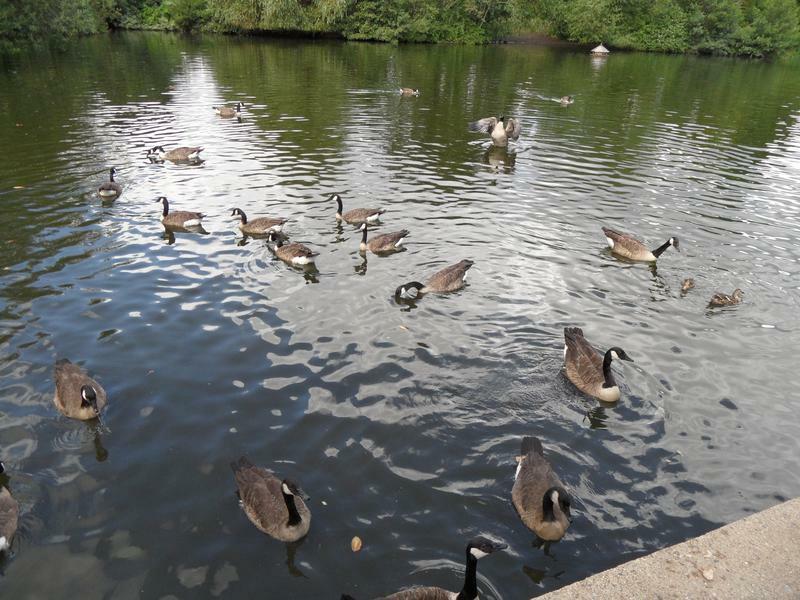 Lots of noisy Canada Geese. 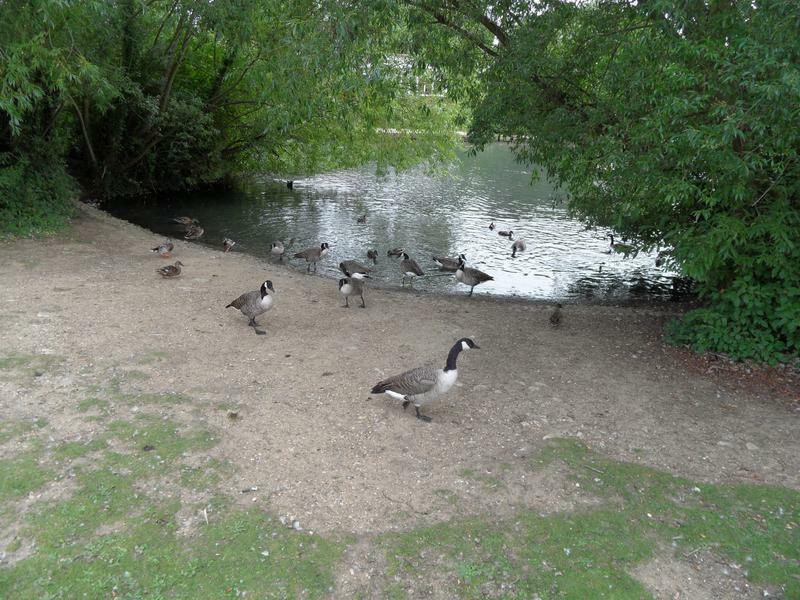 Yet more geese near the beach. 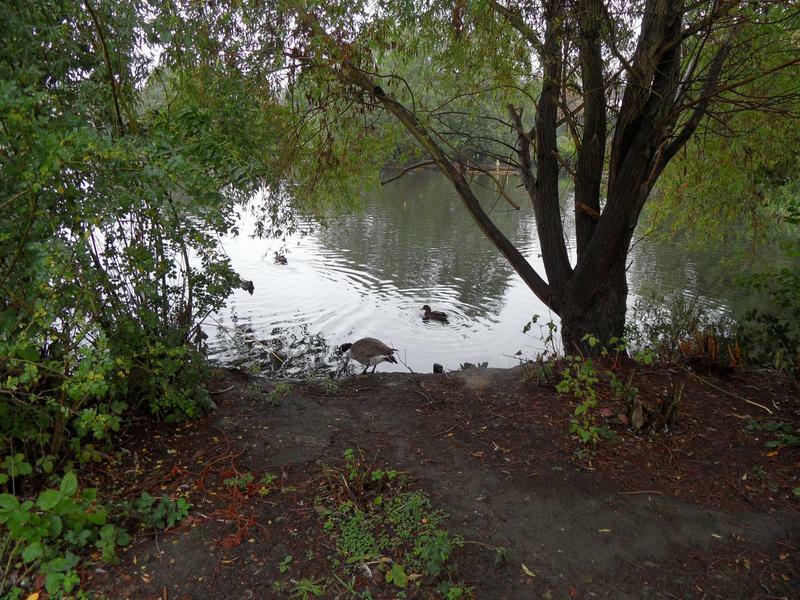 The Muscovy duck is behind the large island with lots of Mallards, staying away from all the geese. 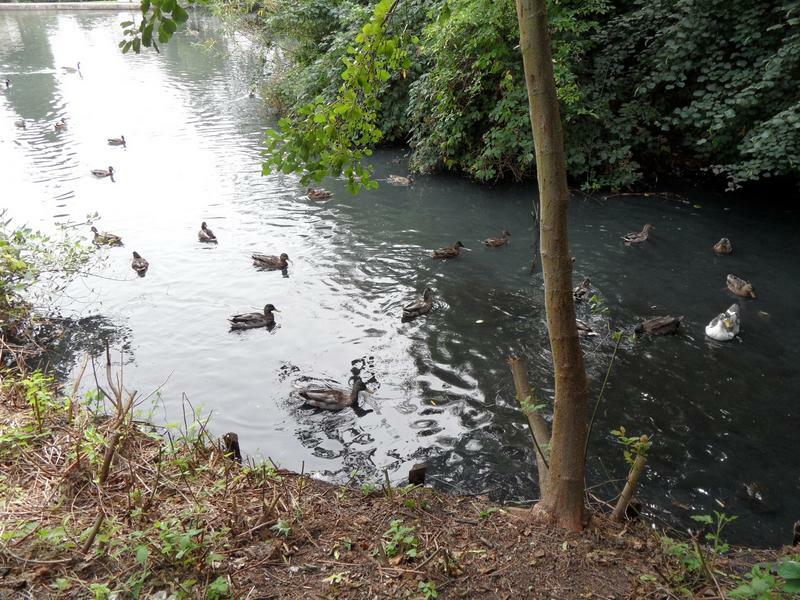 Everything is so much brighter now many trees have been cut back. 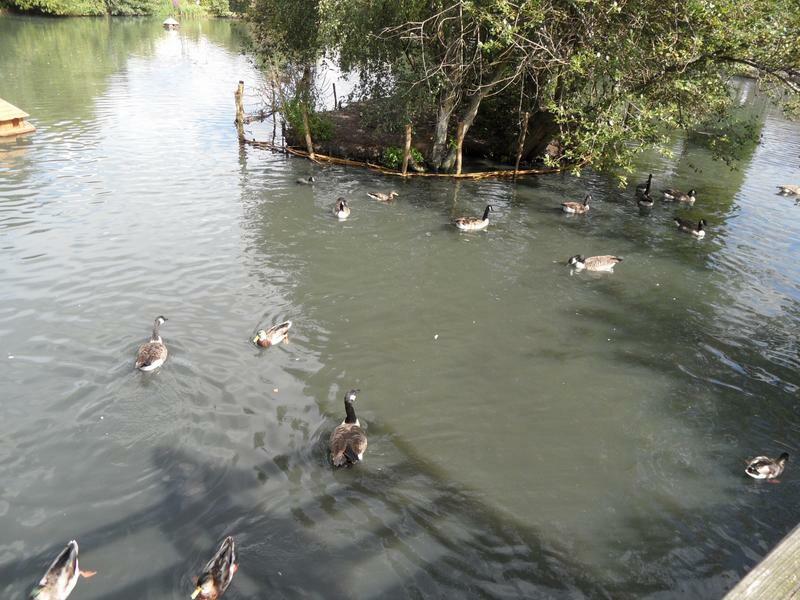 More geese near the small island, and the new fence around the island. 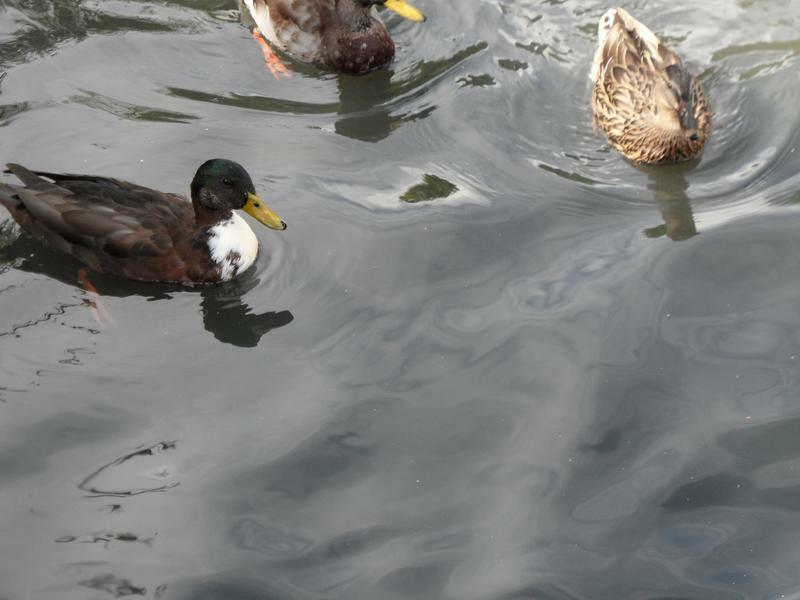 This could be the father of the white ducklings, a male Mallard with white chest. 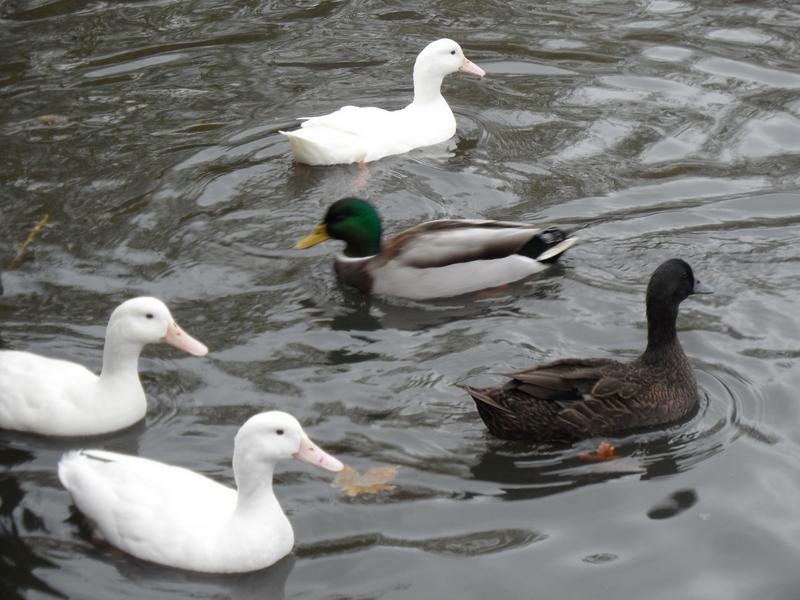 The white ducklings lose interest quickly, and swim away in the distance. 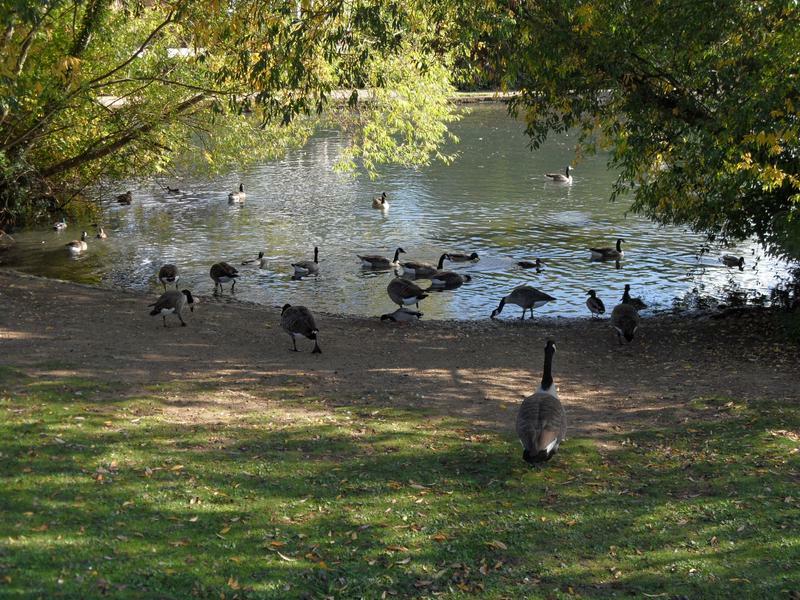 But then re-appear on the beach on the far side of the pond. 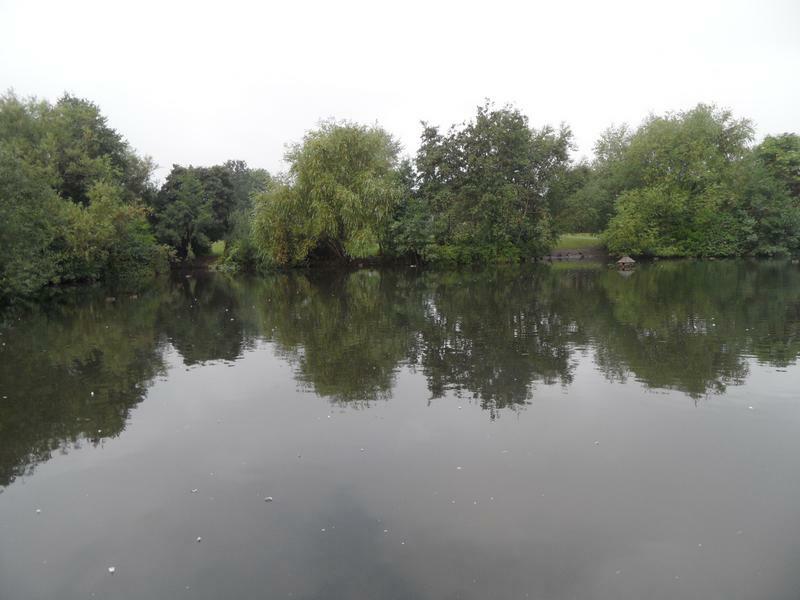 Still pleased this view has been opened up. 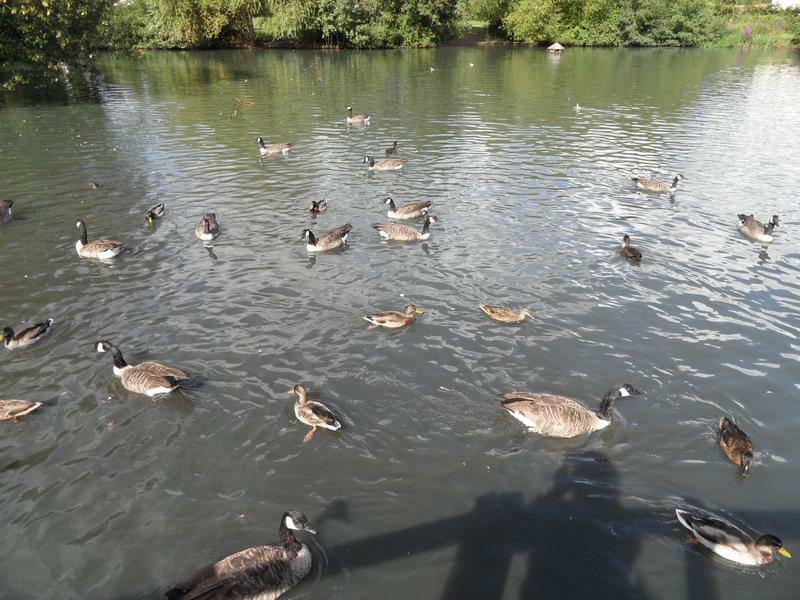 Quite a few Canada Geese this week. 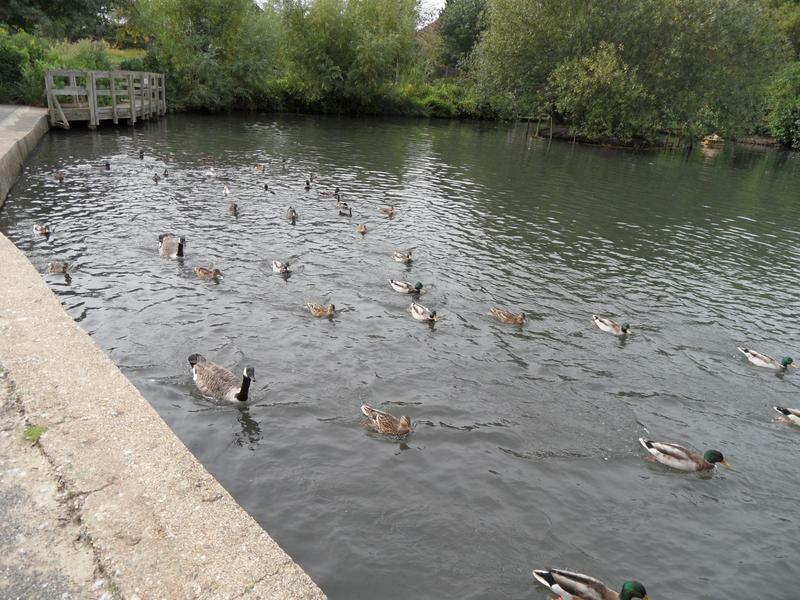 12th September 2013, Mallards feeding on the grass. 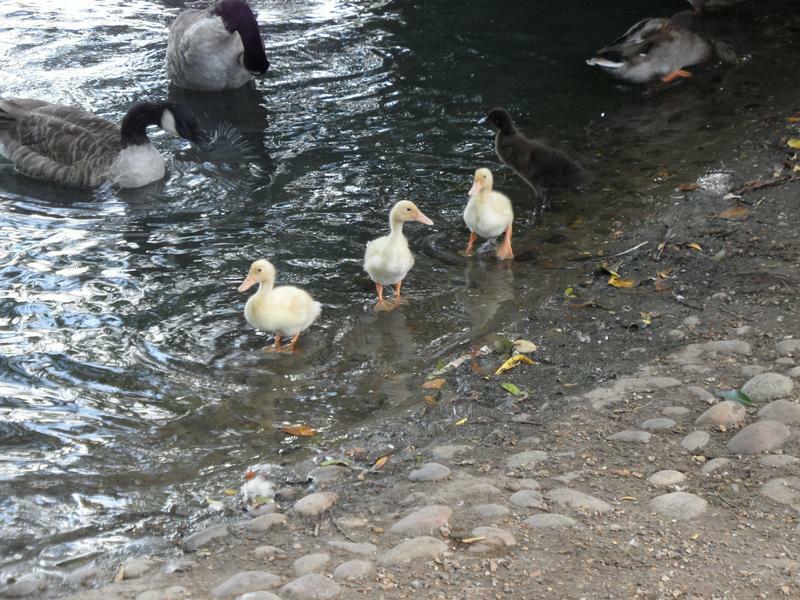 The white Mallard ducklings again. 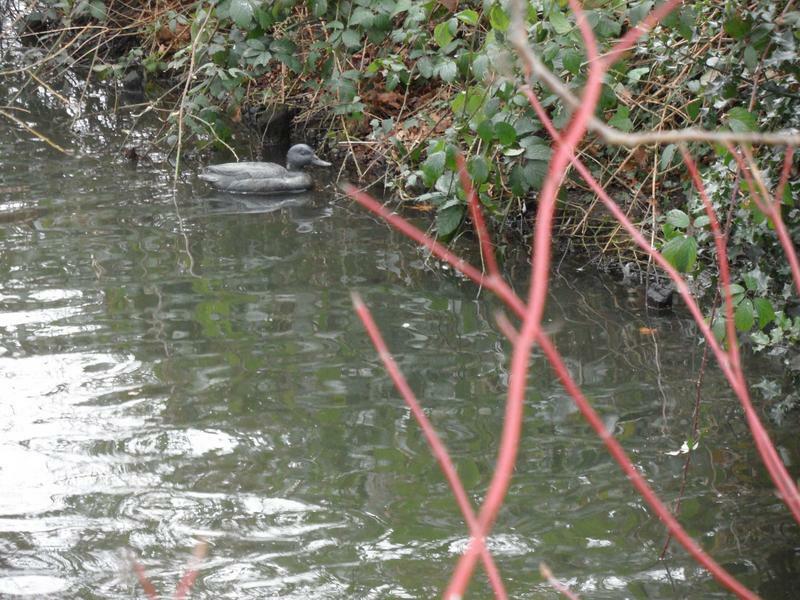 A Mallard looking into the Moorhen nesting box. 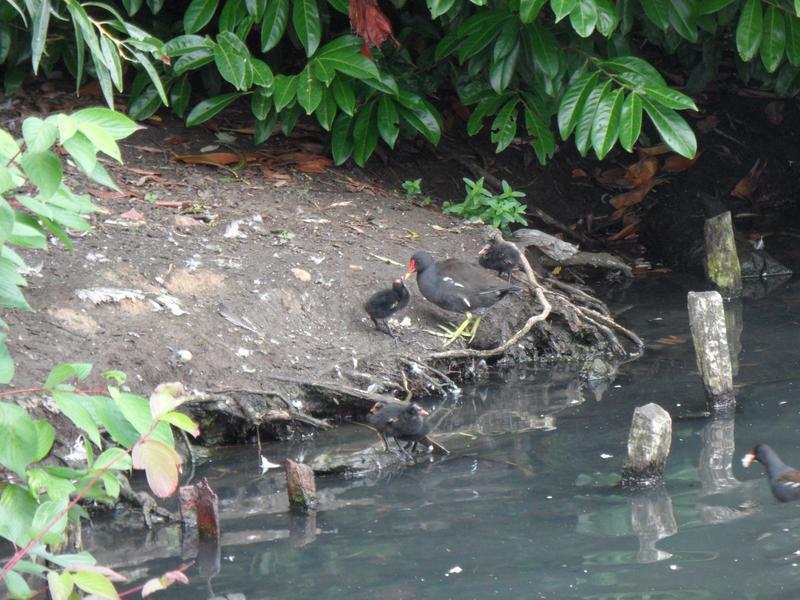 A Moorhen family living on the large island, mother and four chicks. 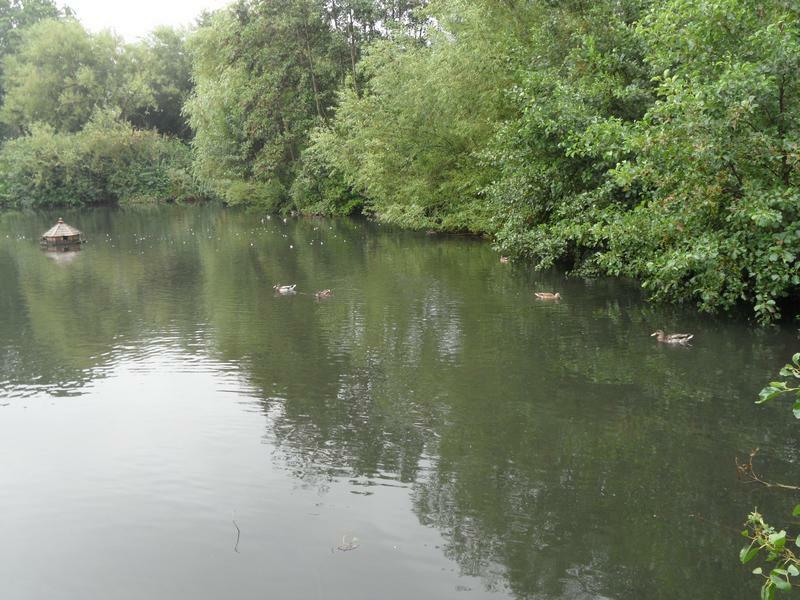 17th September 2013, lots of ducks heading our way for breakfast, including the while Mallards in the distance. 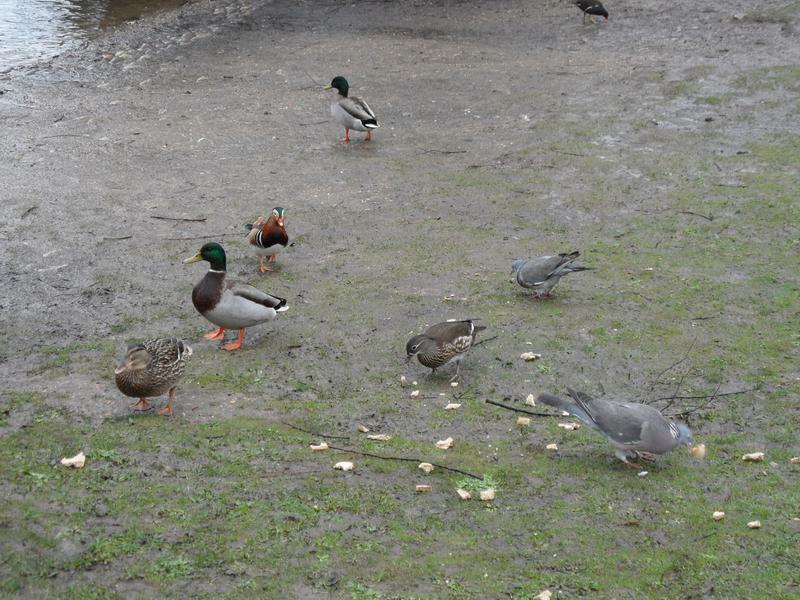 The third while Mallard is still here, but seems to wander off easily. 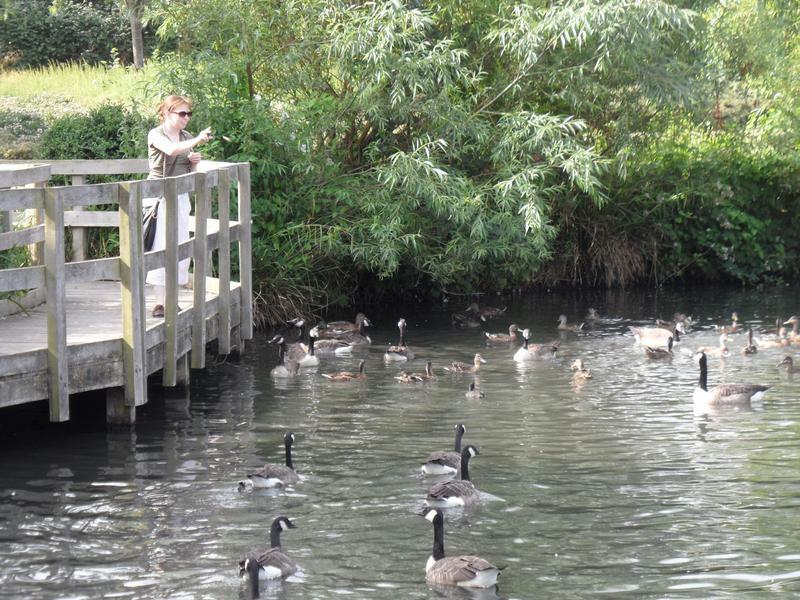 All the birds following us along the pond. 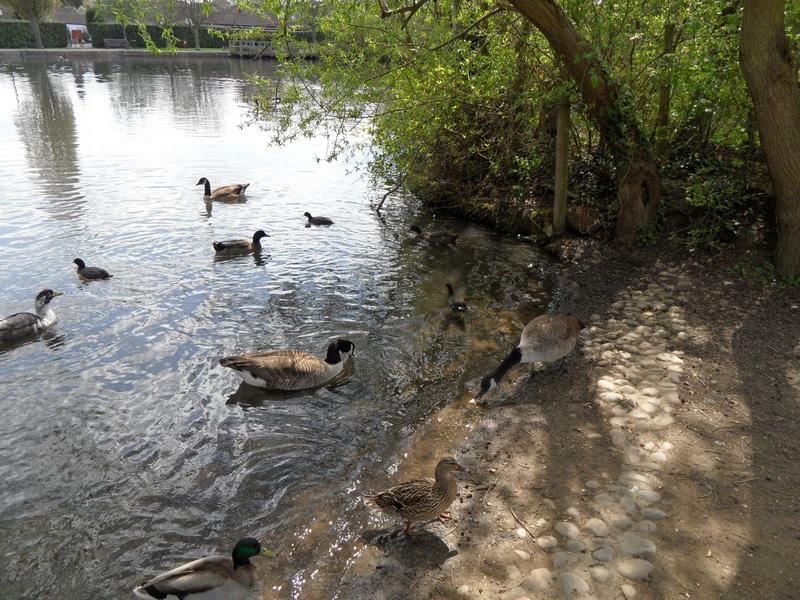 And we've now all reached the beach area. 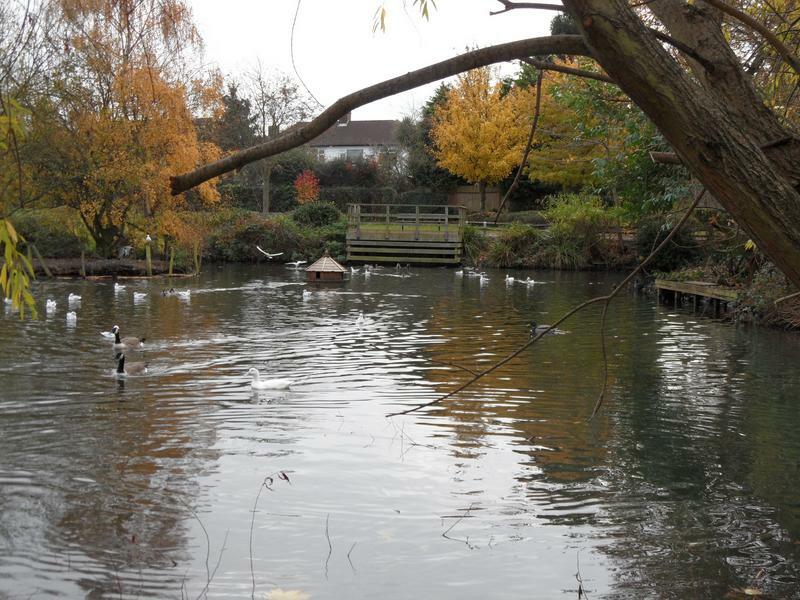 View back across the pond. 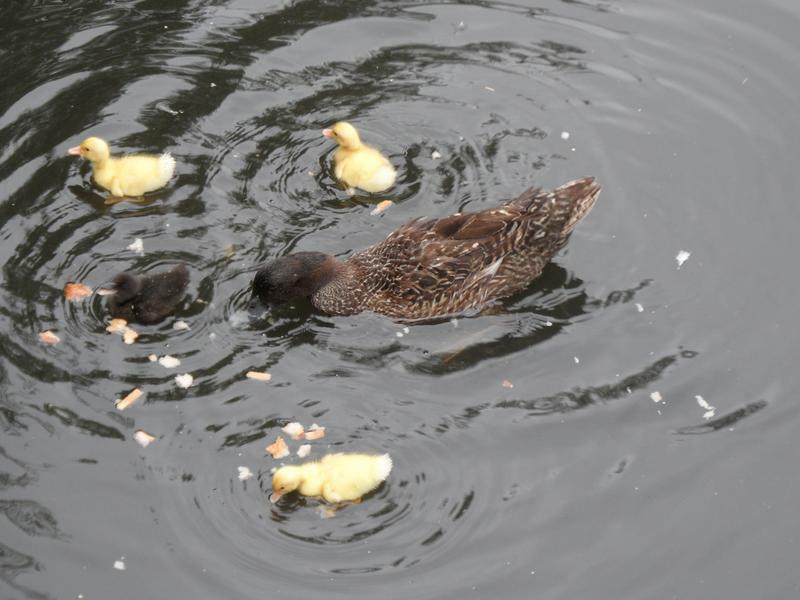 The Moorhen chicks being fed on the island last week are now all in the water, with a Mallard trying to take food away from mother. 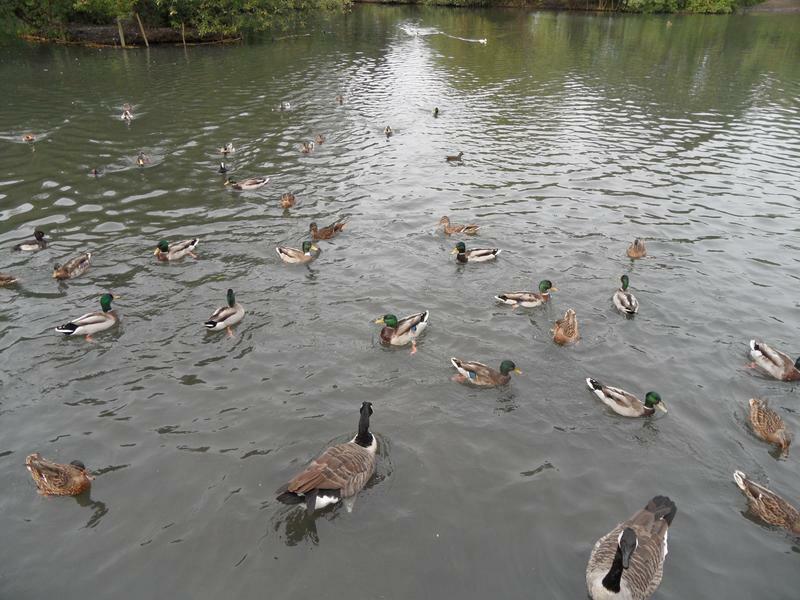 see the same ducks each visit. 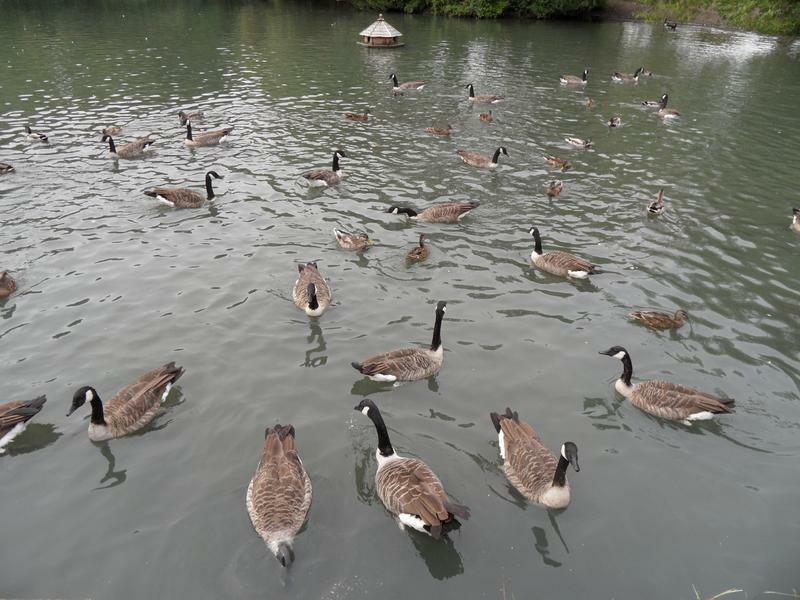 Not that many geese this week. 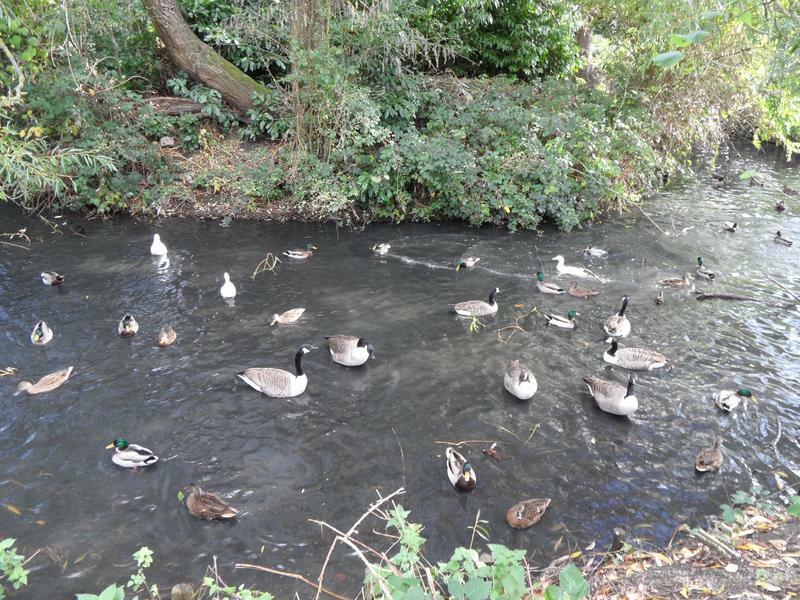 6th October 2013, More geese this week. 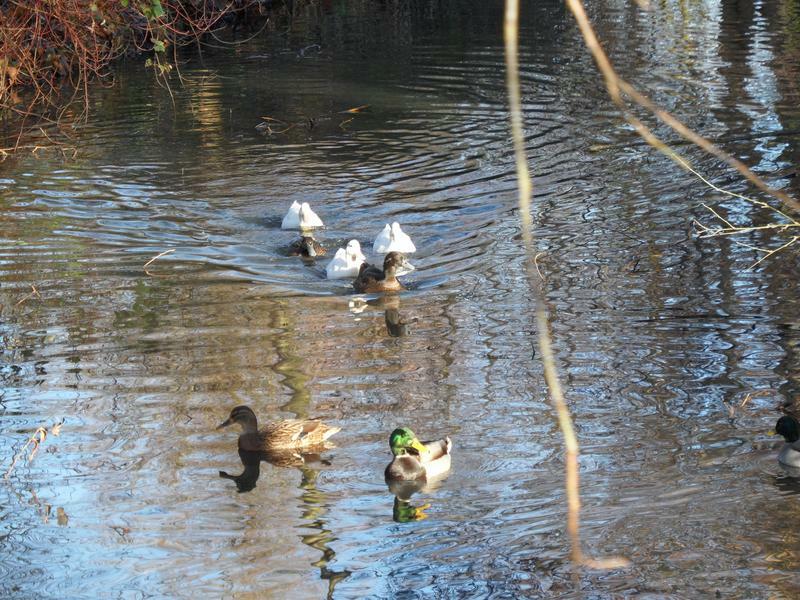 The white Mallards are still playing around the small island. 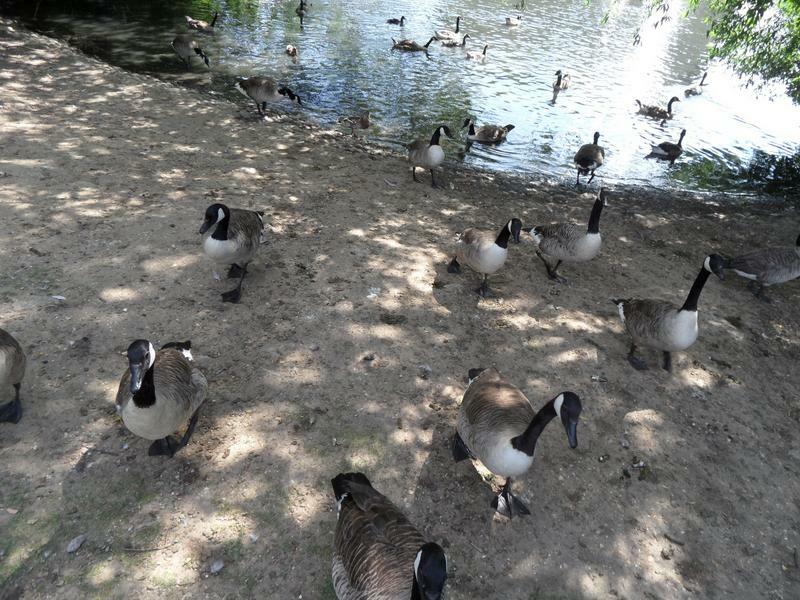 A lot more geese over at the beach area. 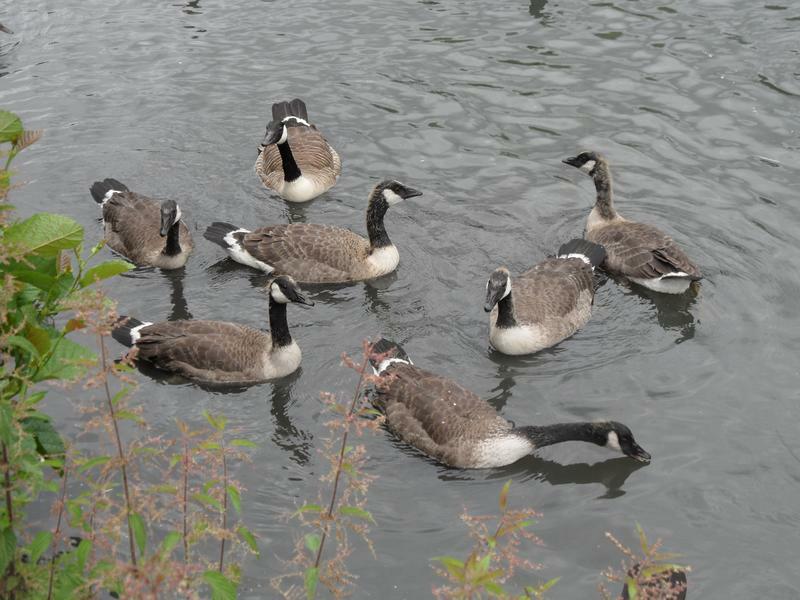 should be flying by now, but maybe they have decided to stay together here for the winter. 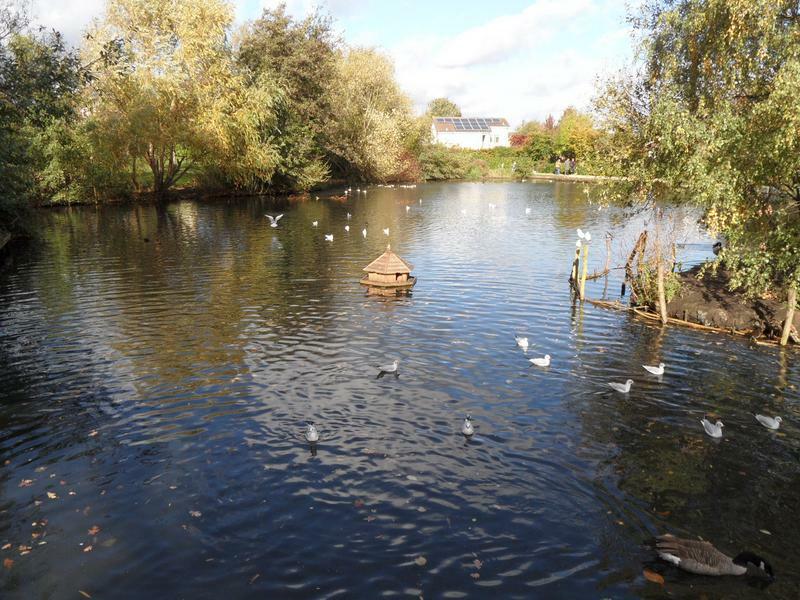 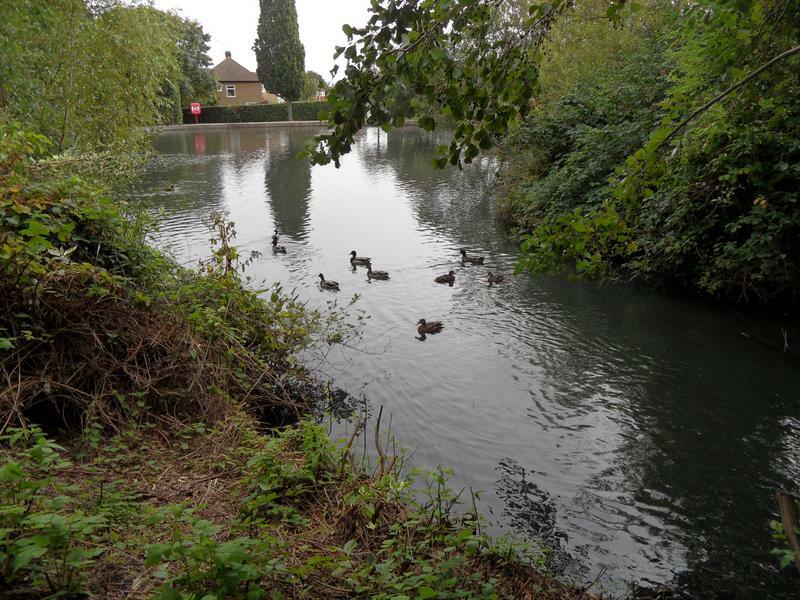 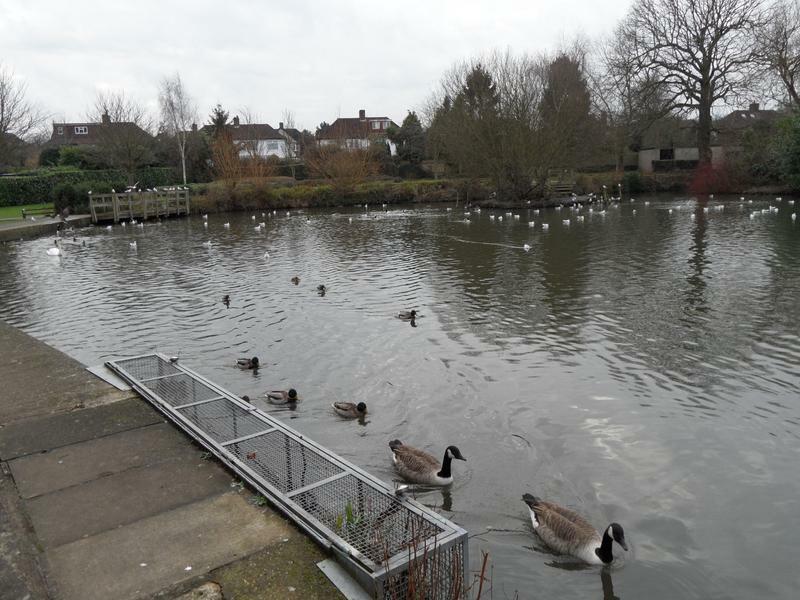 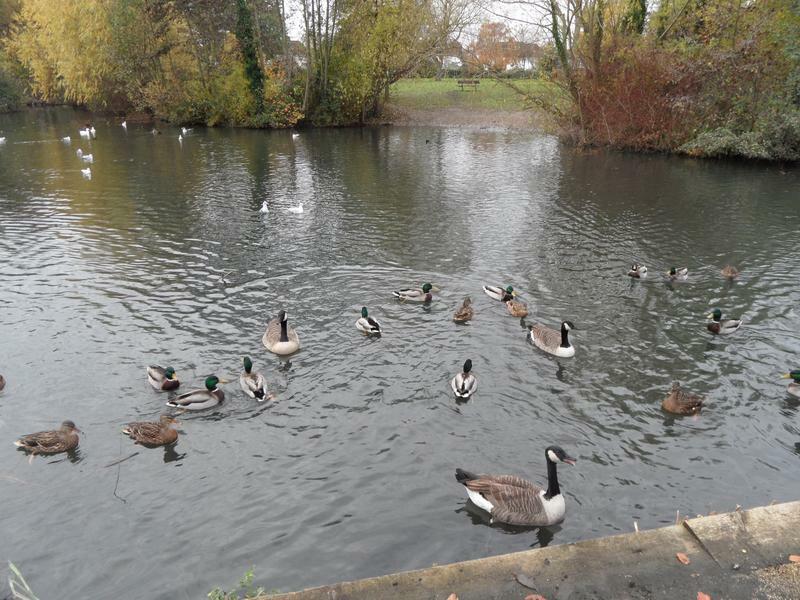 27th October 2013, the sea birds have started returning to this pond for the winter, very noisy and diving onto any bread. 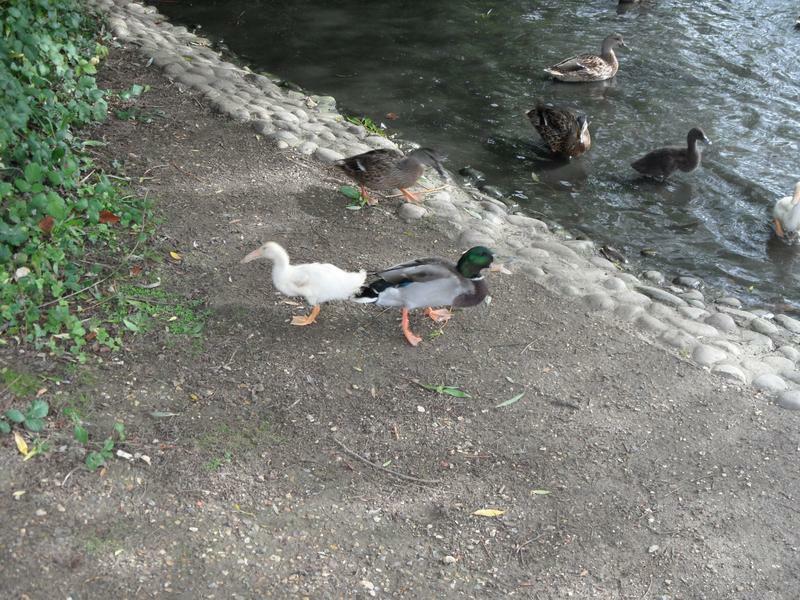 The White Mallards must be nine or 10 weeks old now, but are still staying together. 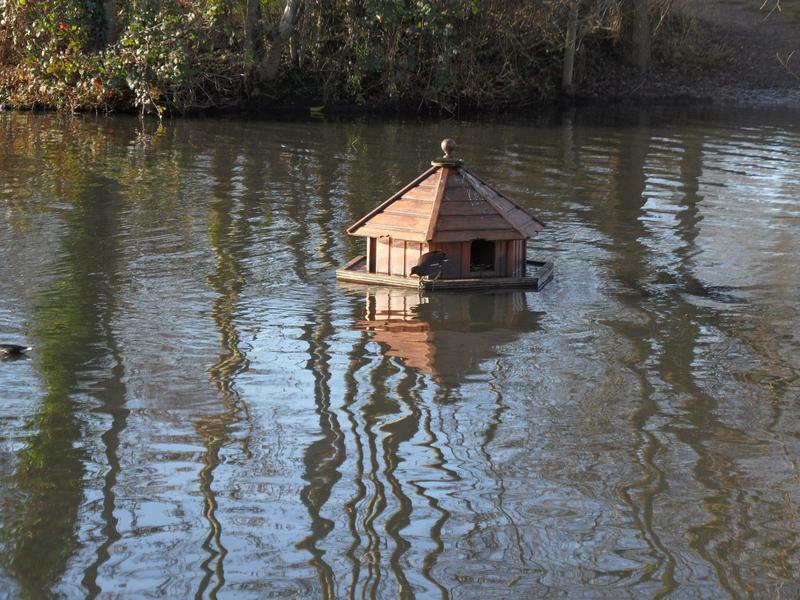 box that been hidden previously. 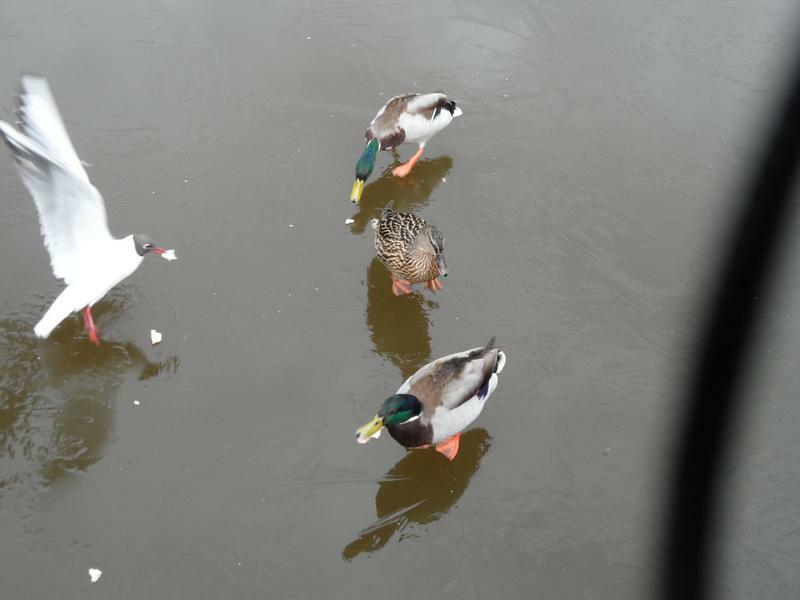 The other side of the large island, the White Mallards are still following us around. 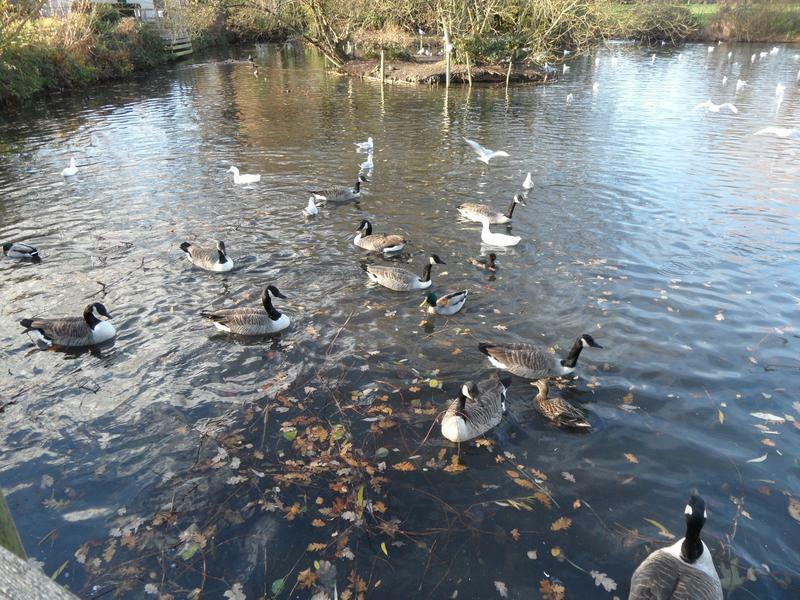 3rd November 2013, the Canada Geese have returned, with lots of noisy seagulls, only a few ducks can be seen here. 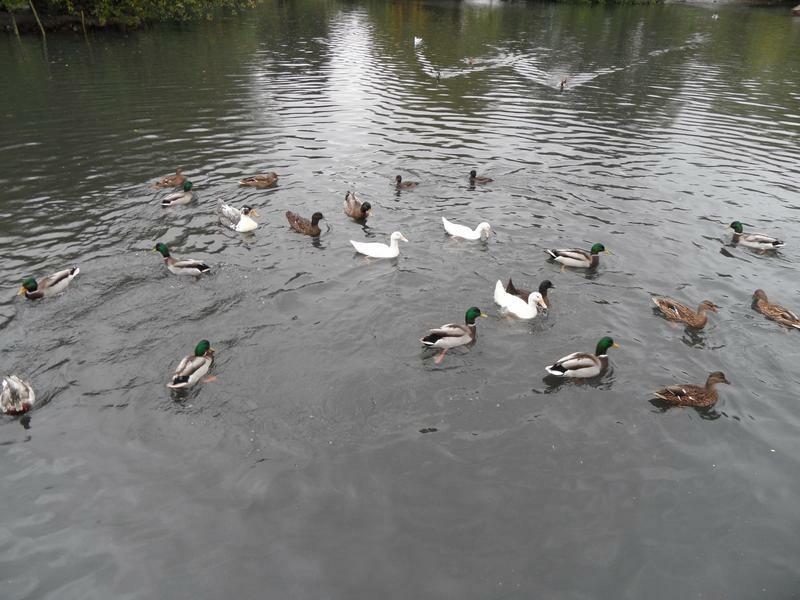 A lof the Mallards and some geese are hiding behind the large island, including the White Mallard family. 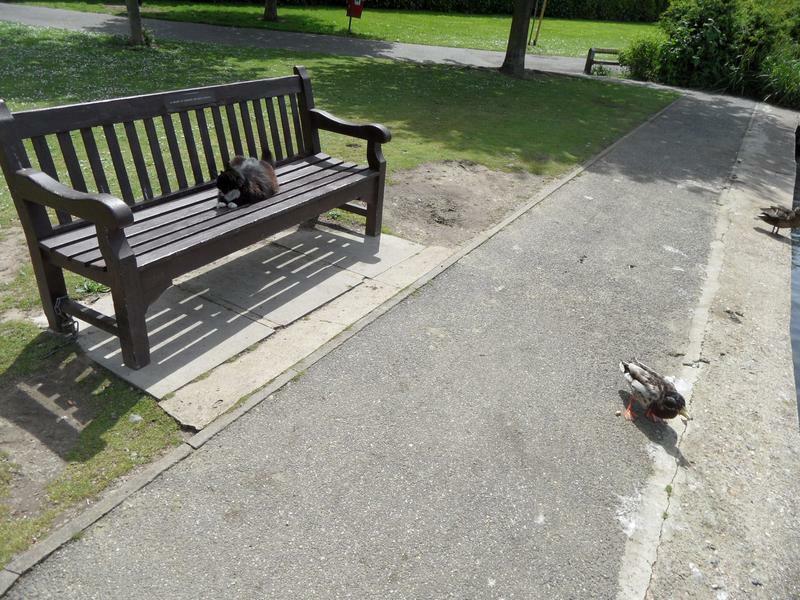 Seen this black cat in the park a few times. 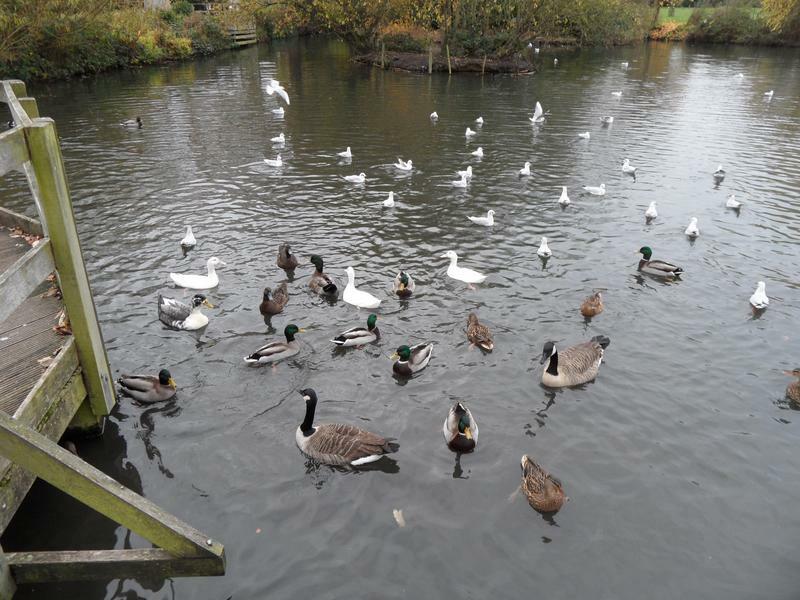 Not many birds looking for food here. 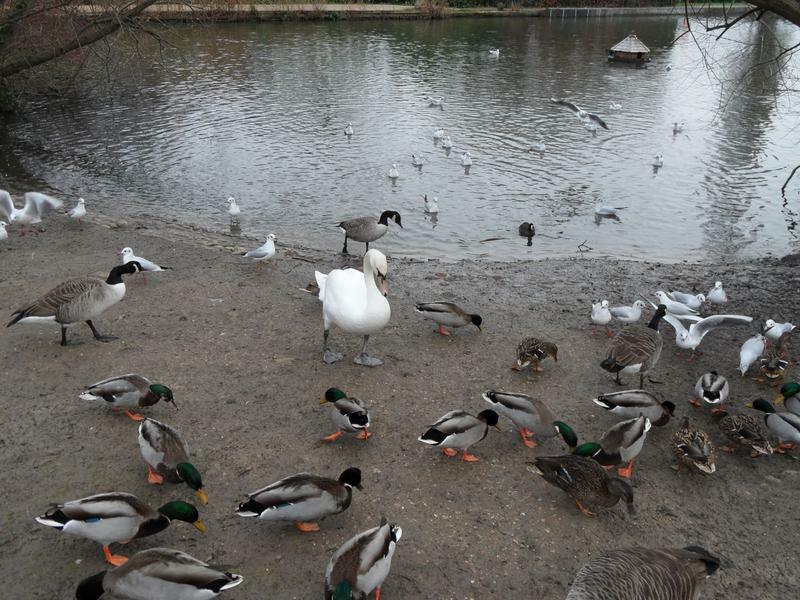 the seagulls continually swoop in to eat any food. 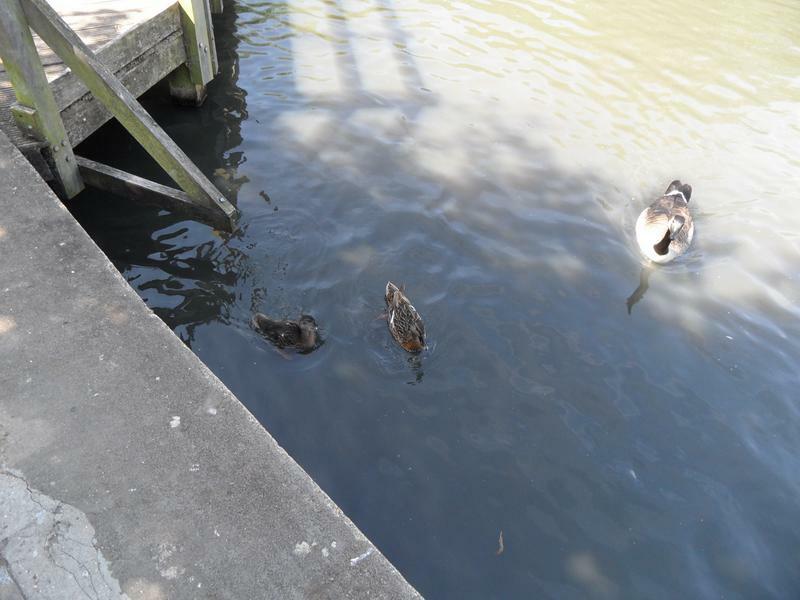 The four Mallard ducklings, and one adult boy. 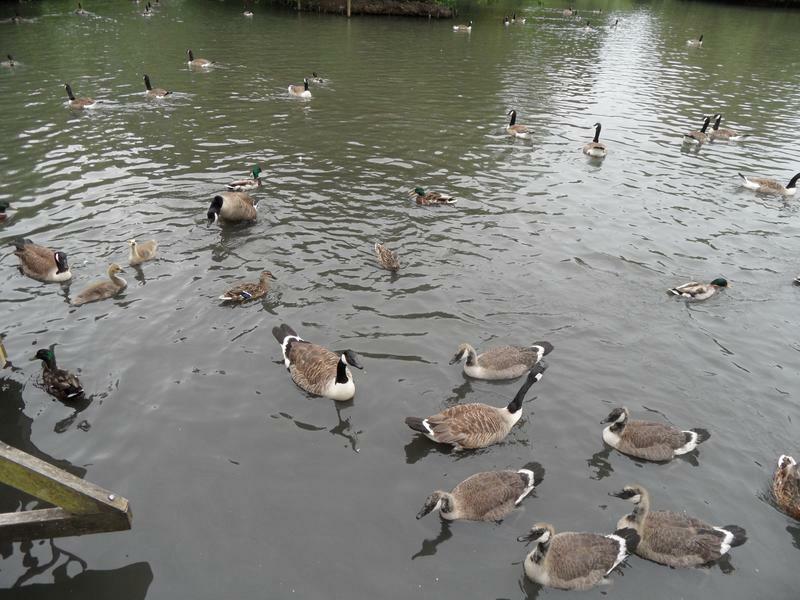 All still looking for food. 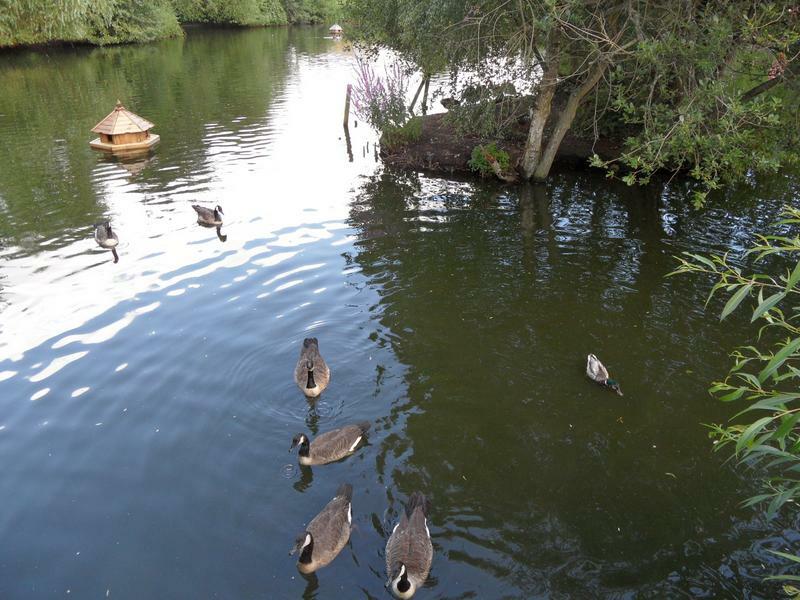 View across the pond of the two islands and the feeding station. 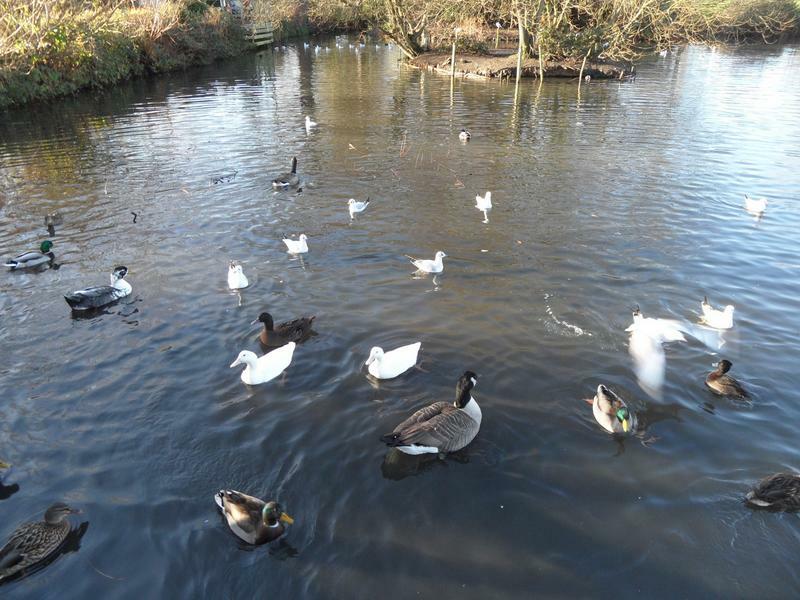 1st December 2013, all the usual suspects, Tufted Ducks, Mallards, Coots, Canada Geese and seagulls. 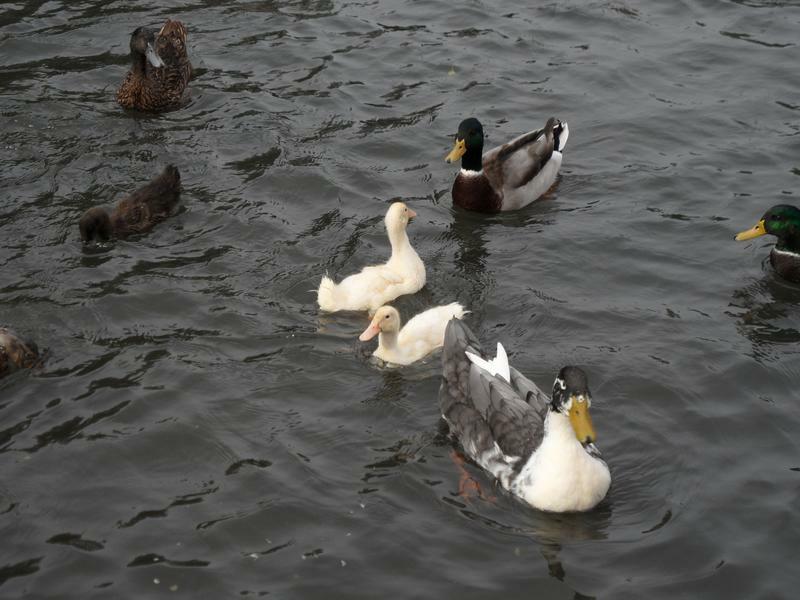 The White Mallard family does not seem hungry today, swimming away. 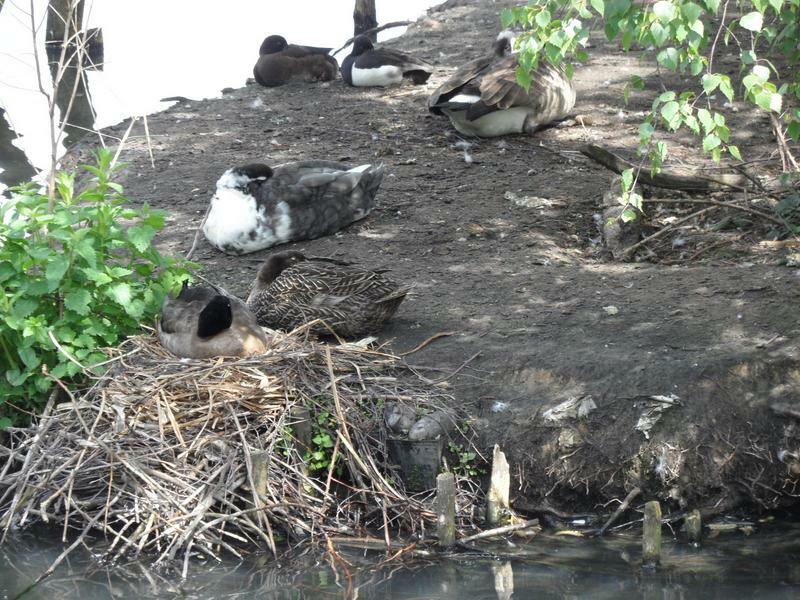 But a lot of Ducks are resting on the newly cleared large island. 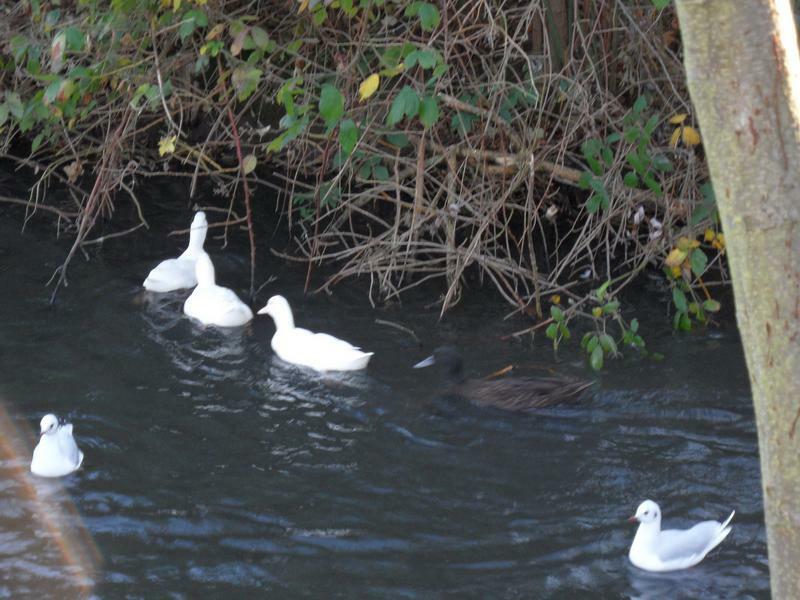 Including the White Mallard family, with a Moorhen and a Coot. 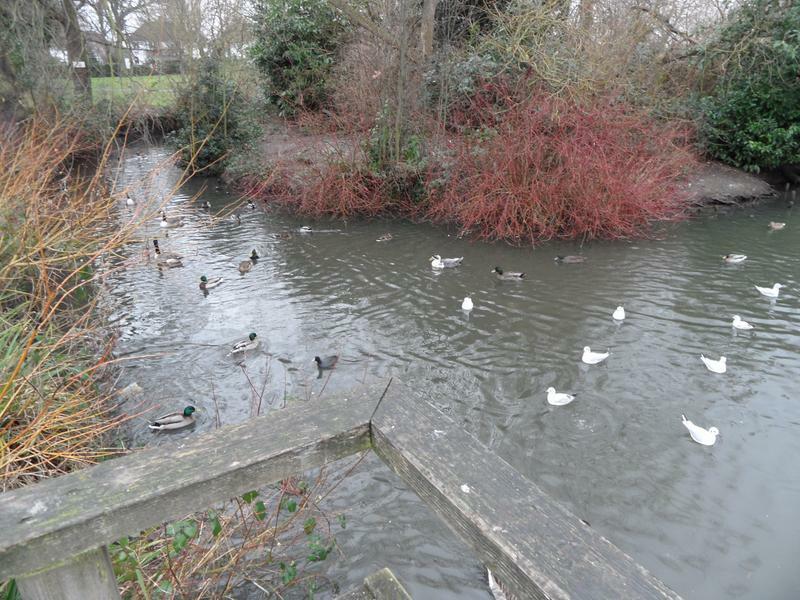 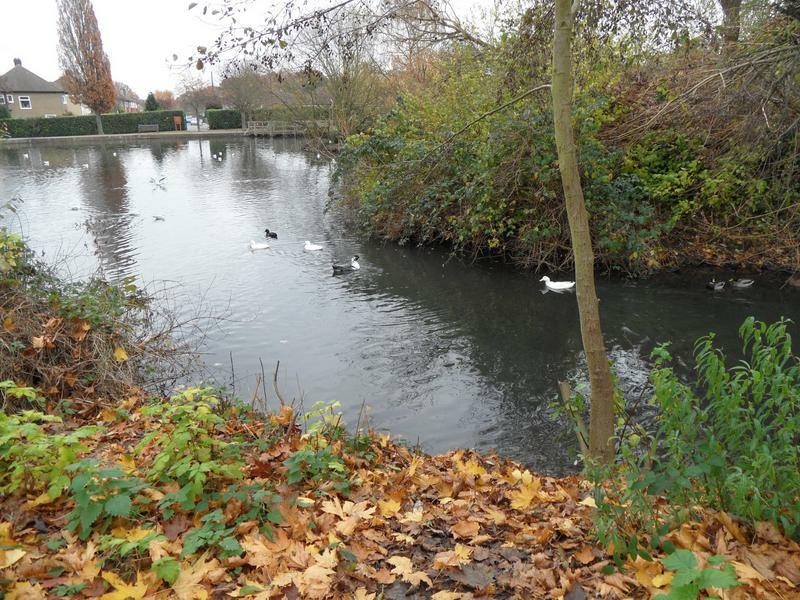 8th December 2013, recent storms have deposited a lot of leaves in the pond. 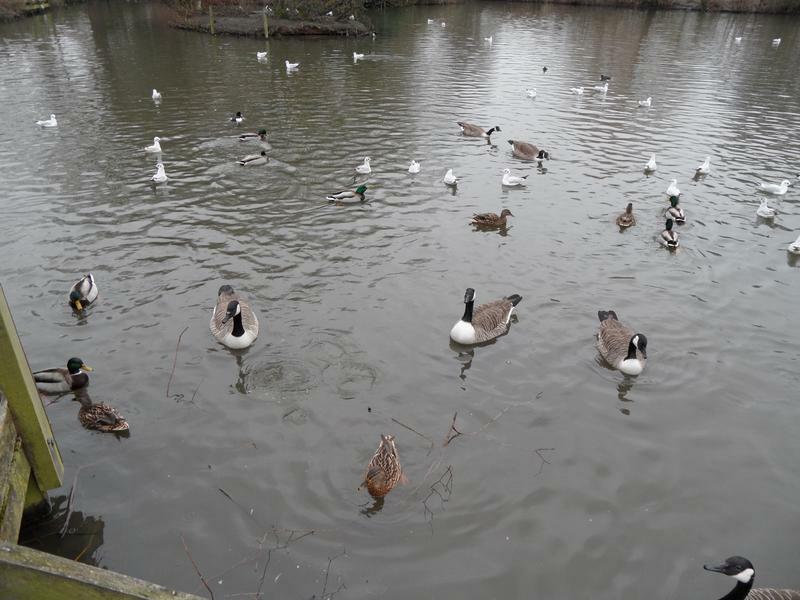 Mallards, Canada Geese and gulls. 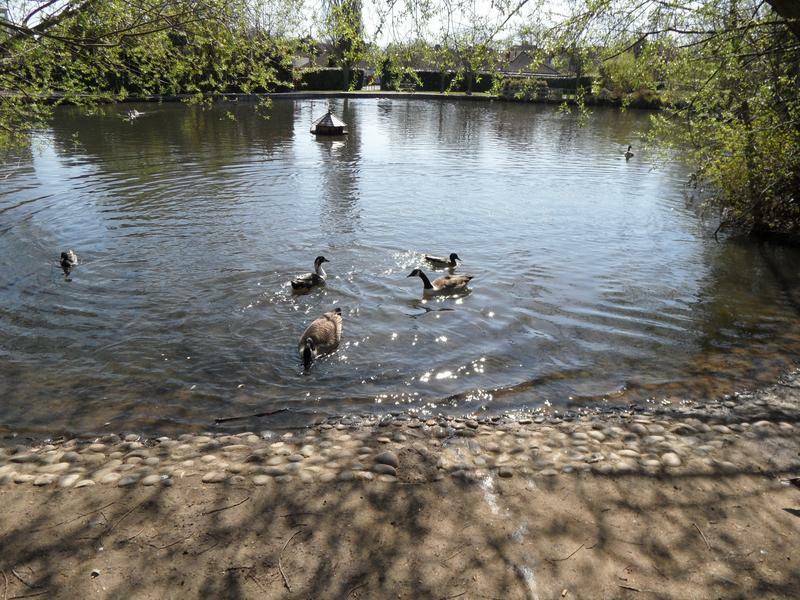 The geese are wary of Lucy the dog. 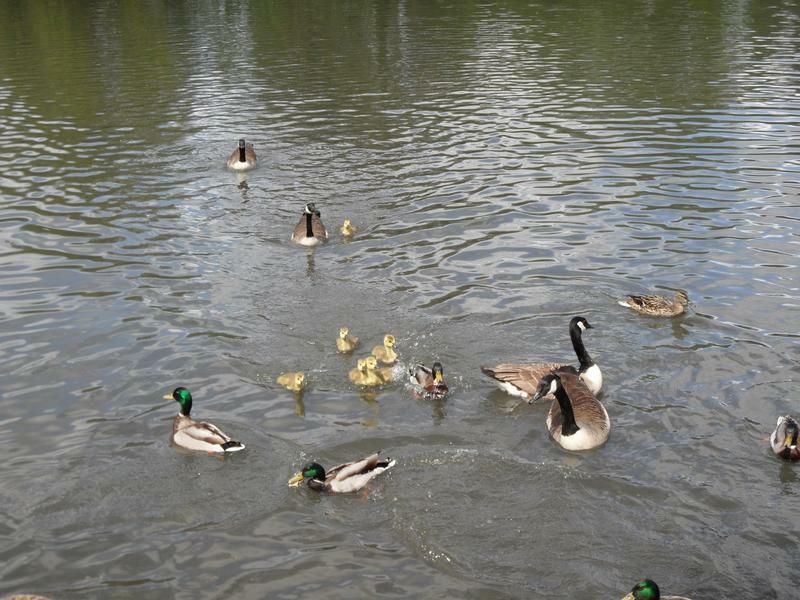 The family of four fully grown ducklings is behind the large island. 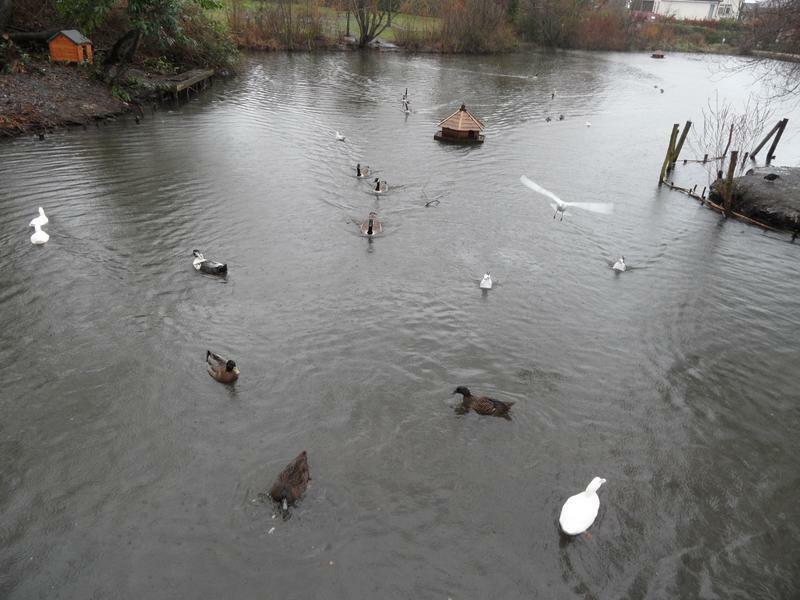 More gulls than ducks today. 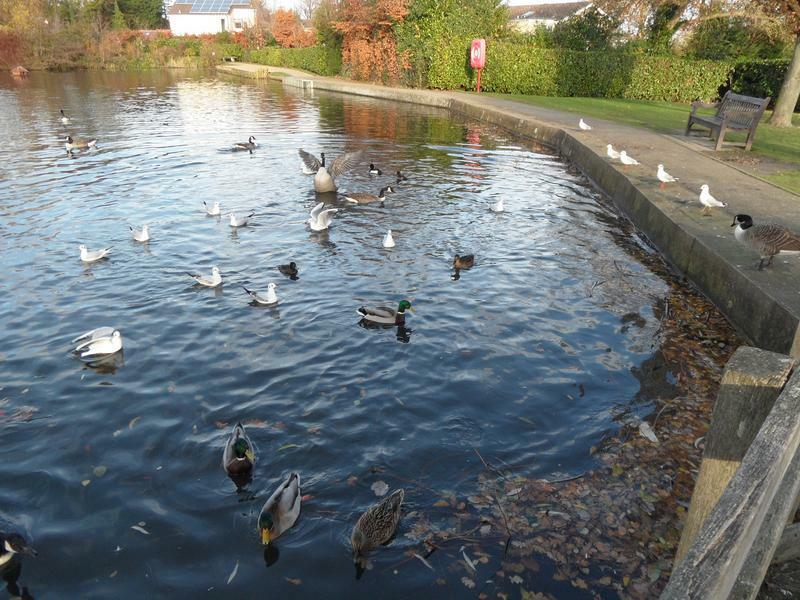 19th December 2013, fewer gulls this week, lots of hungry ducks. 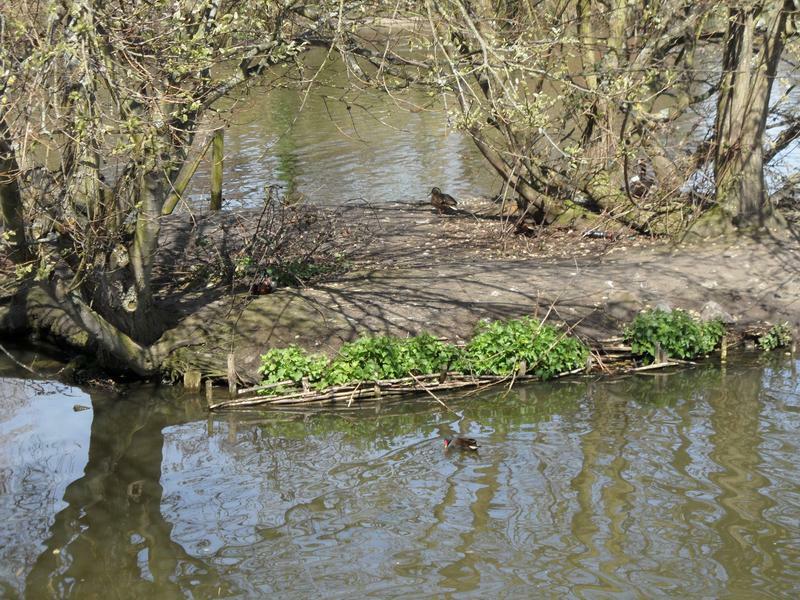 A Moorhen leaving the nesting box. 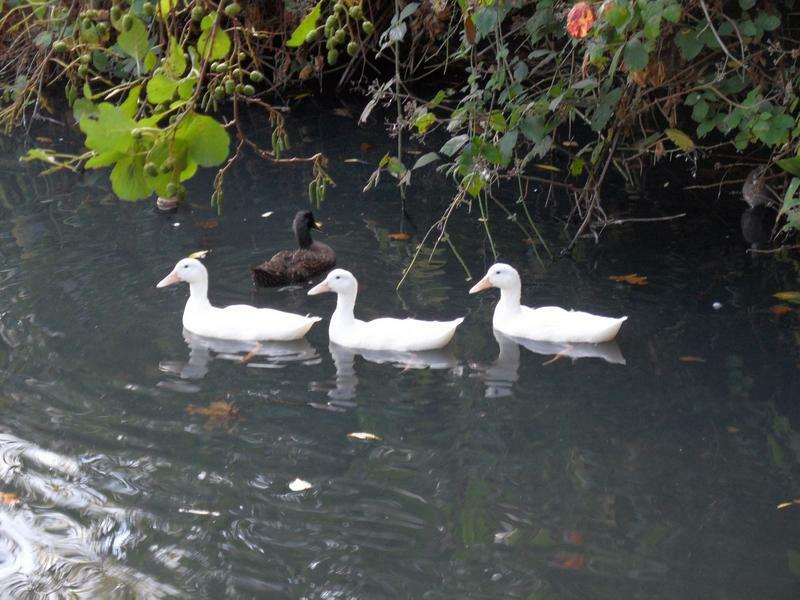 The white duck family heading our way for more food. 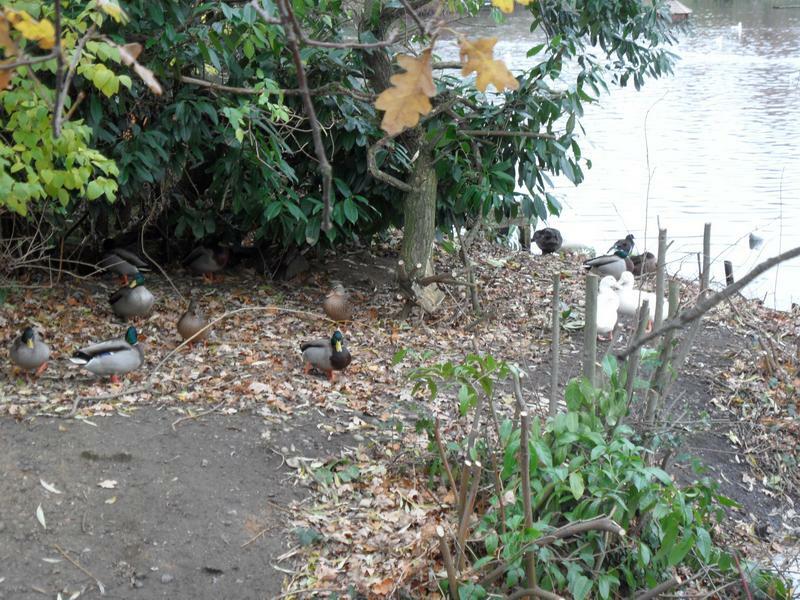 26th December 2013, various ducks and geese behind the large island, White Mallard family at the back. 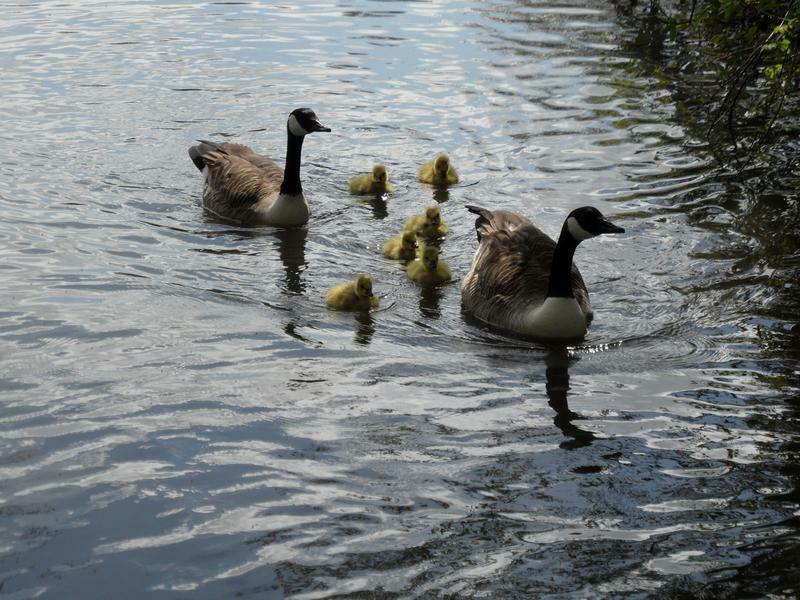 Who continue to follow us around the island. 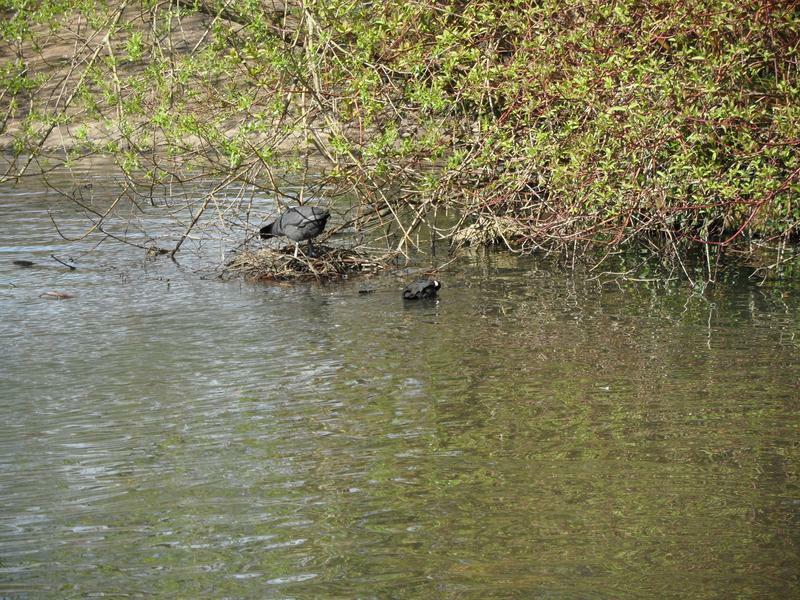 Note sure of these two birds, probably young Moorhens, but they should have red bills by now and be darker. 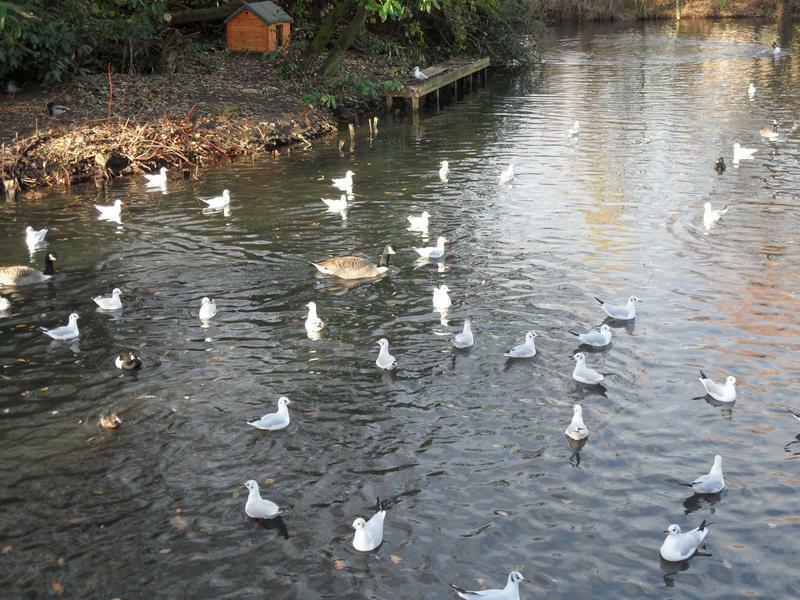 A few more gulls this week. 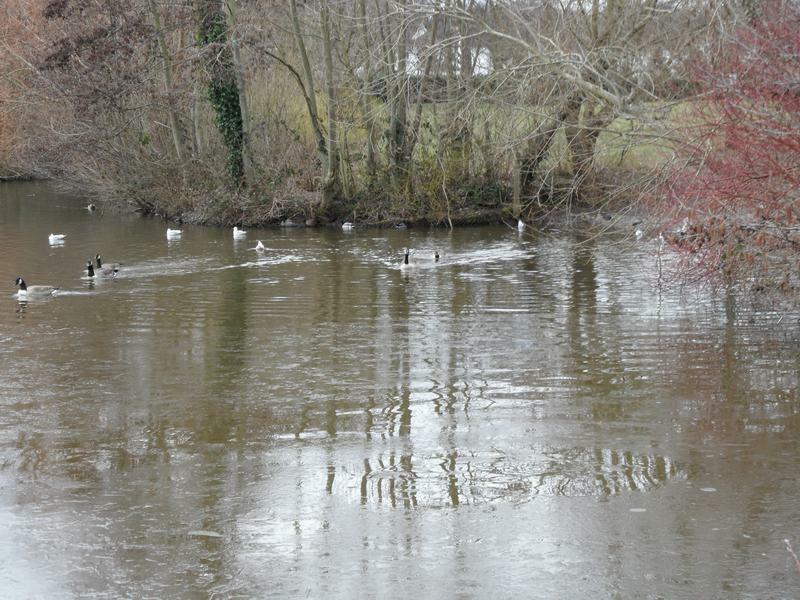 1st January 2014, heavy rain, ducks do not seem very hungry today although several heading our way.